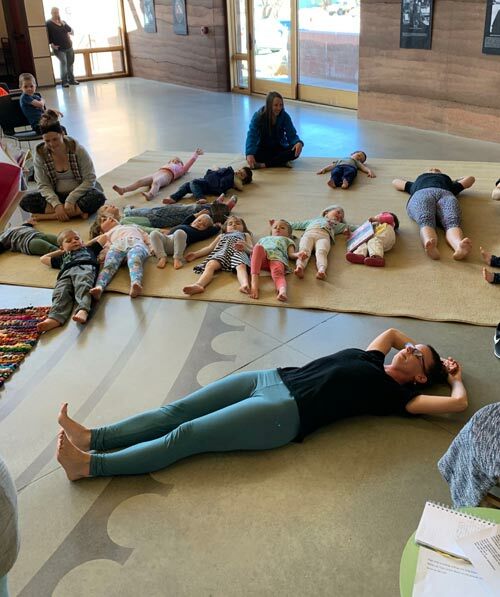 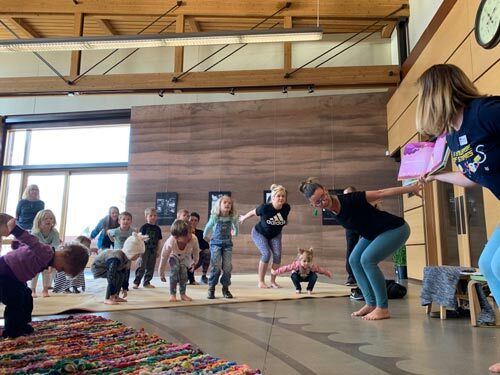 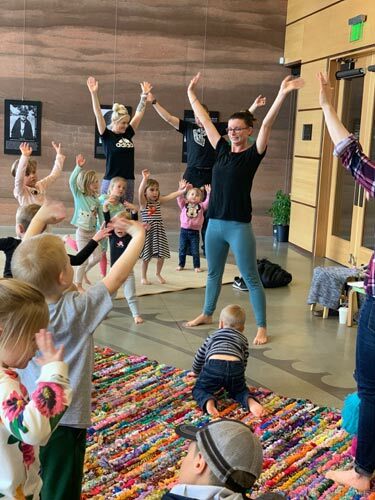 We had an amazing Storytime Yoga! 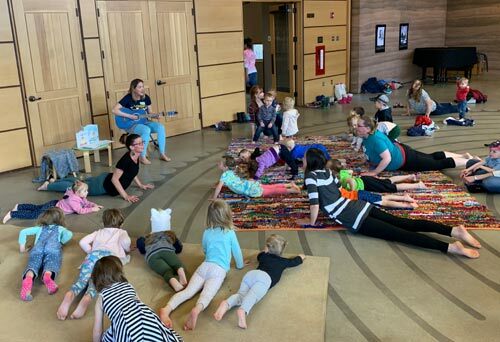 The kids arrived ready to take on anything but with poses and explanations from Ms. Jenn and books and songs from Ms. Michelle, they finished quiet and still. 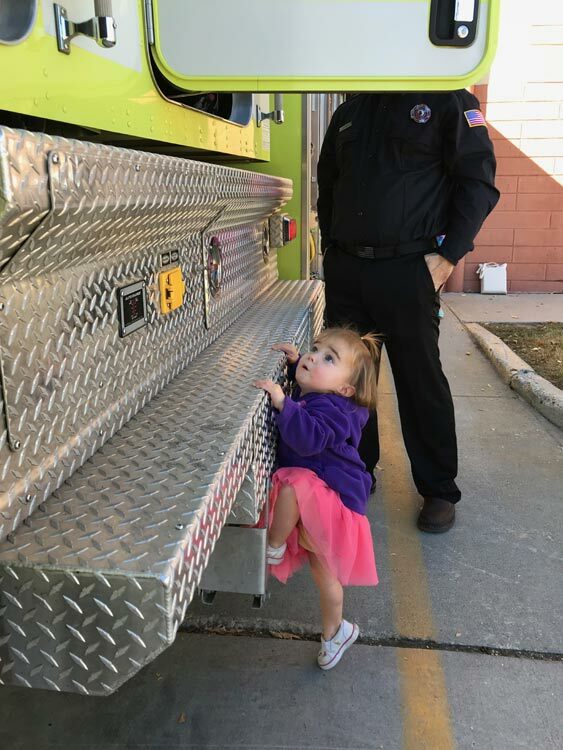 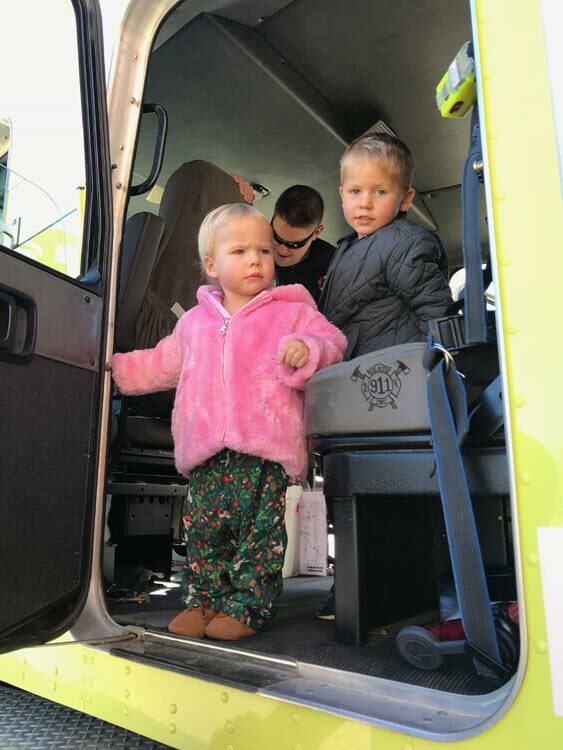 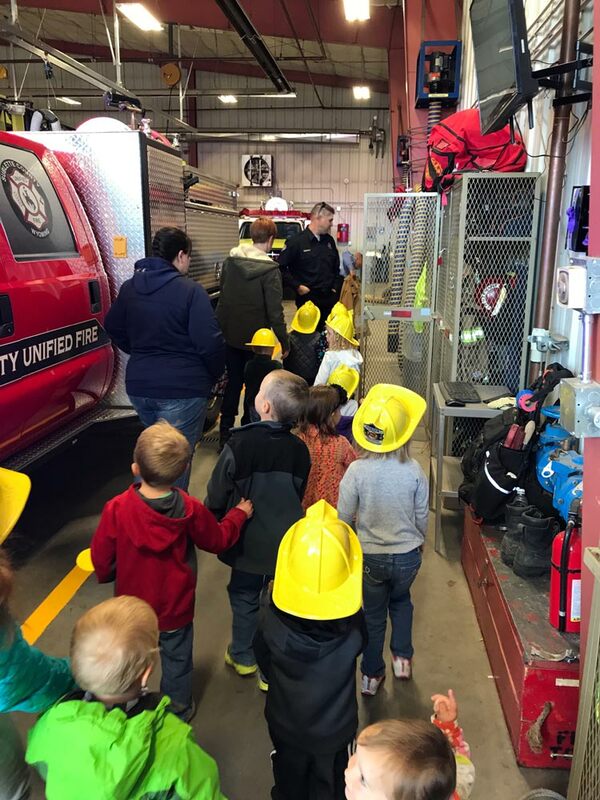 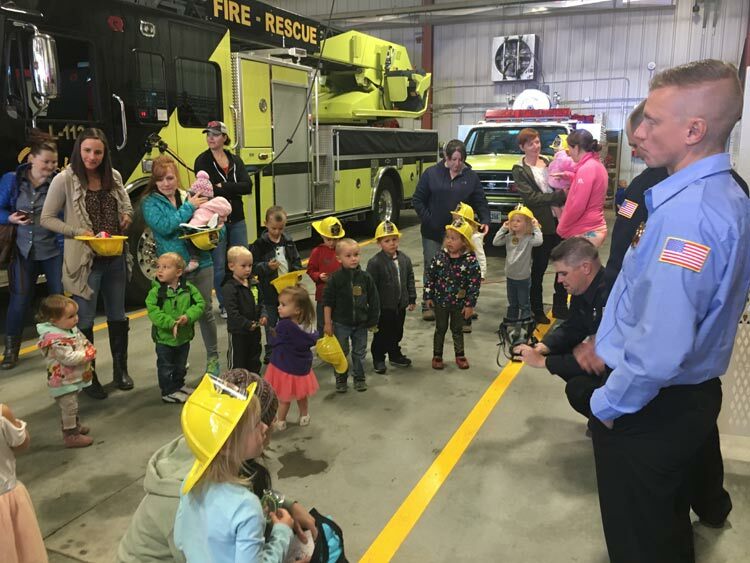 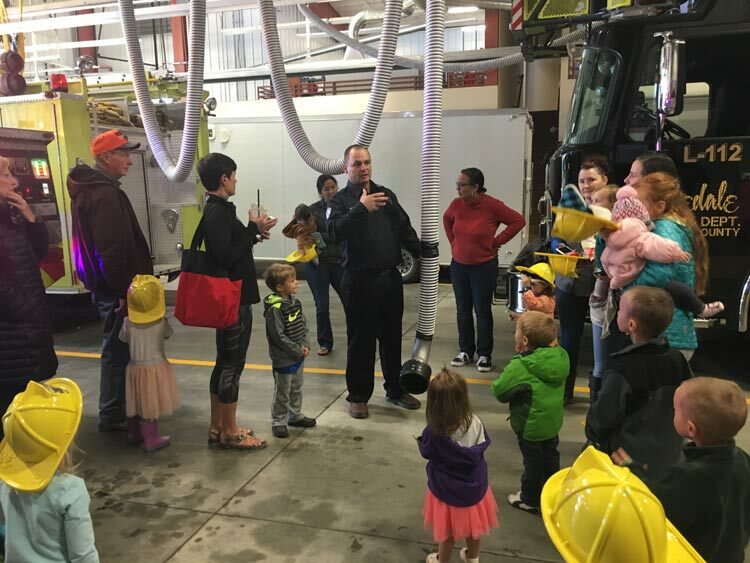 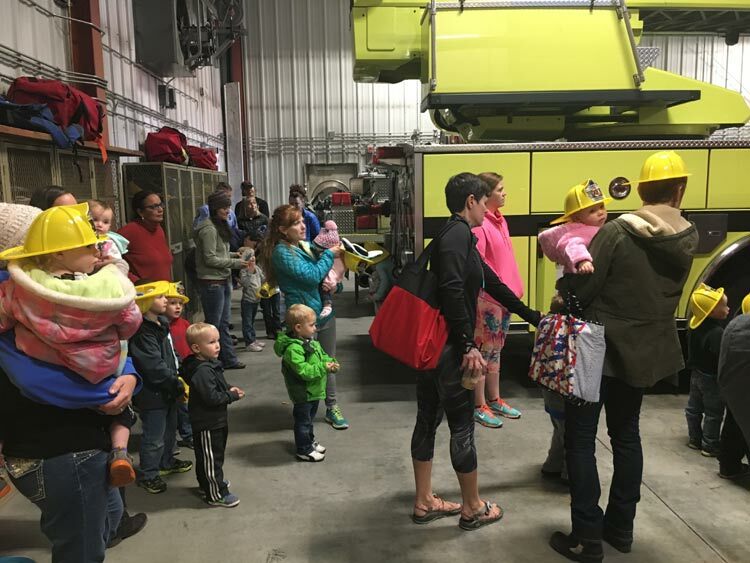 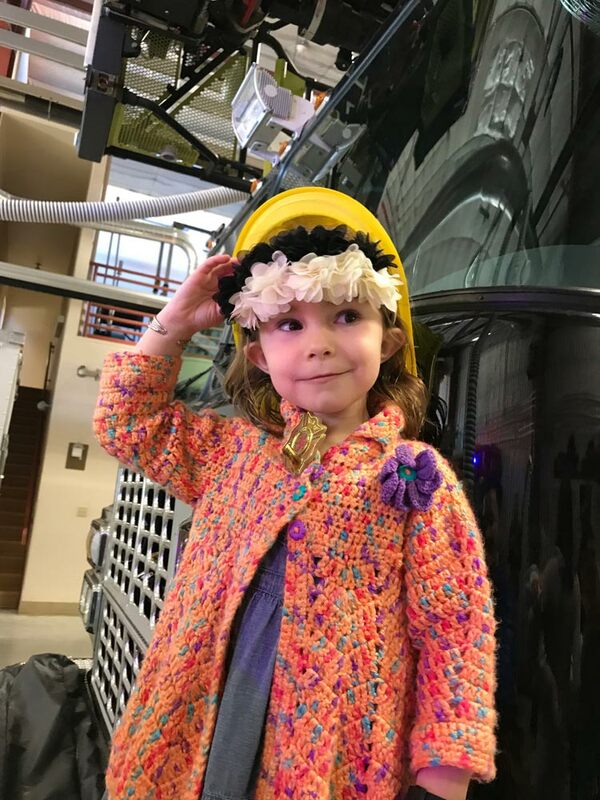 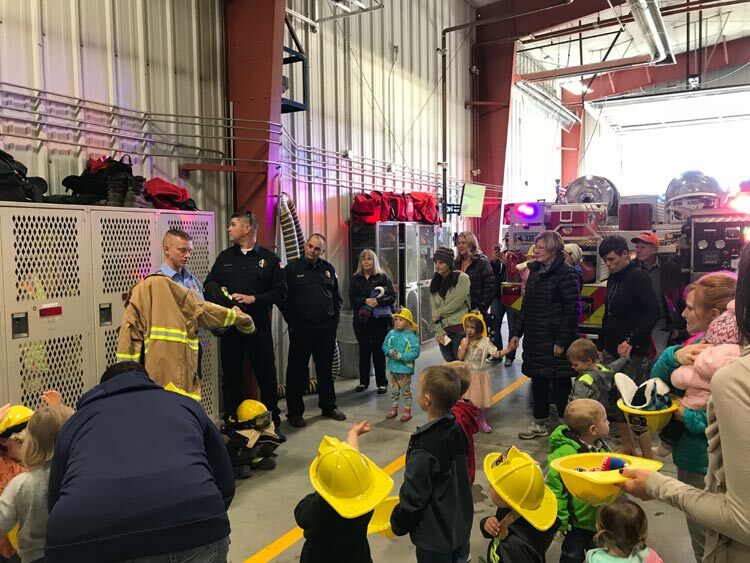 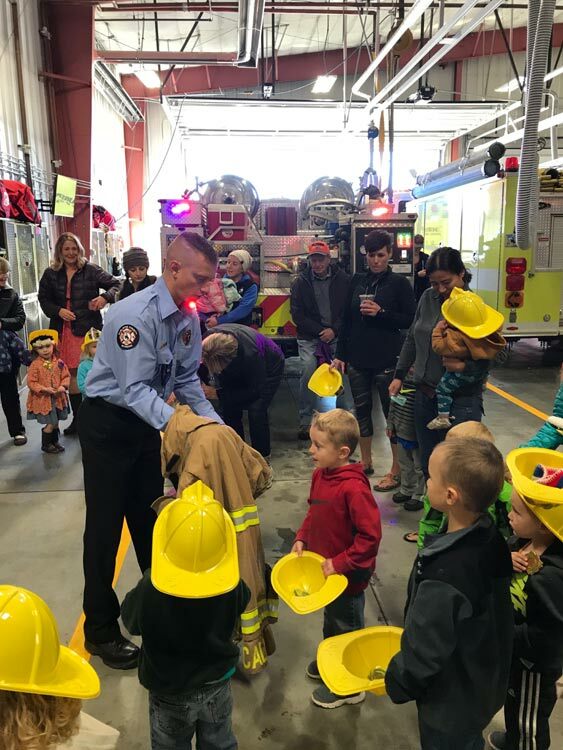 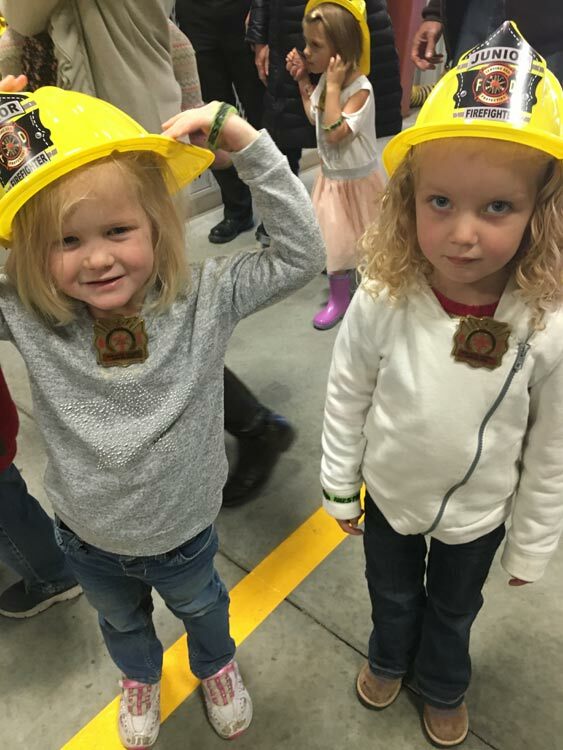 In October we enjoyed learning about firetrucks in both English and Spanish, and then strolled over to the firehouse to hear all about fire safety! 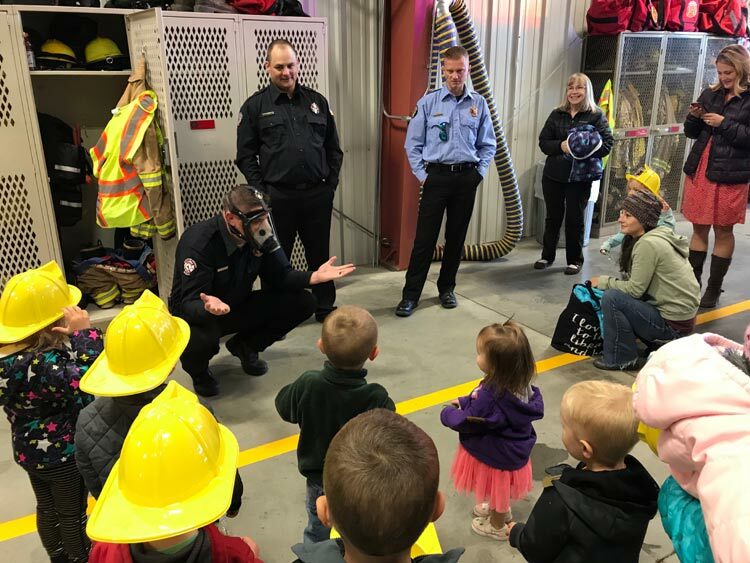 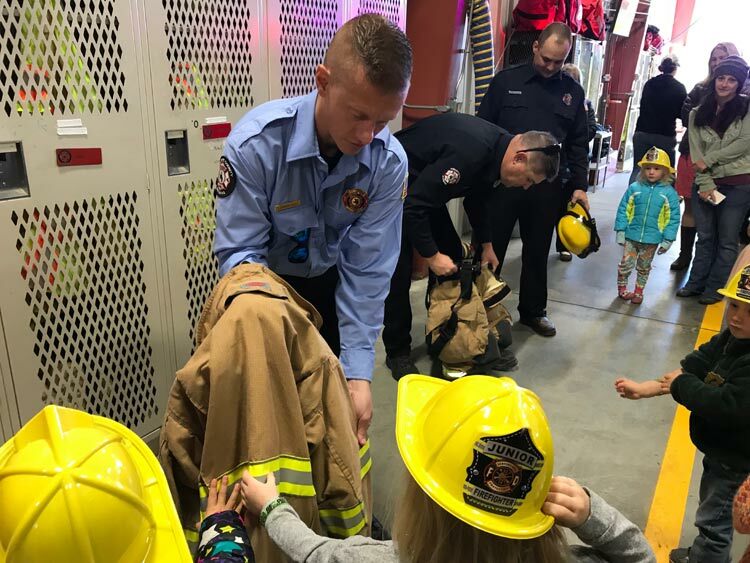 Thanks so much to the firefighters for their service to our community and for devoting their time to talk to the kids about what to do in the event of a fire, showing the kids the fire trucks and protective gear, and teaching them that firefighters are here to help! 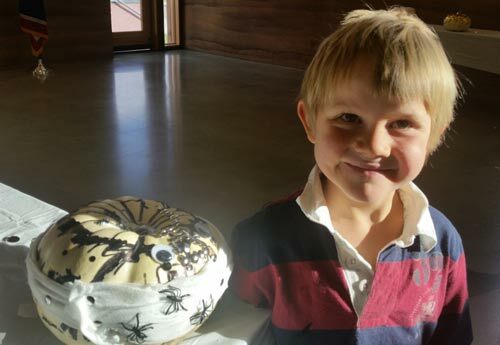 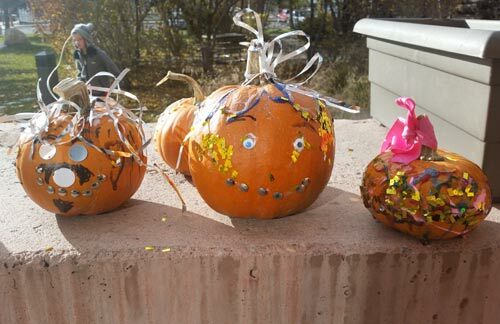 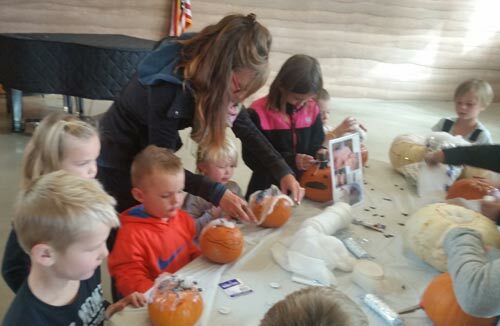 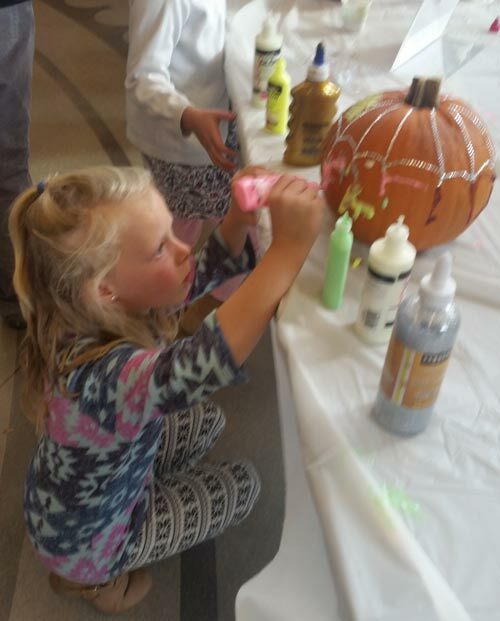 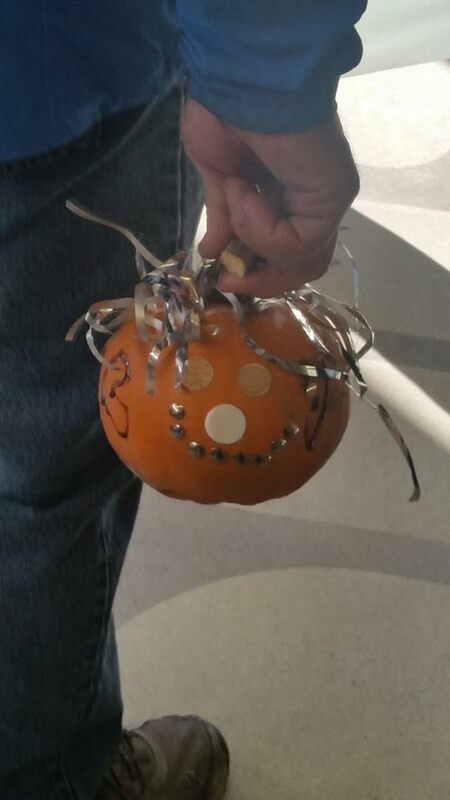 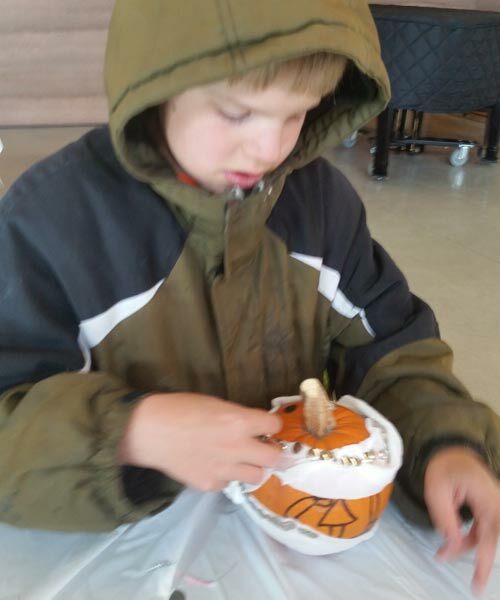 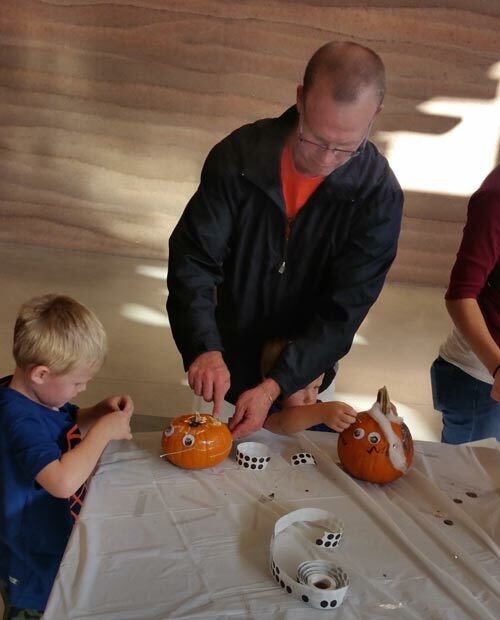 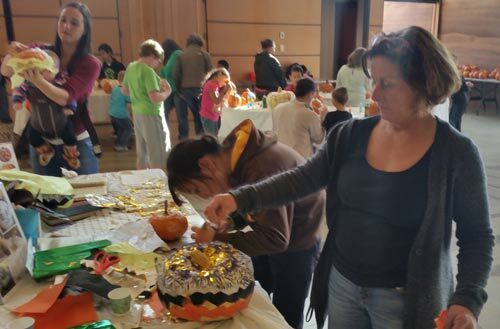 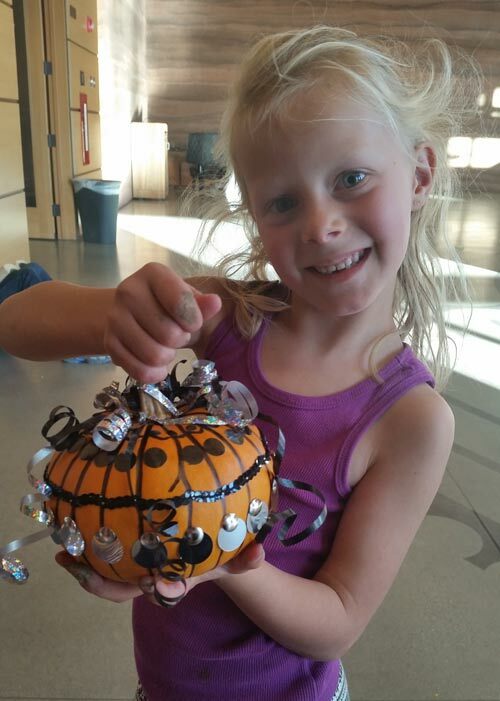 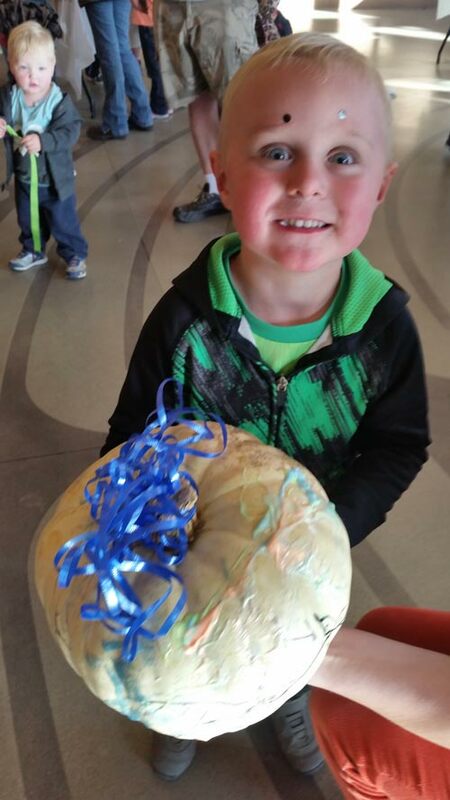 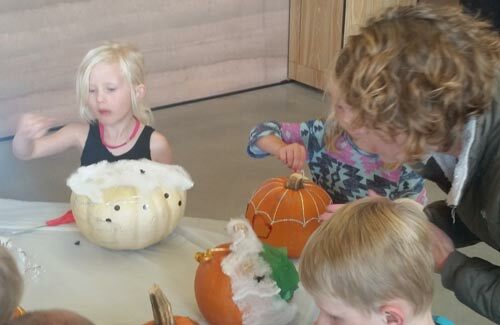 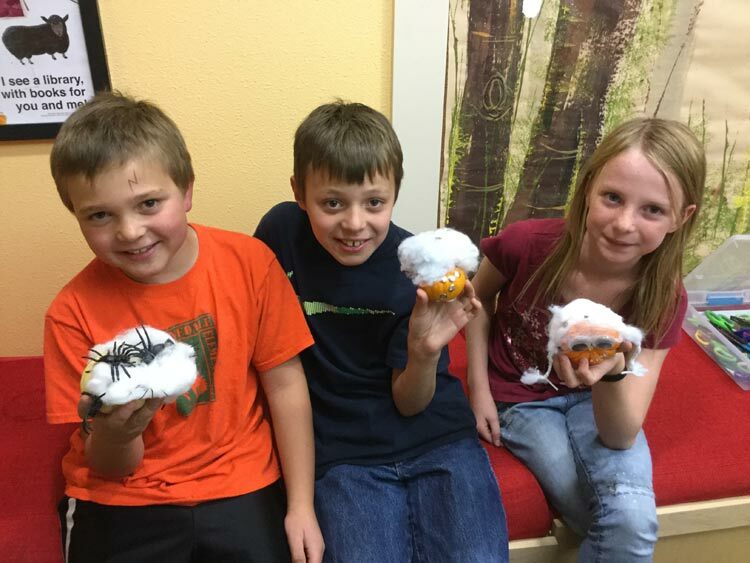 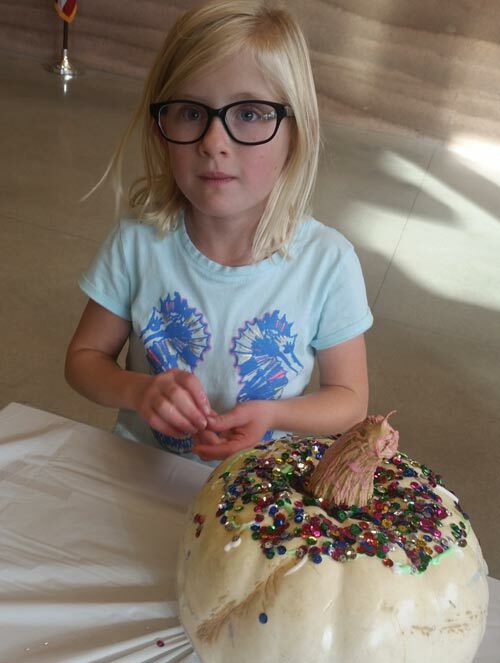 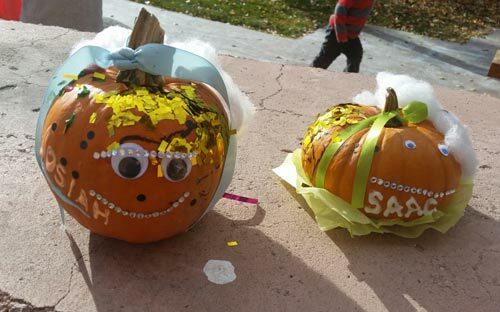 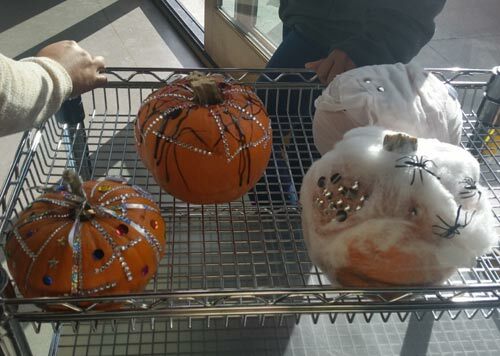 We had a great time at our recent No Carve Pumpkin Decorating event. 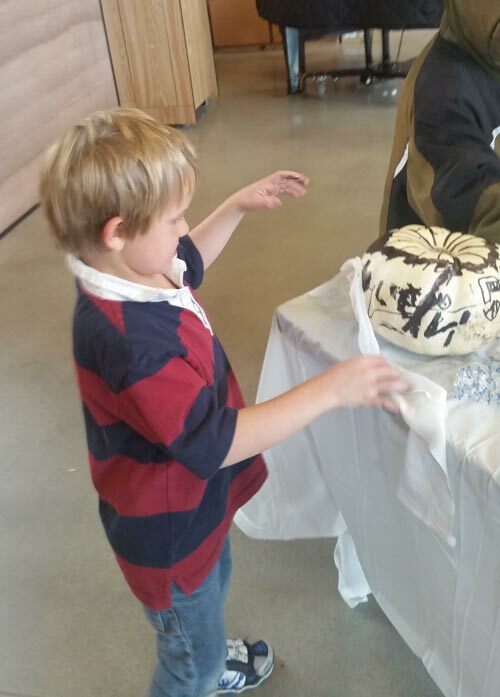 It was a blast to see all the creative designs. 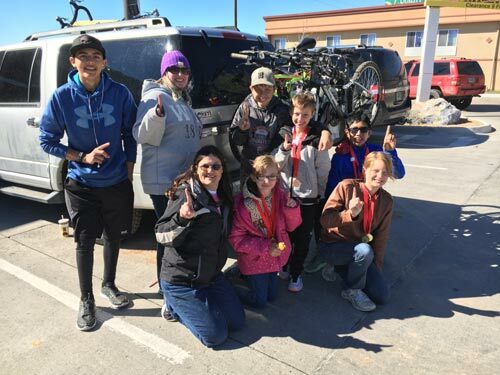 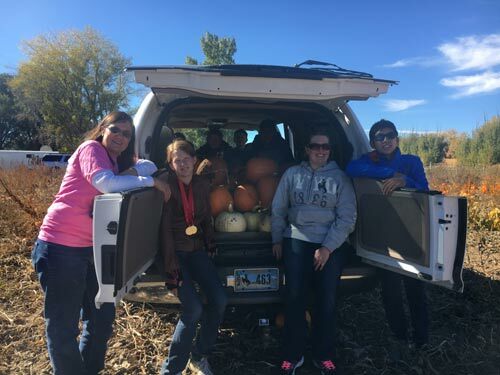 A special thanks to the folks from Sublette County Special Olympics for helping to gather our pumpkins from the pumpkin patch in Riverton... great job guys! 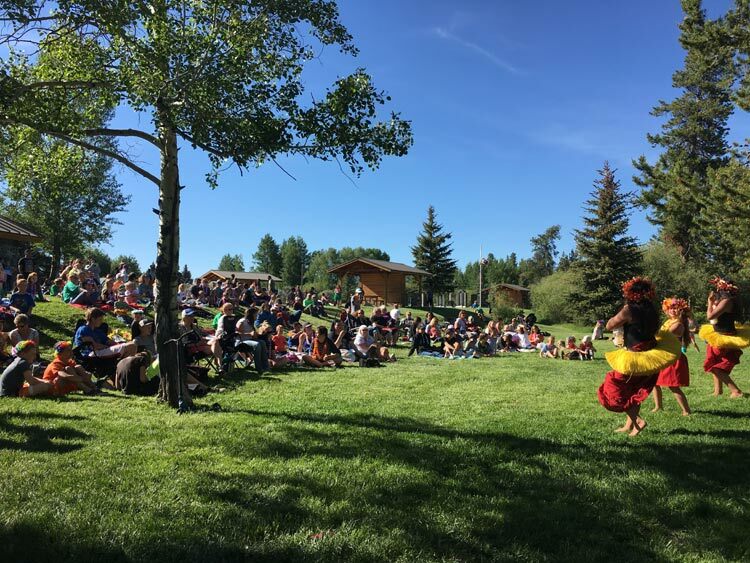 We had so much fun hosting the 2018 Renaissance Faire... medieval merriment and magic was everywhere! 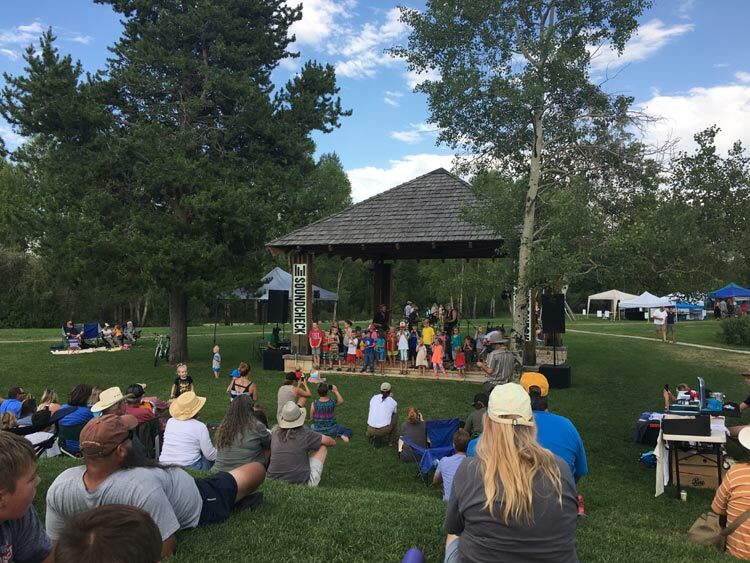 A heartfelt thank you to all who came from near and far to join us at the Faire, with a special thanks to our performers, demonstrators, vendors and volunteers who made the day a special one for everyone! 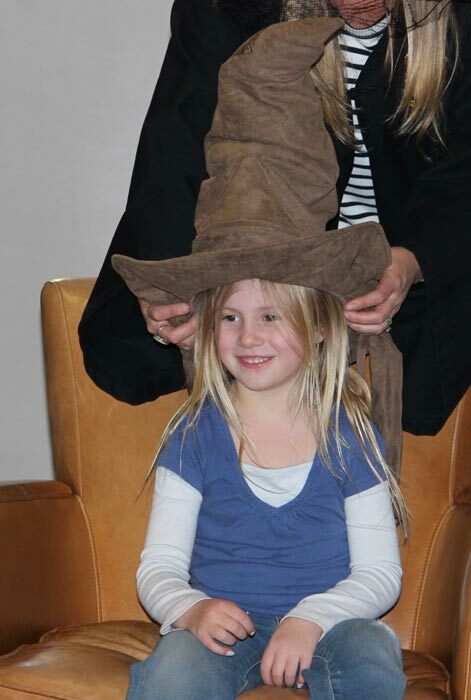 View our photo albums on Facebook. 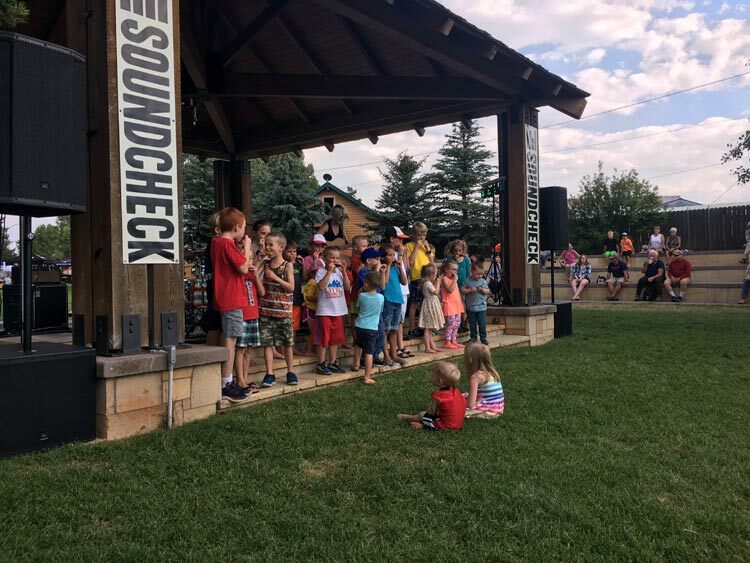 The kids did a great job playing their harmonicas at this summer's Soundcheck with the band Whipoorwill! 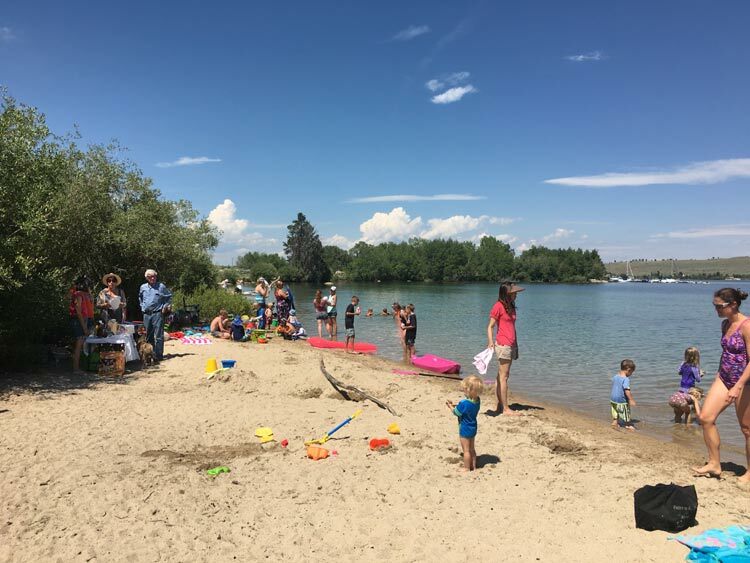 We had great beach weather for our annual beach party in July! 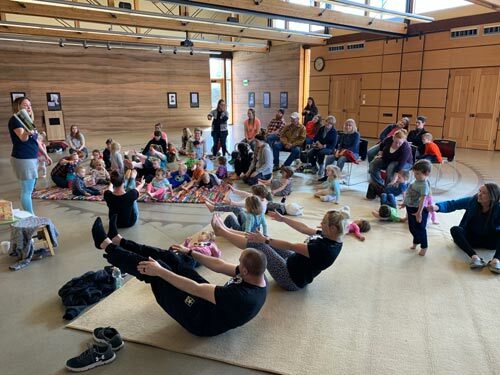 It was an afternoon of music, movement and fun as Frances from Rendezvous Dance and Cheer taught us the basics of tap dance and how to make our own homemade tap shoes. 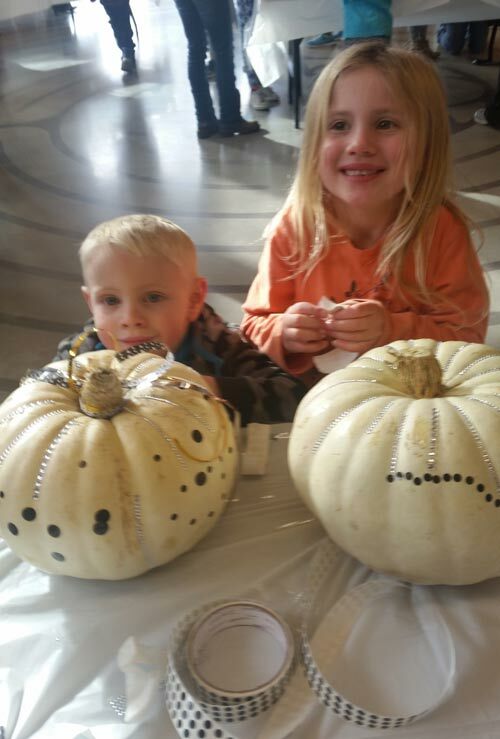 Photography donated by Camden Bennett, Realtor at Pinedale Properties Inc. and owner of Dream West Photography. 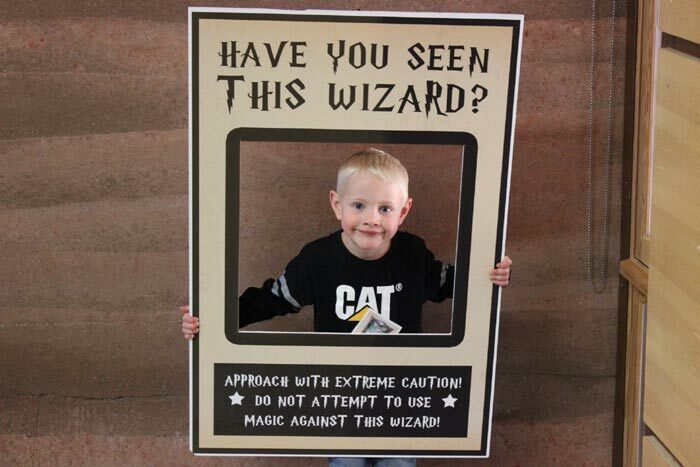 If you would like to download any of these photos, please contact Camden at c_benn@yahoo.com. 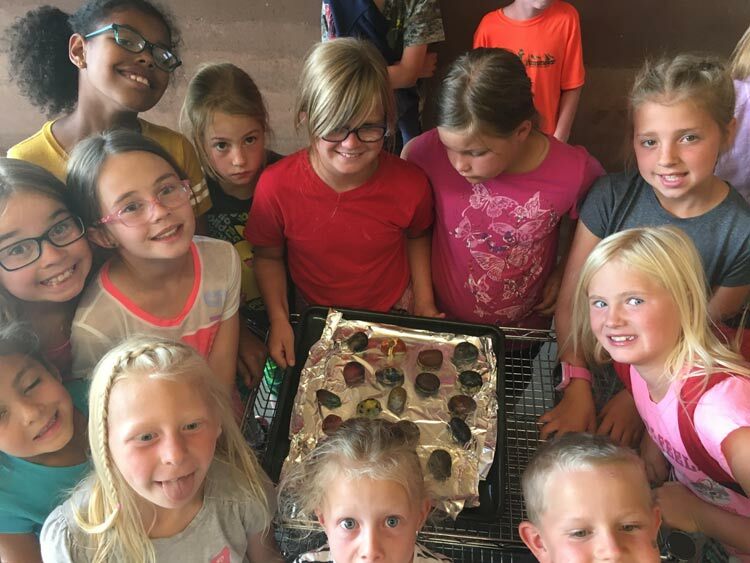 Our Geology Rocks! 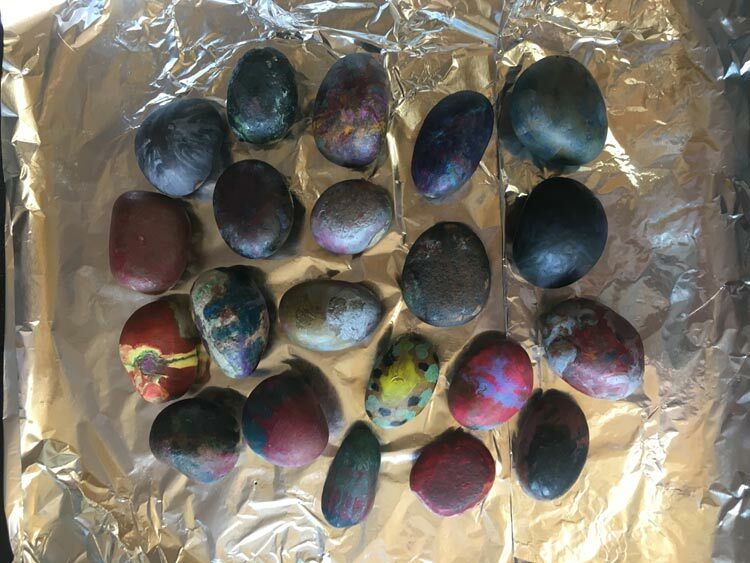 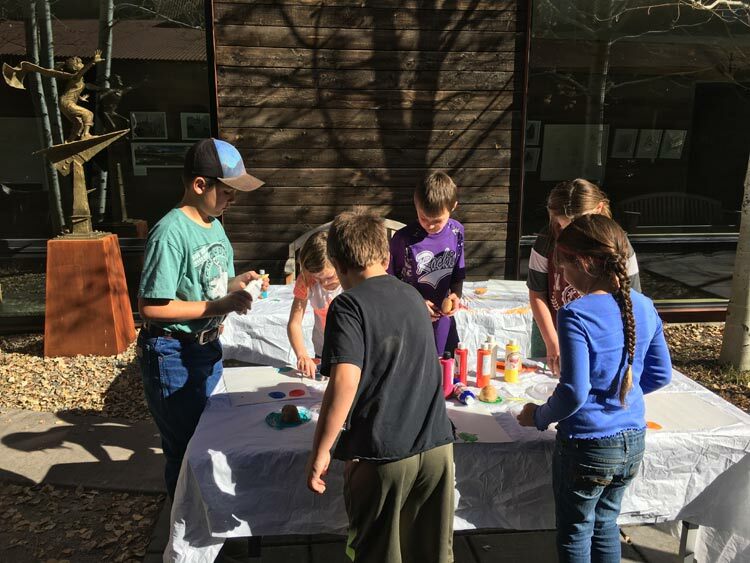 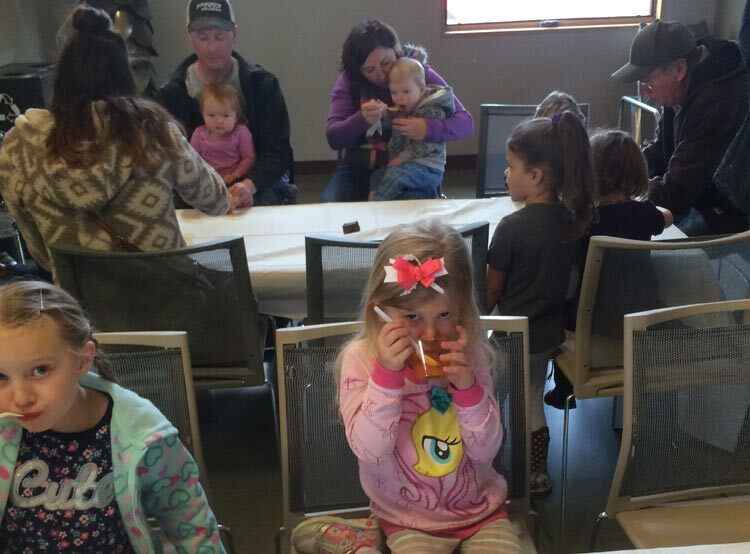 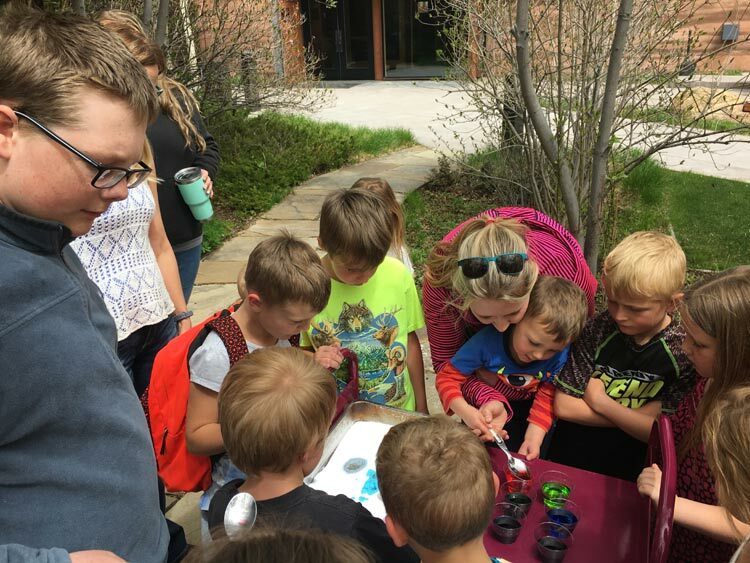 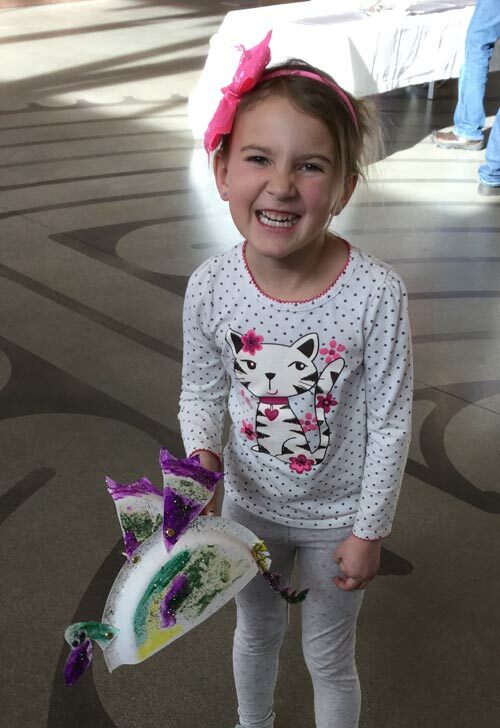 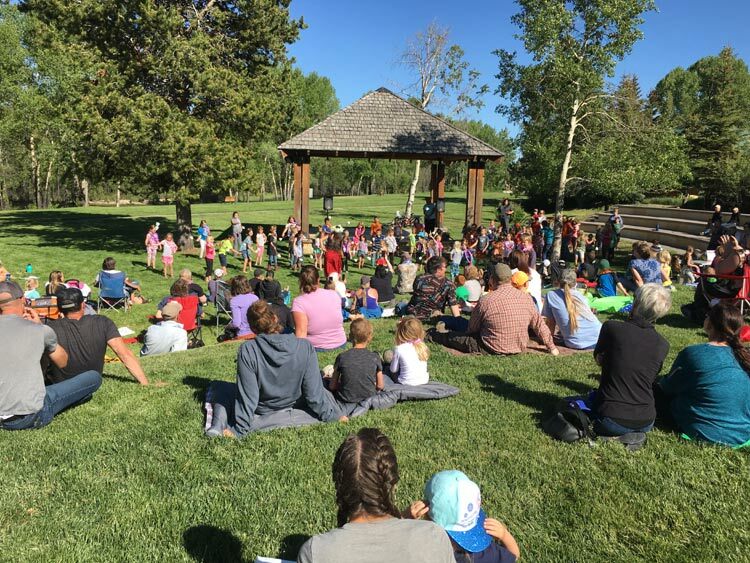 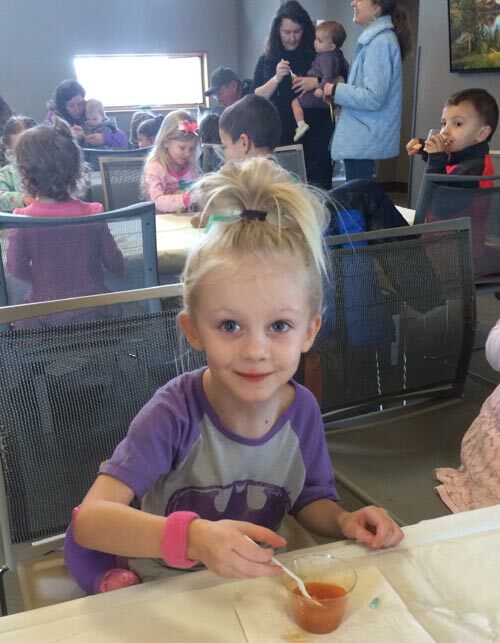 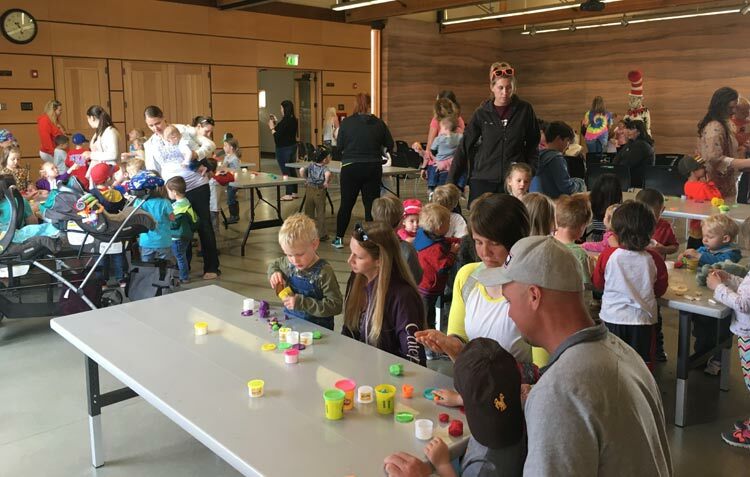 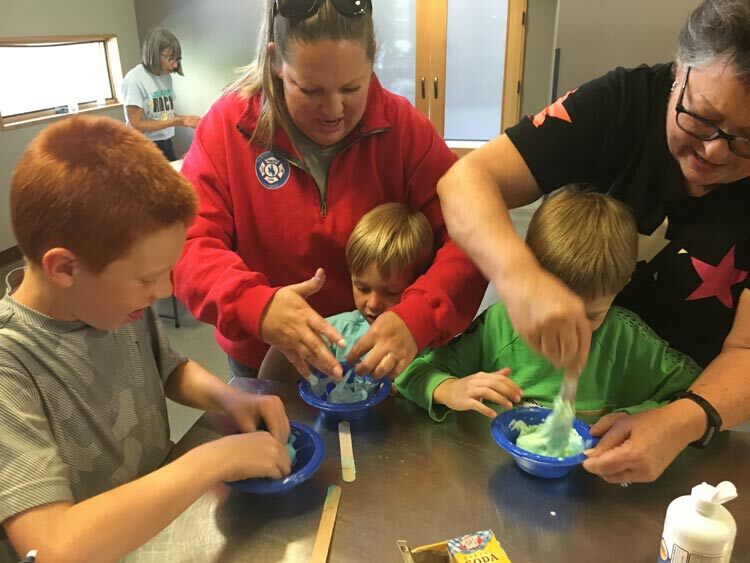 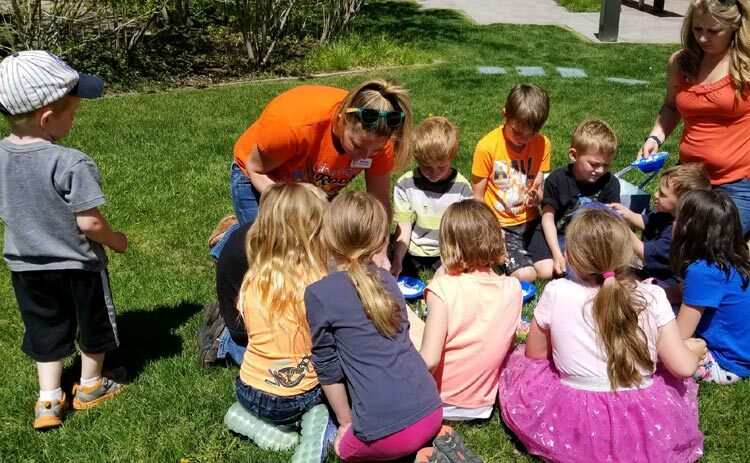 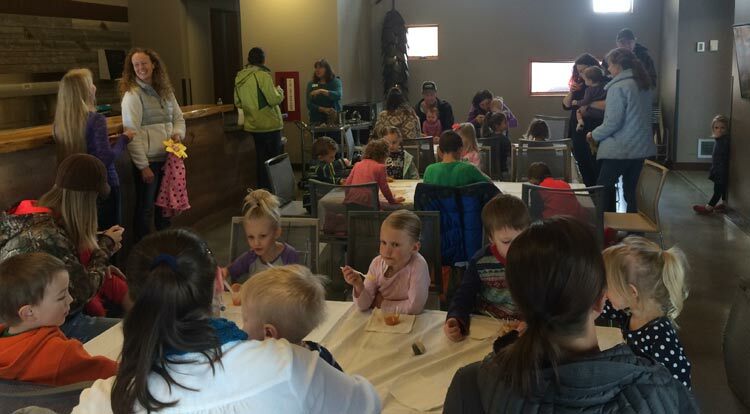 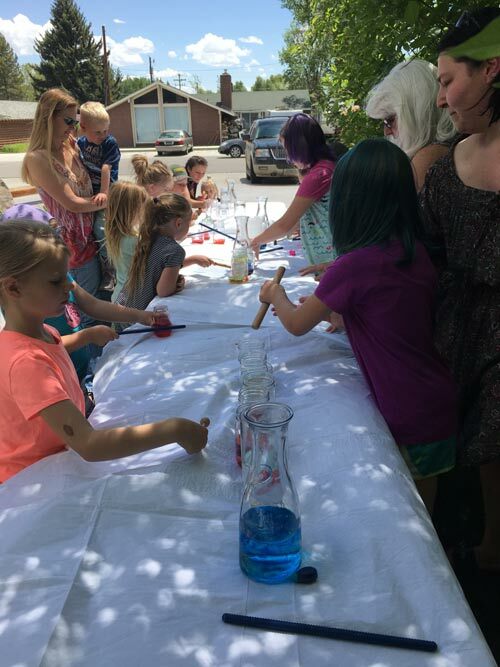 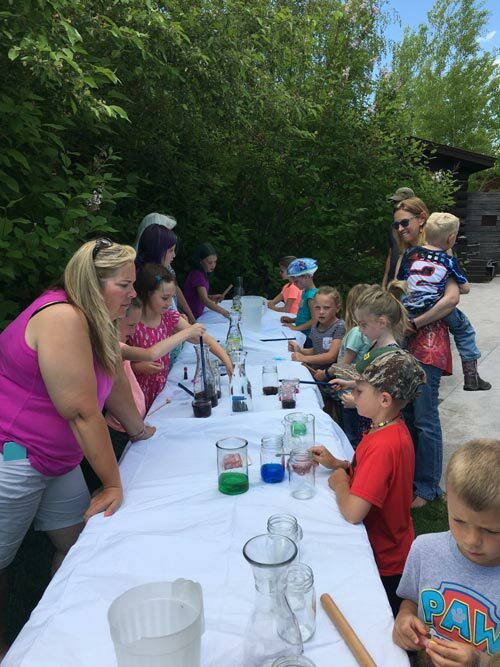 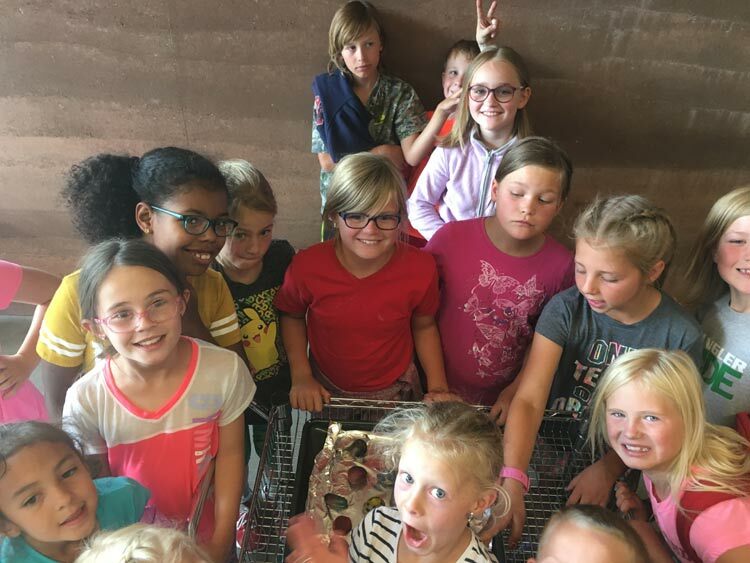 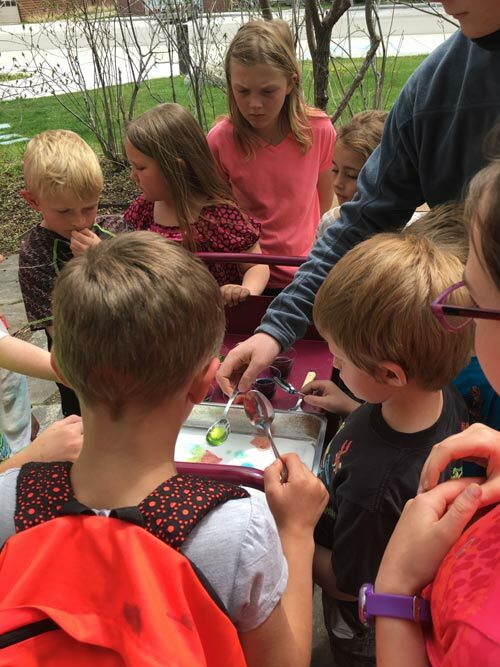 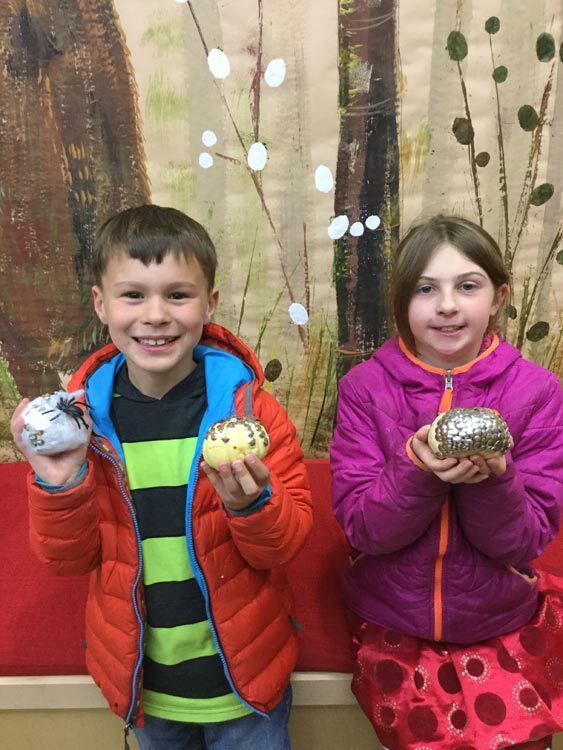 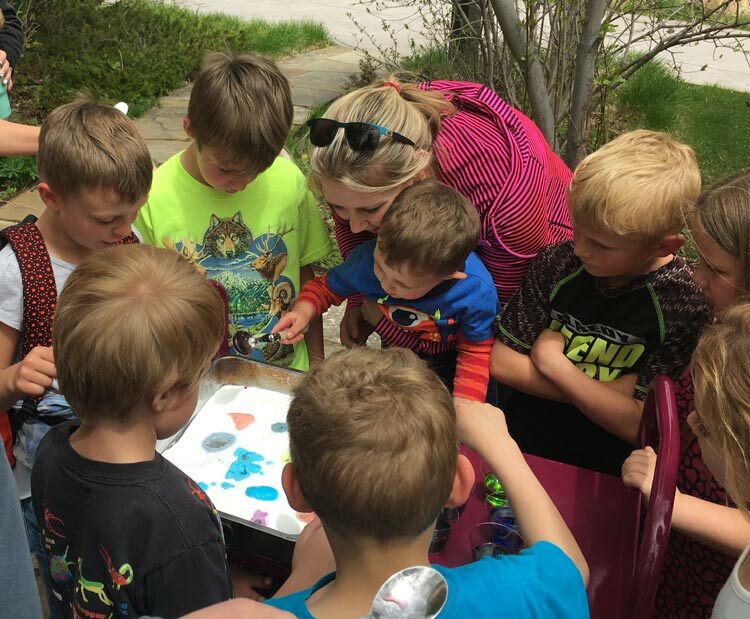 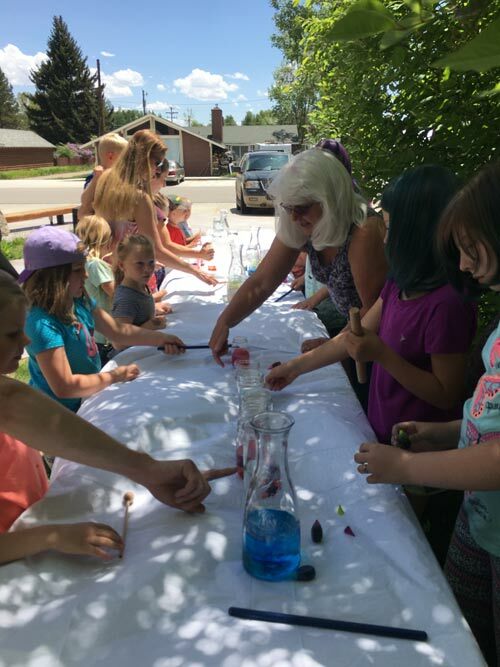 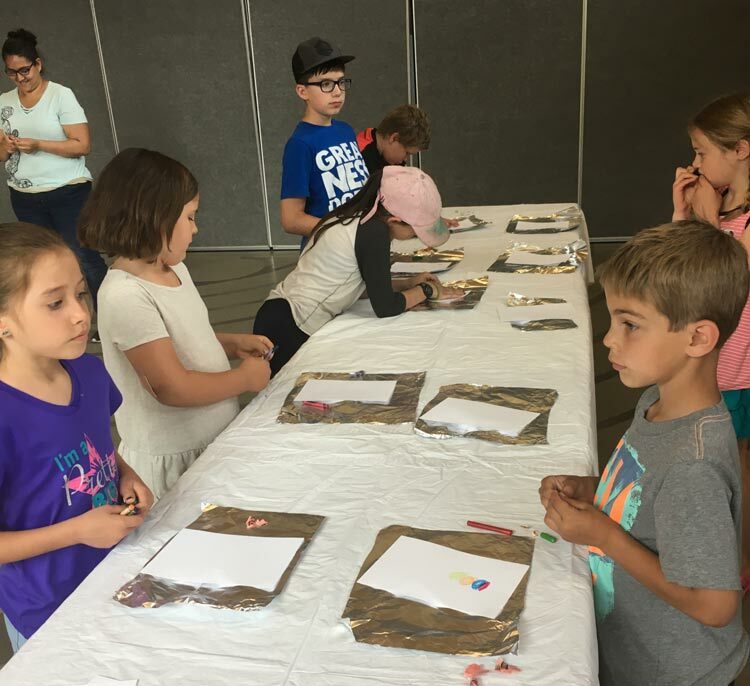 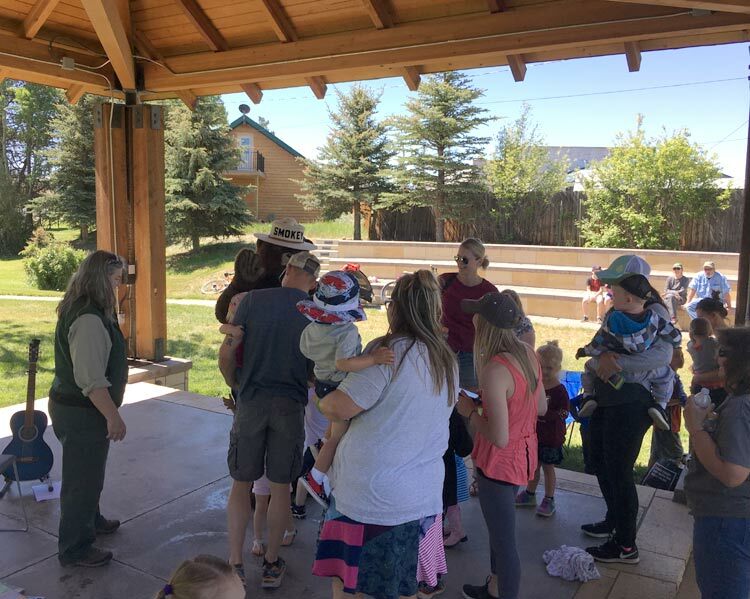 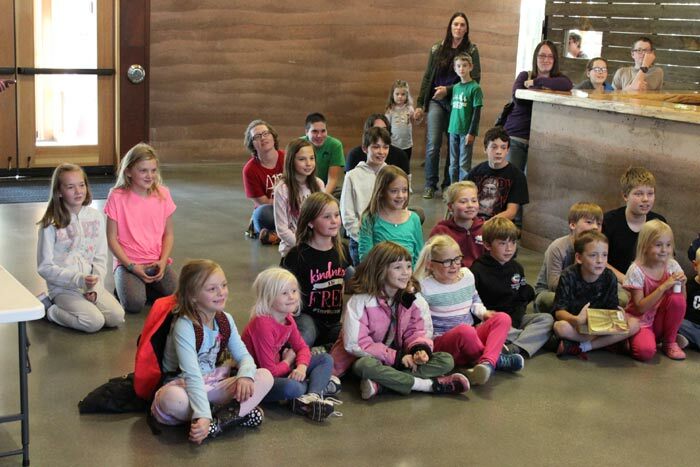 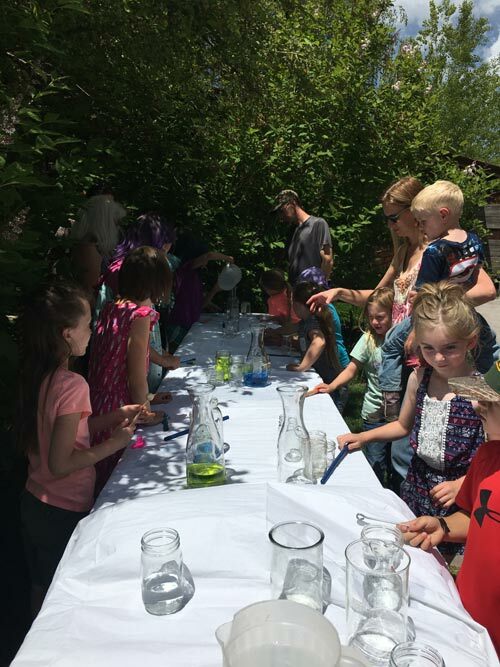 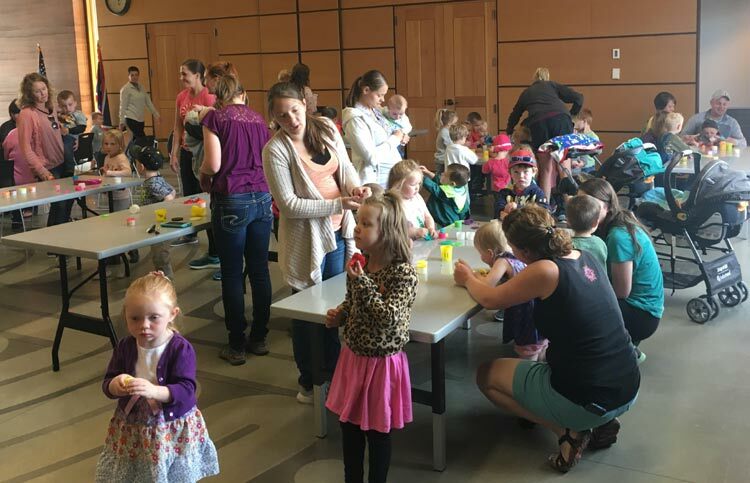 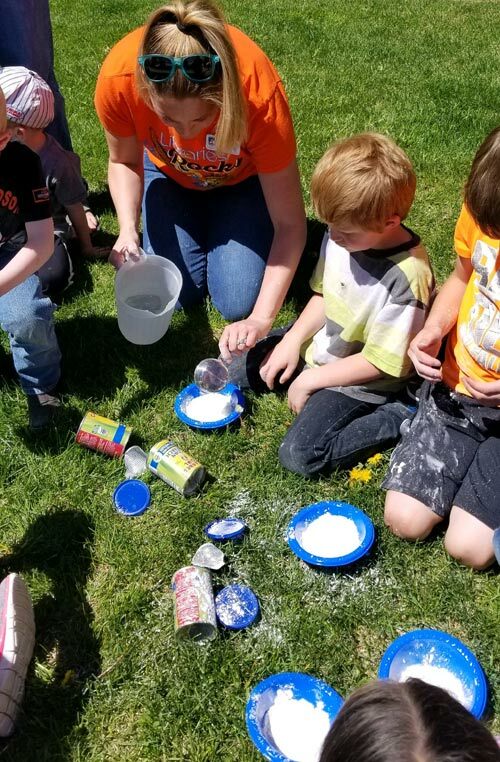 program was a hit as kids of all ages came out to see a presentation by geologist Dottie Bentley and science teacher Elaine Crumpley, explore Wyoming rocks and fossils, and did some fun rock painting. 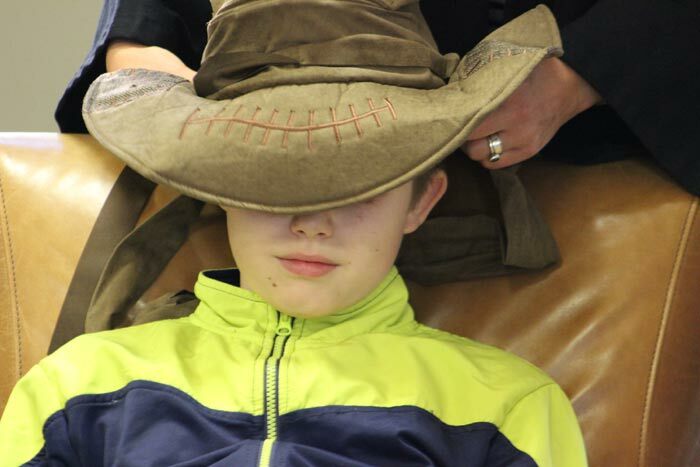 Photography donated by Camden Bennett, Realtor at Pinedale Properties Inc. and owner of Dream West Photography. 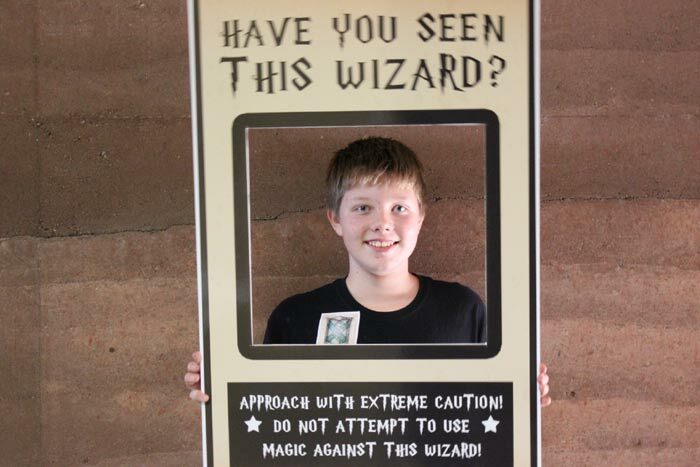 If you would like to download any of these photos, please contact Camden at c_benn@yahoo.com. 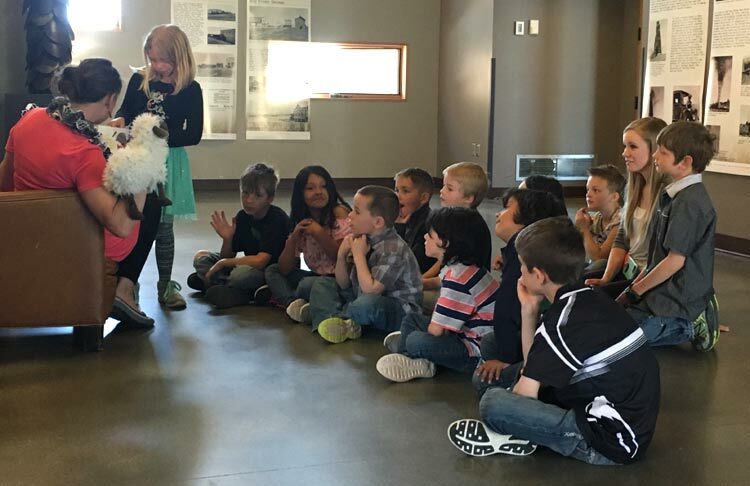 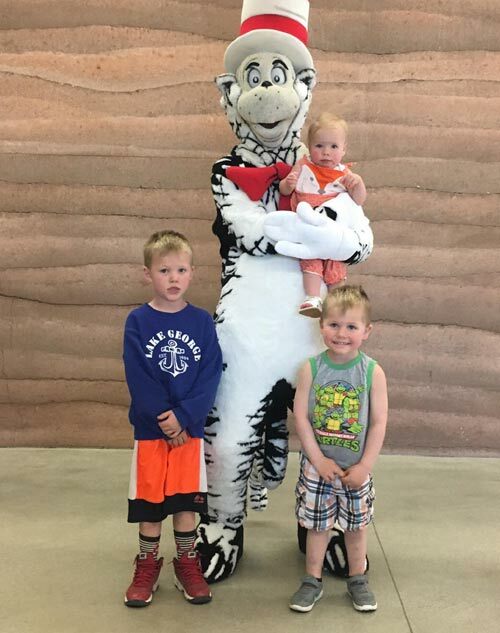 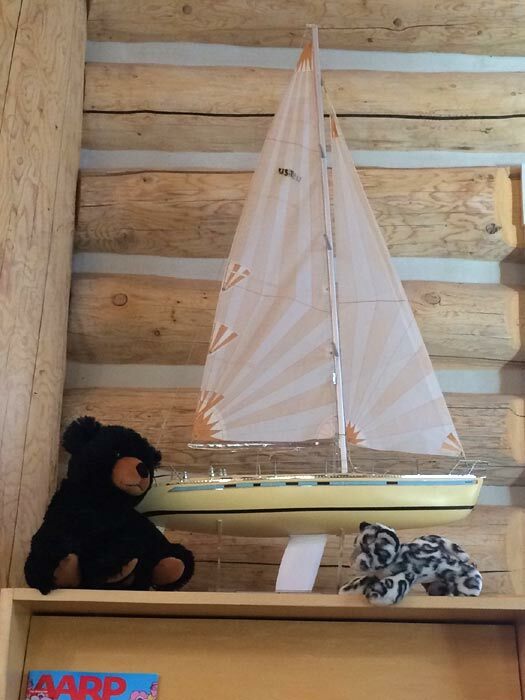 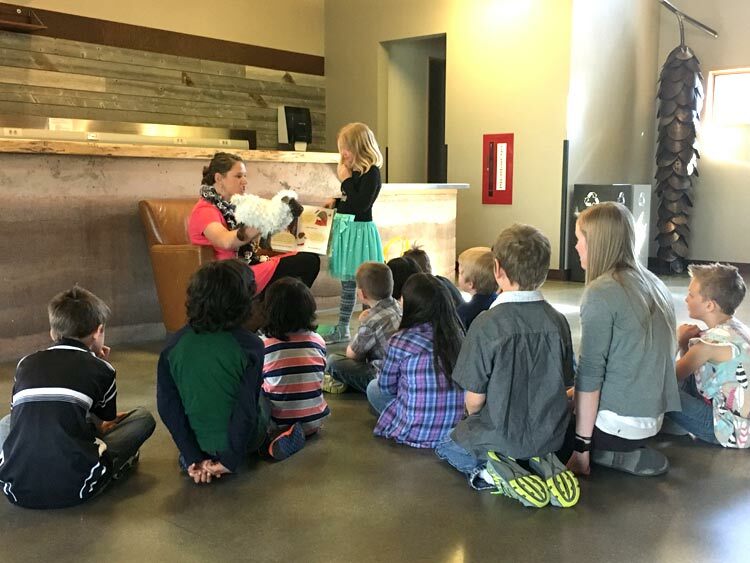 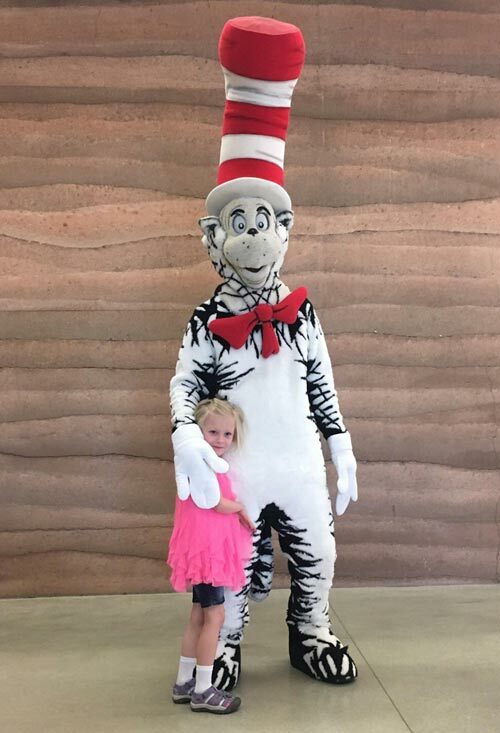 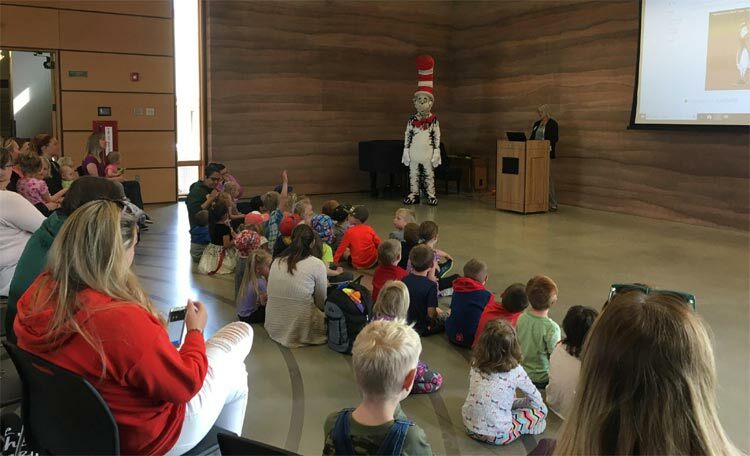 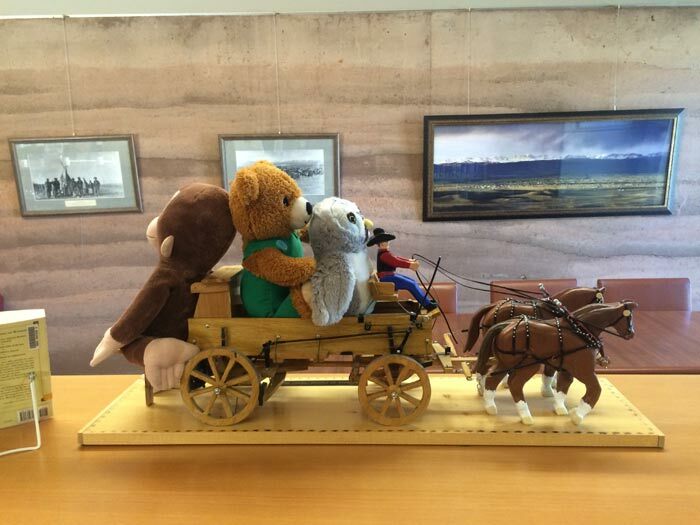 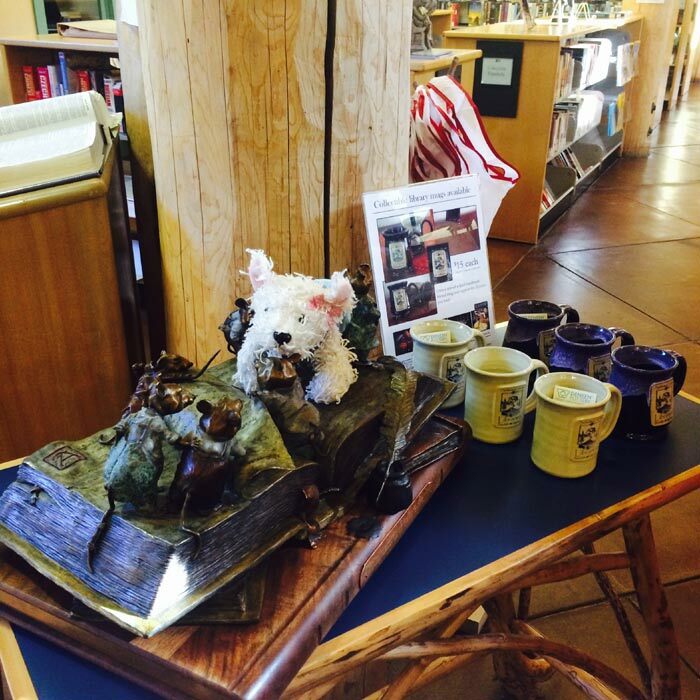 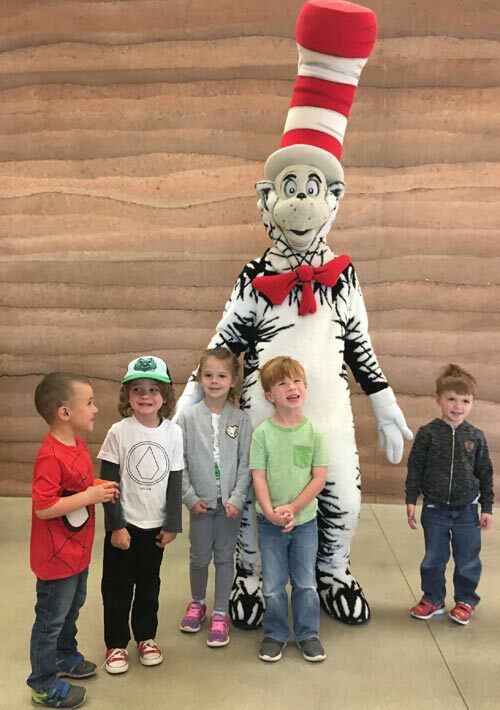 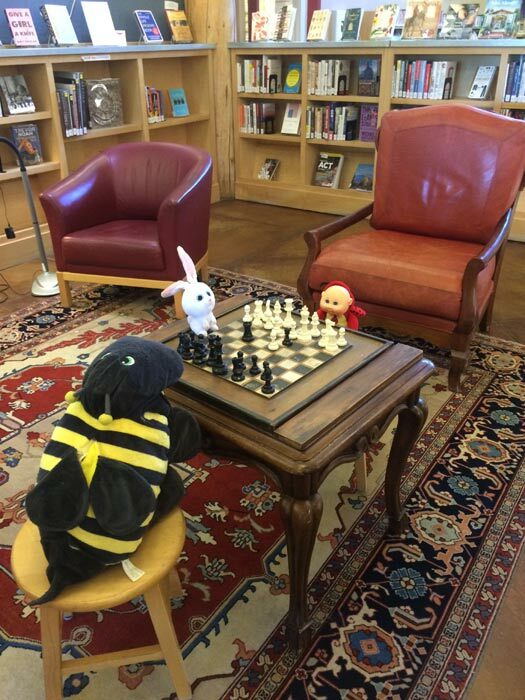 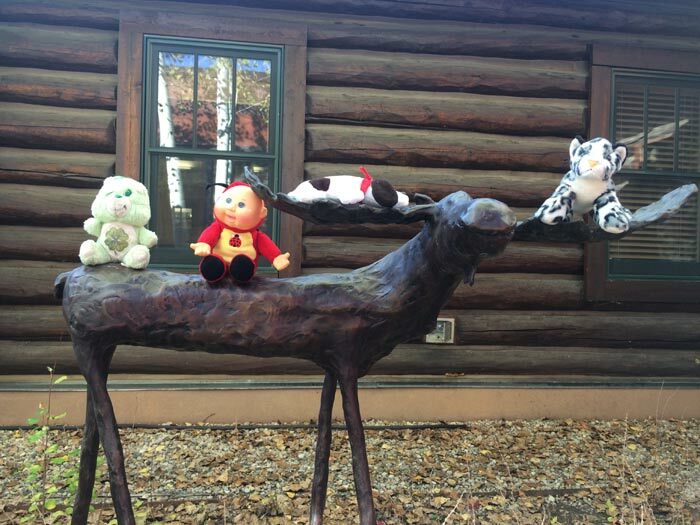 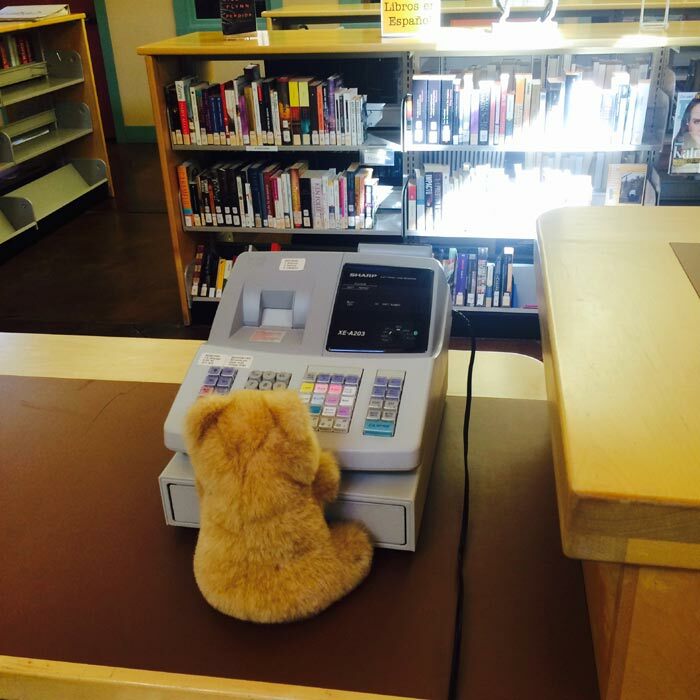 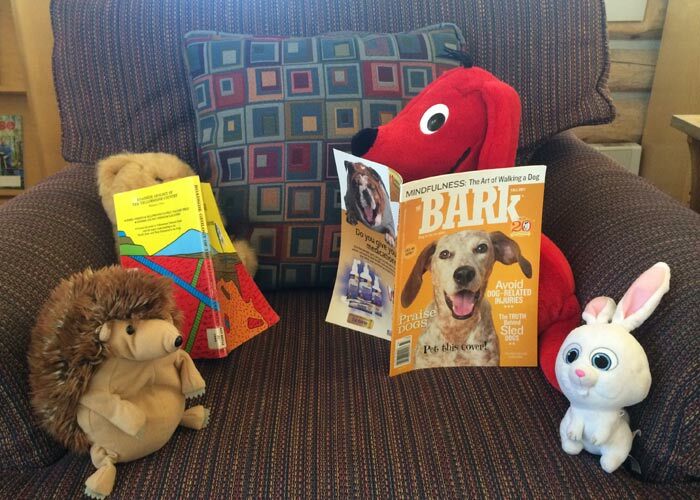 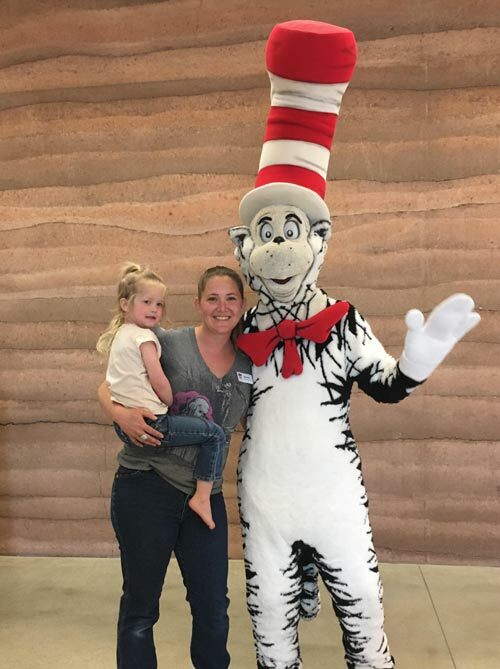 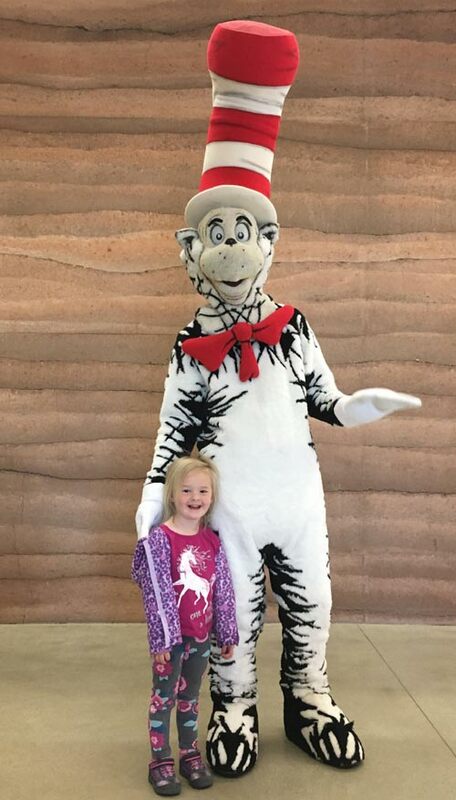 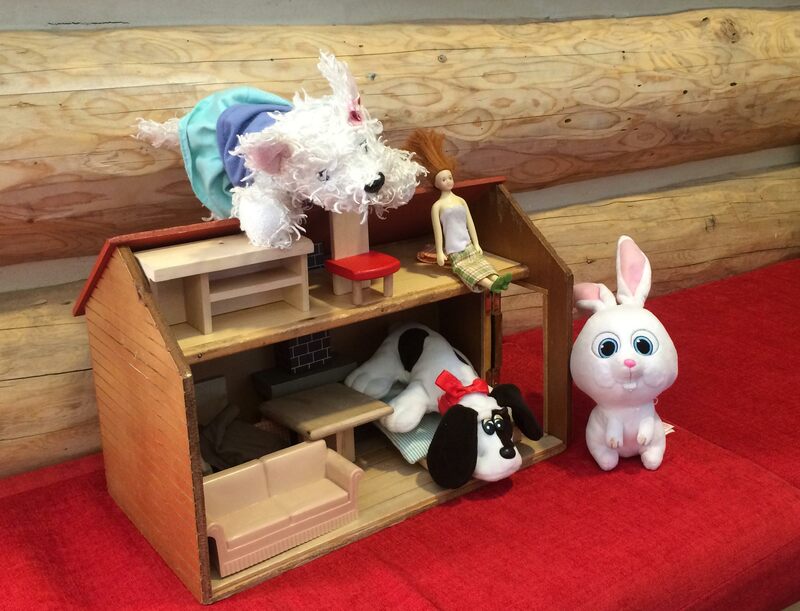 We recently received a visit from the folks at Wyoming PBS and The Cat himself! 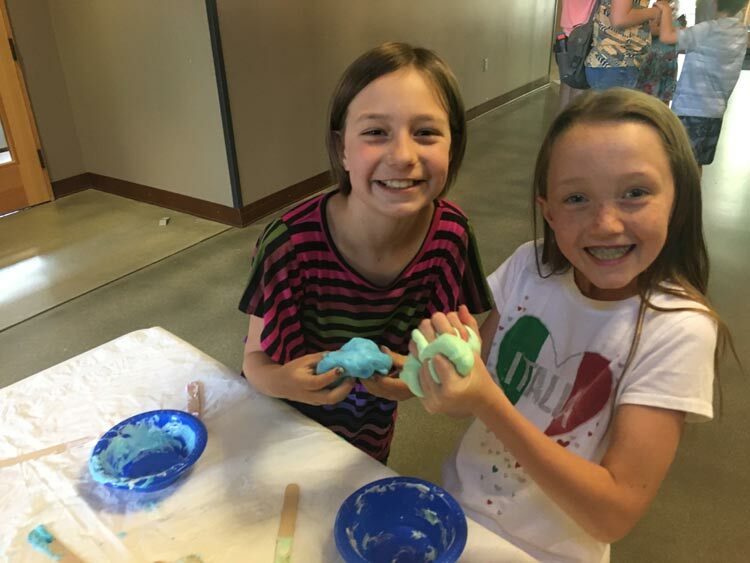 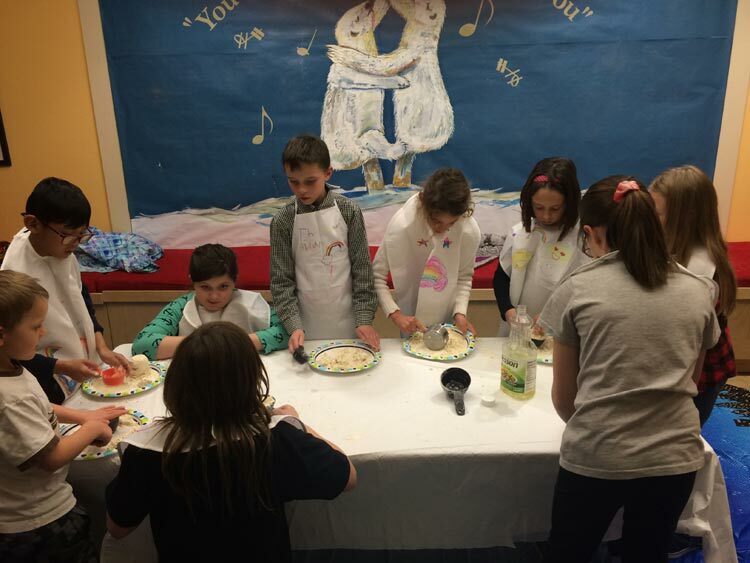 Parents learned about WYPBS learning resources and kids enjoyed a play dough activity. 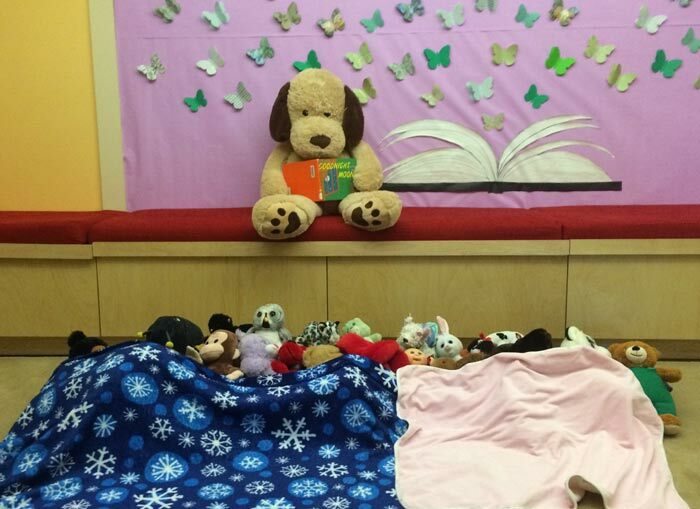 We've had a great time celebrating books and learning at our January Storytimes. 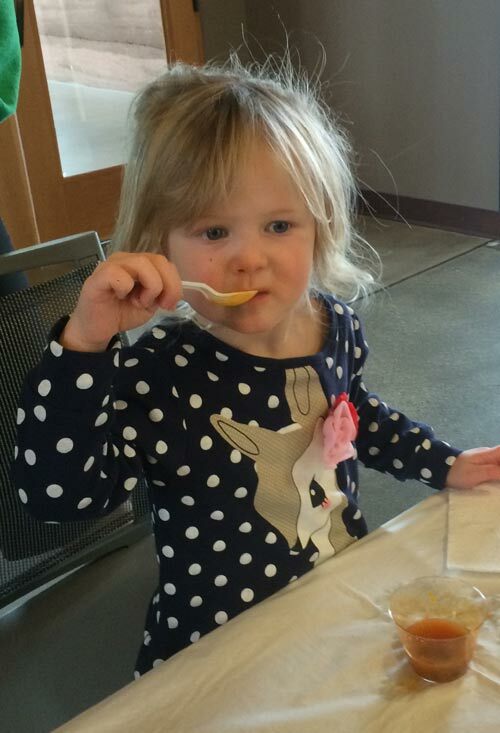 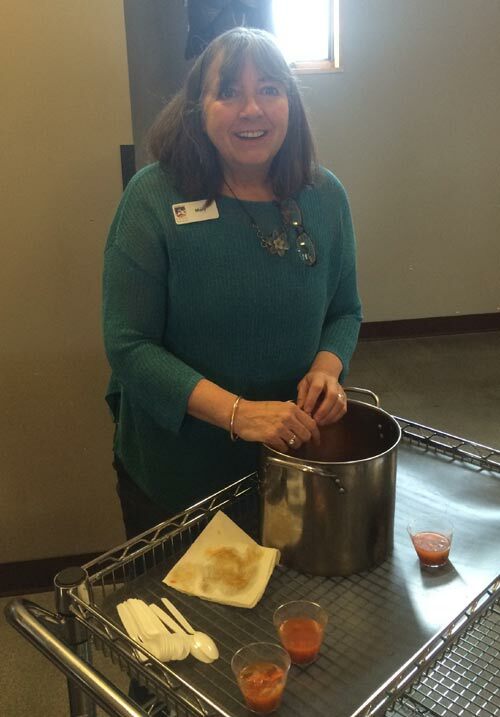 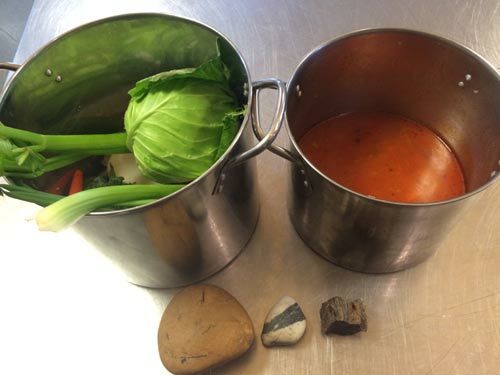 We learned that just about every body loves dragons and we had a wonderful time at our Stone Soup Storytime — everyone brought a vegetable for the pot and library staff member (resident foodie) Mary Thompson cooked us up a delicious soup enjoyed by all on cold winter's day. 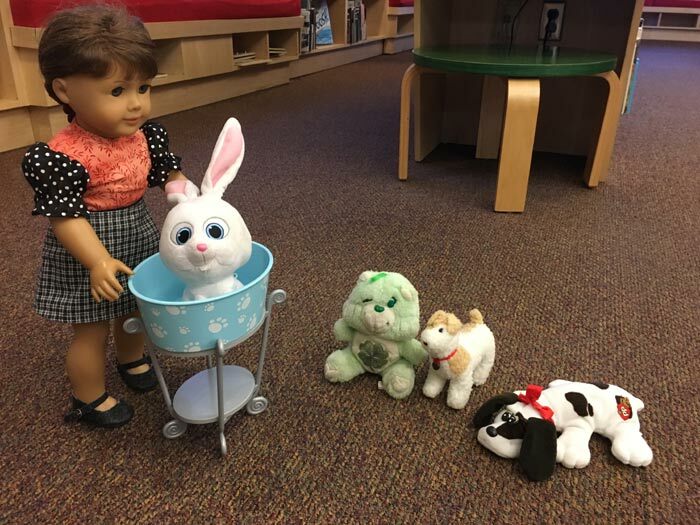 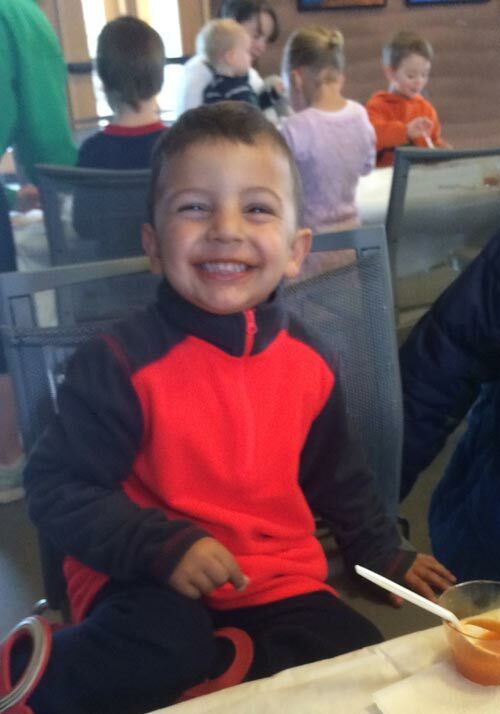 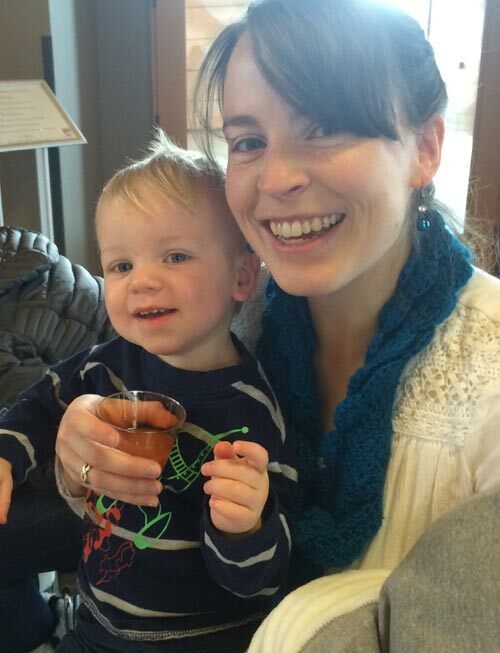 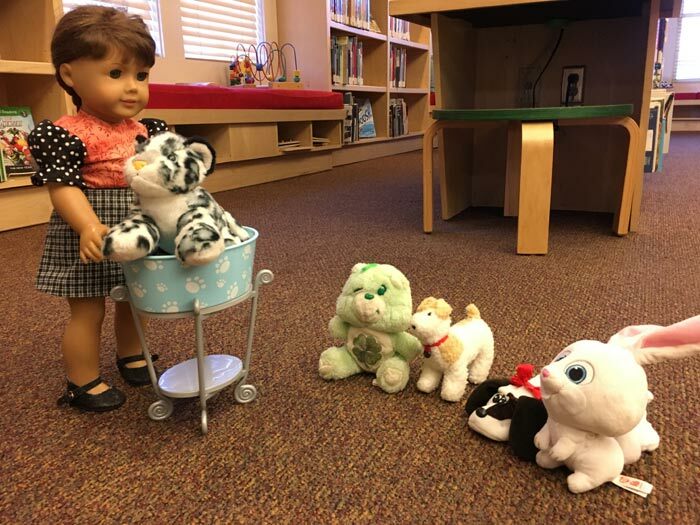 Dont miss our Baby and Me on Wednesdays at 10:30 am and our Preschool Storytime on Wednesday at 11 am. 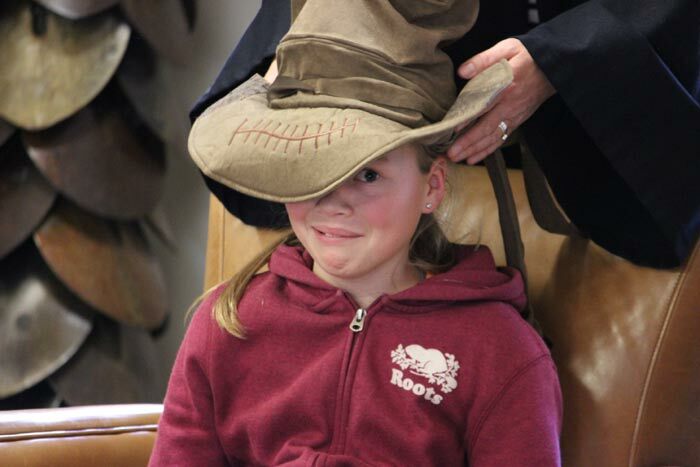 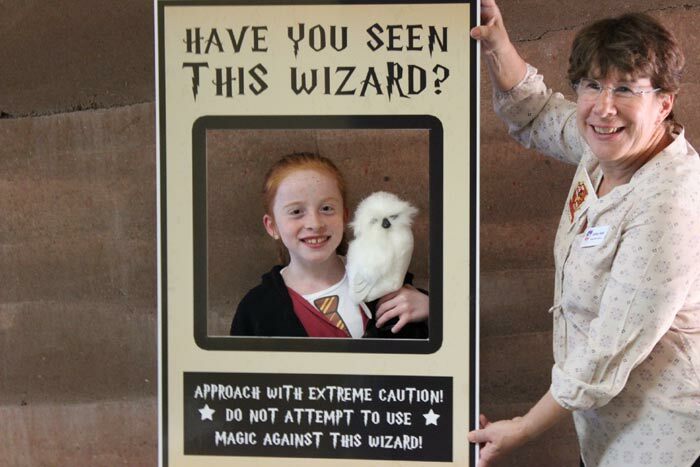 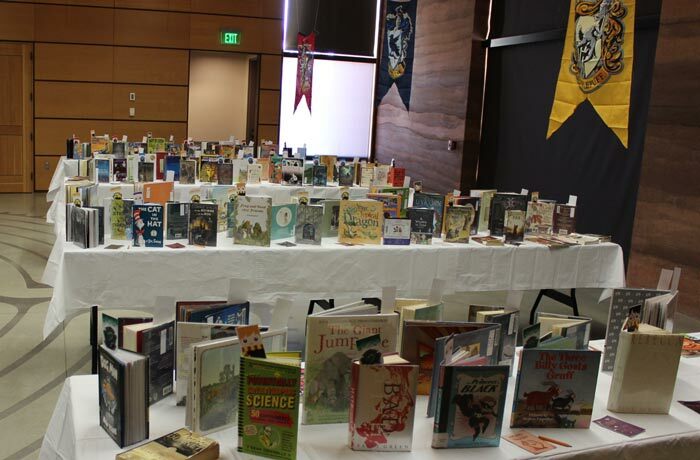 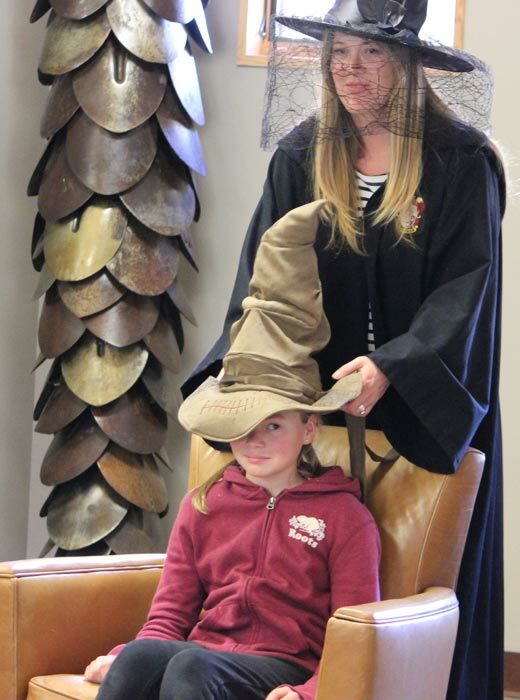 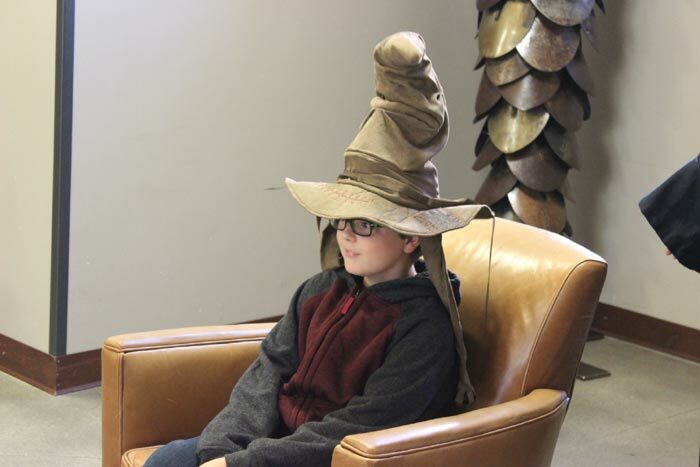 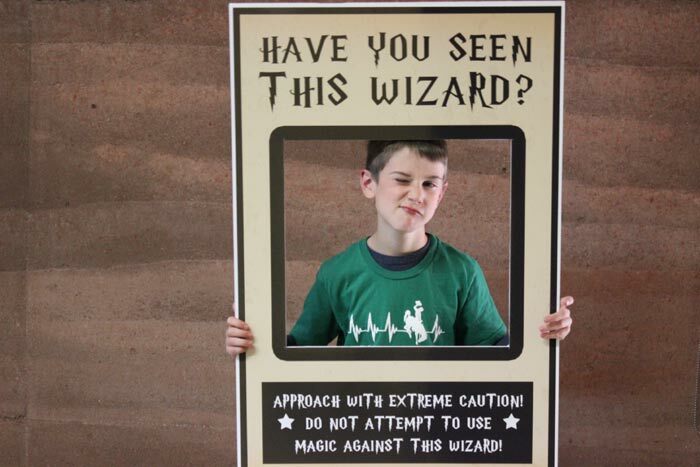 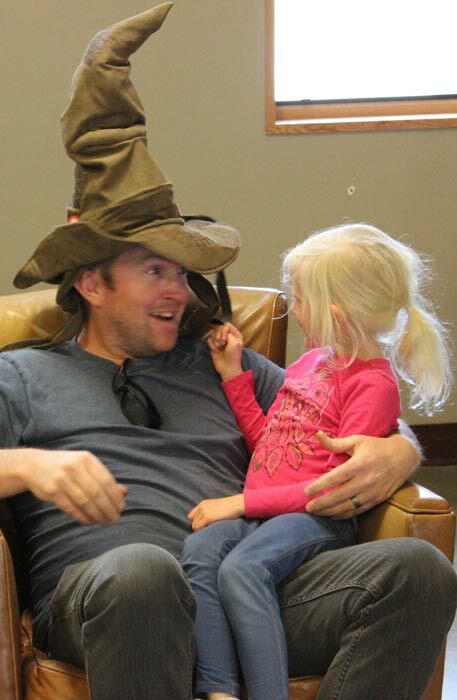 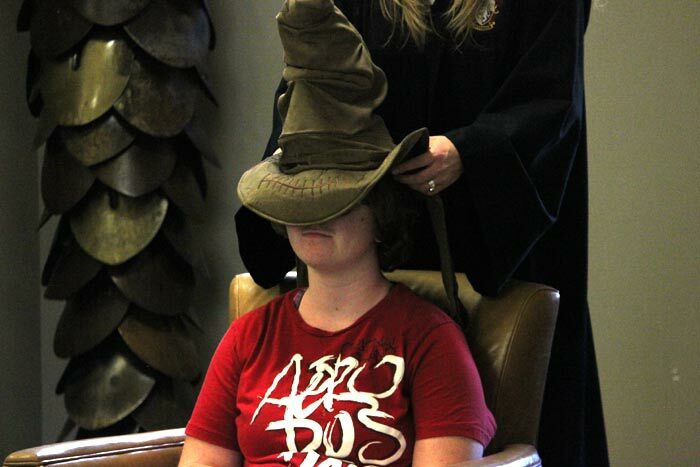 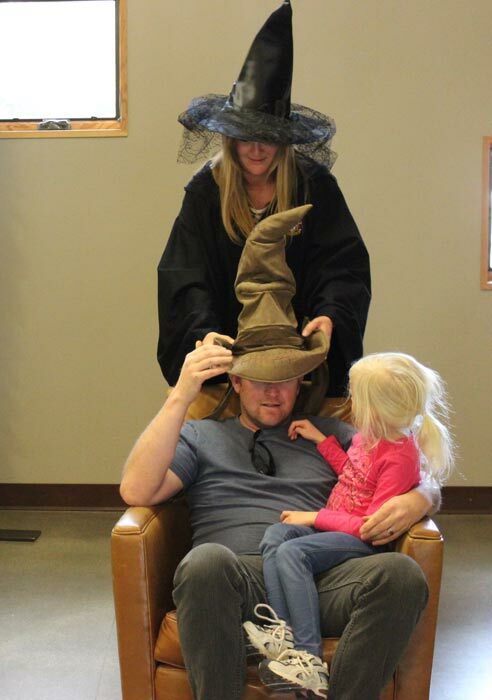 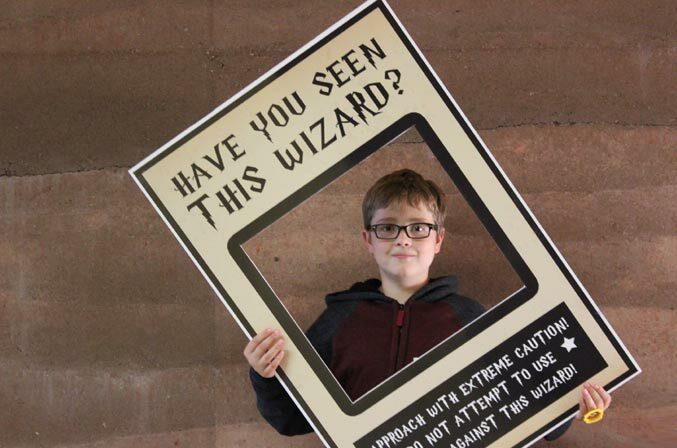 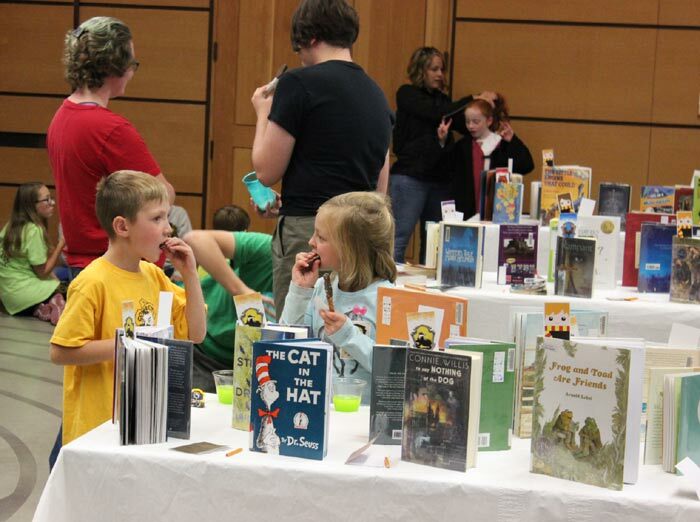 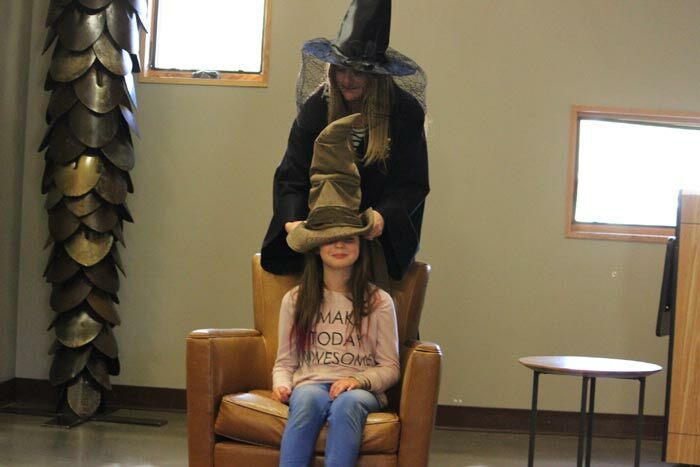 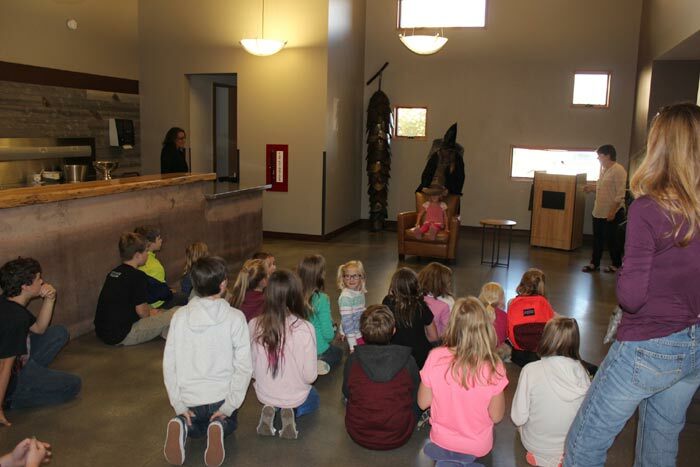 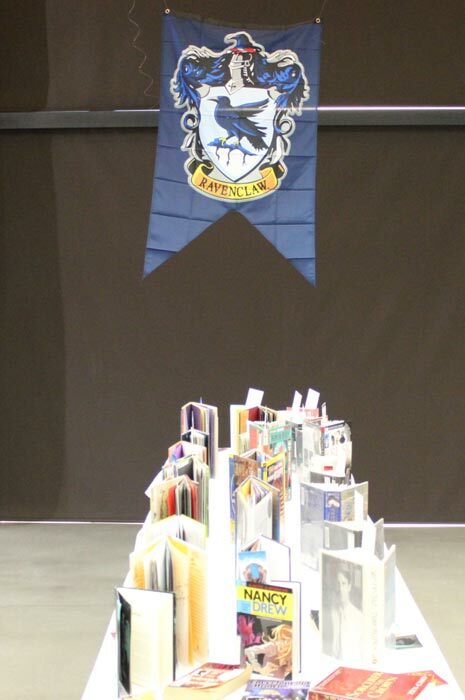 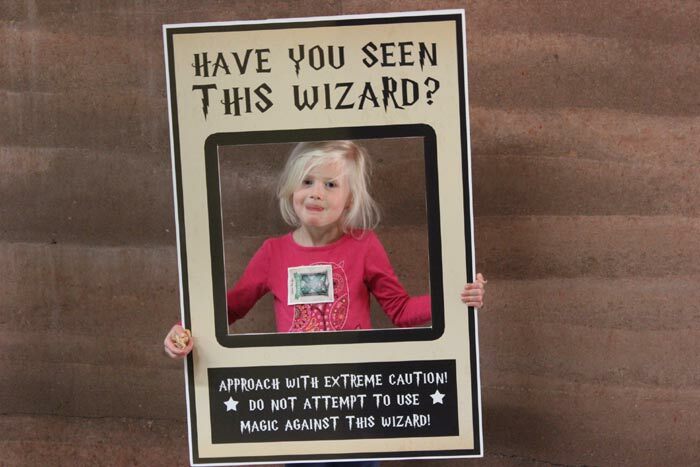 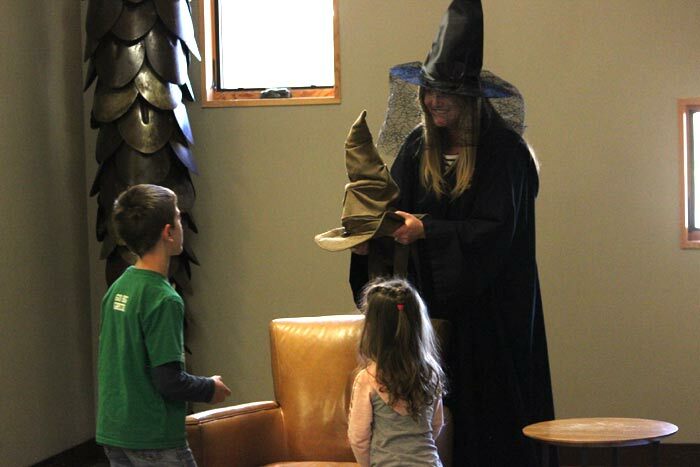 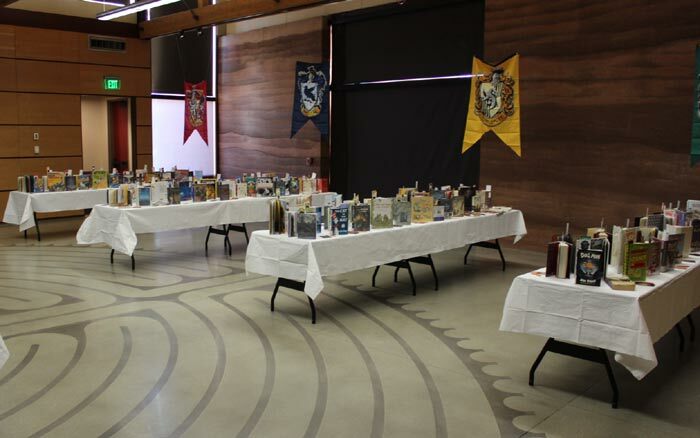 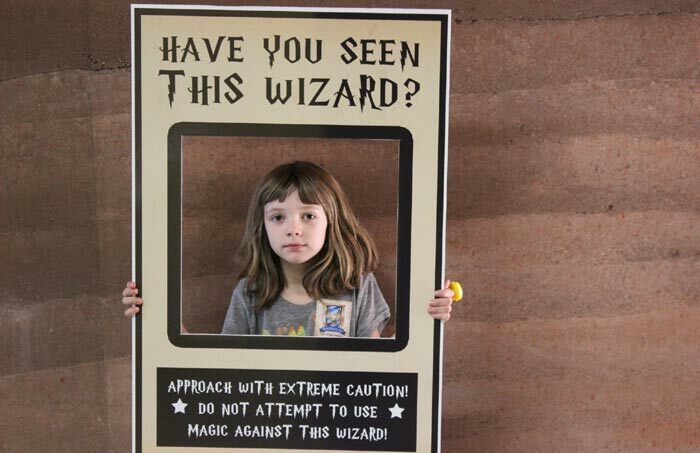 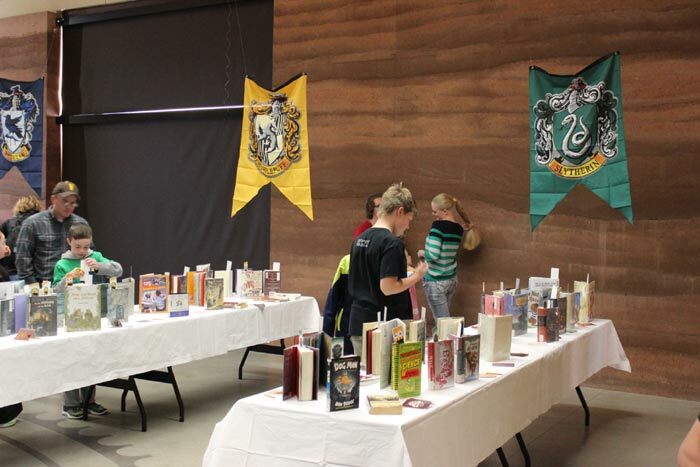 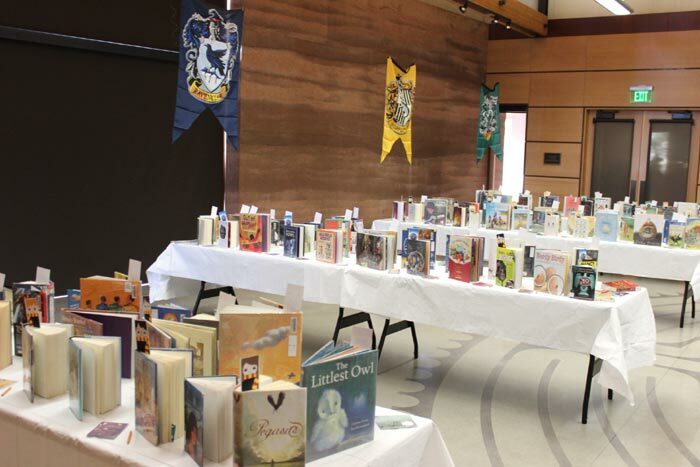 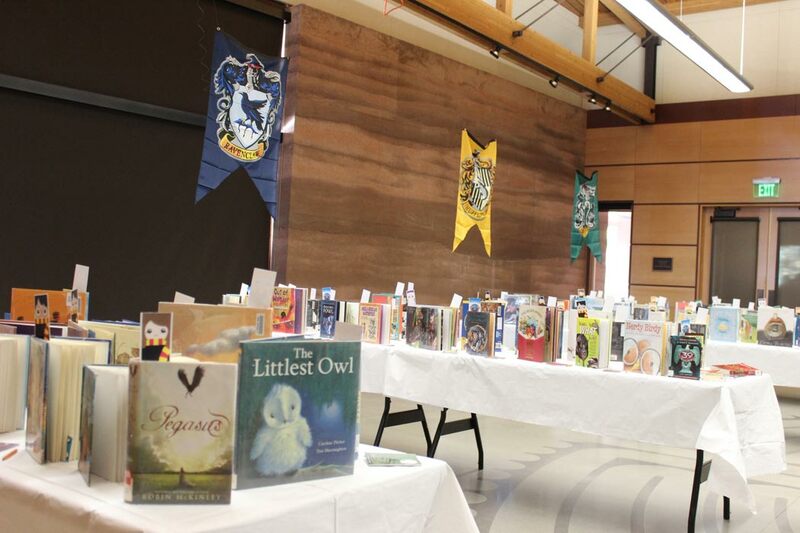 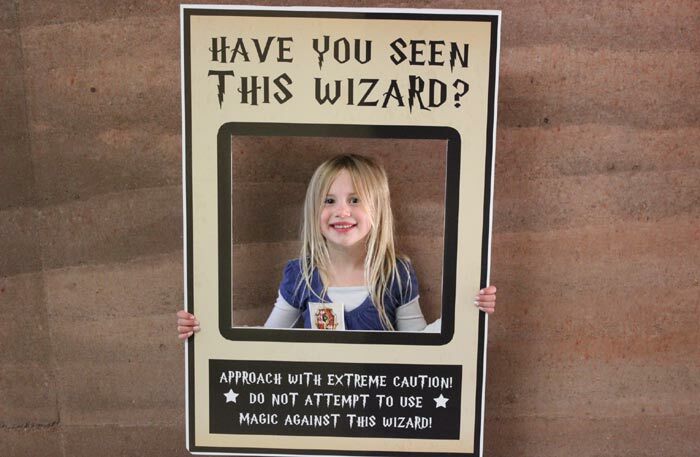 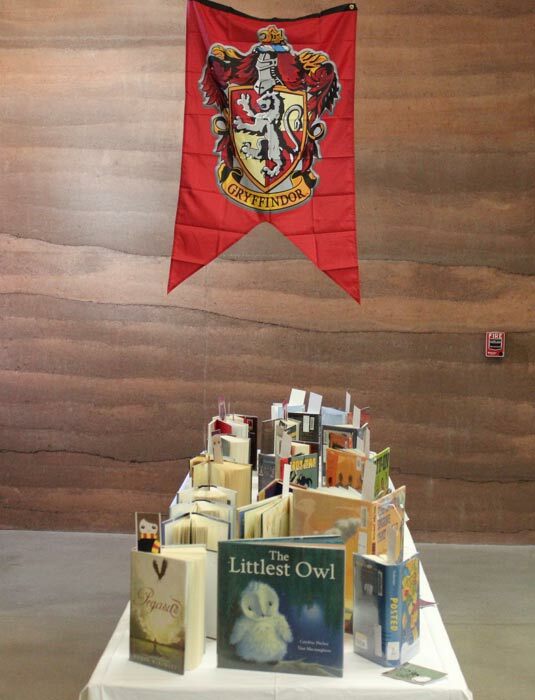 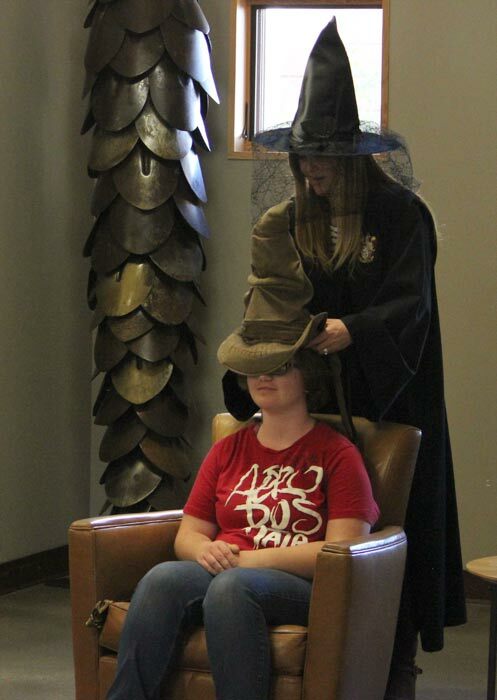 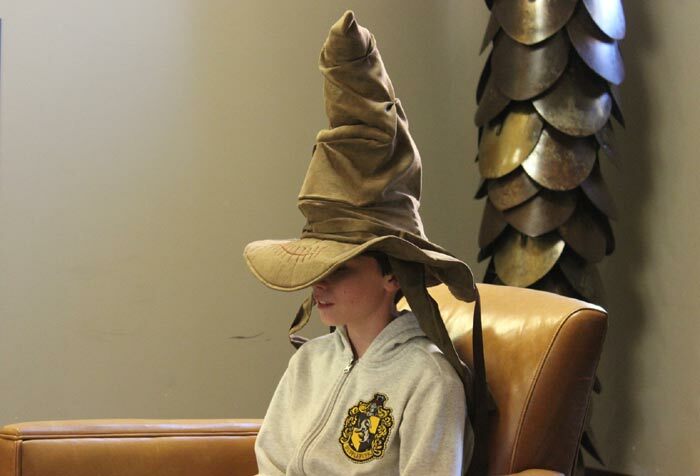 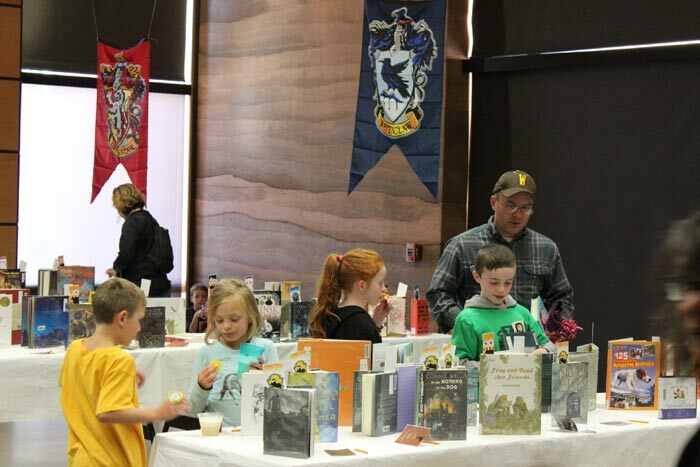 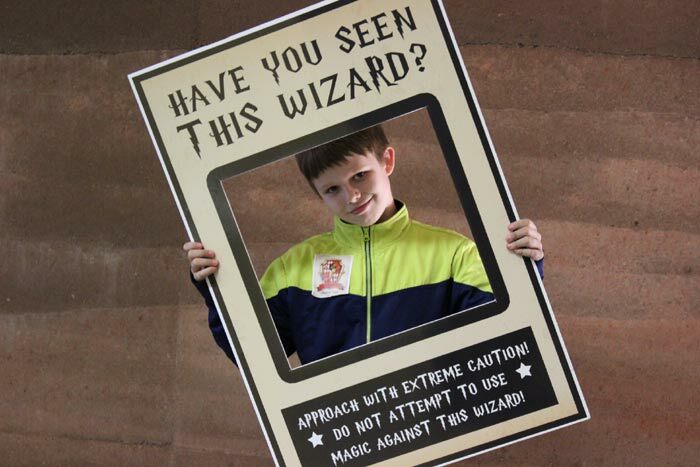 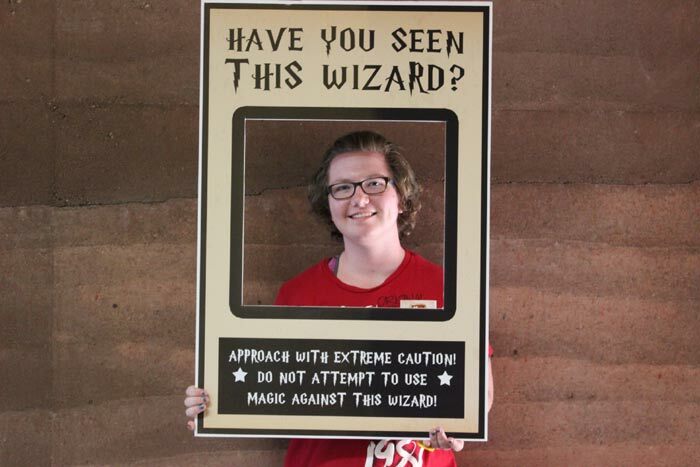 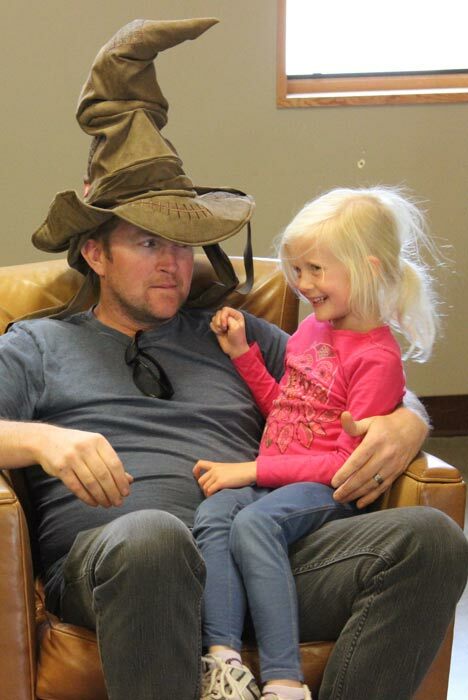 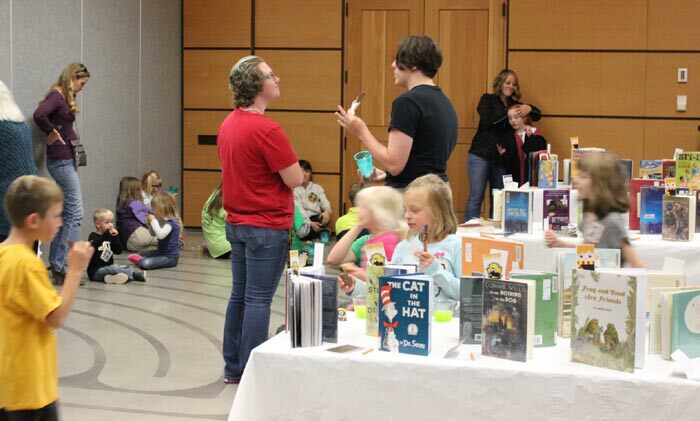 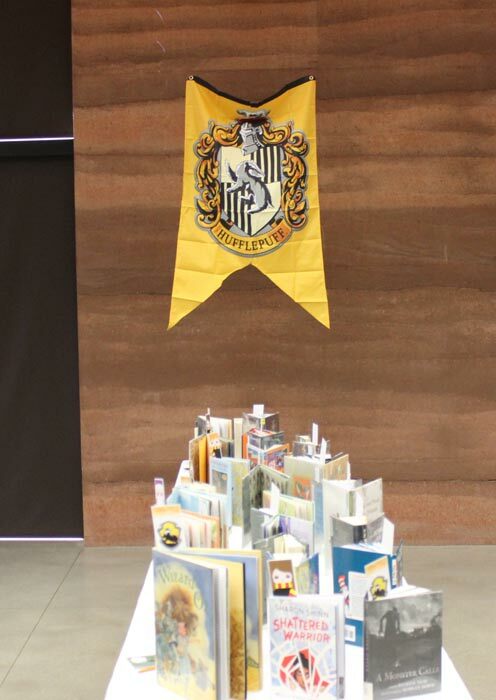 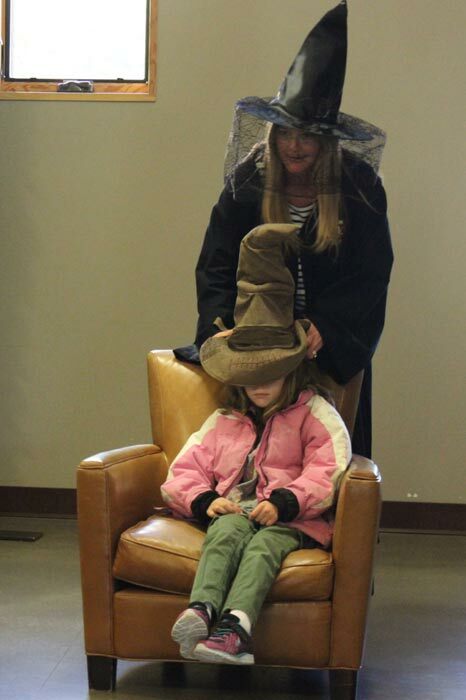 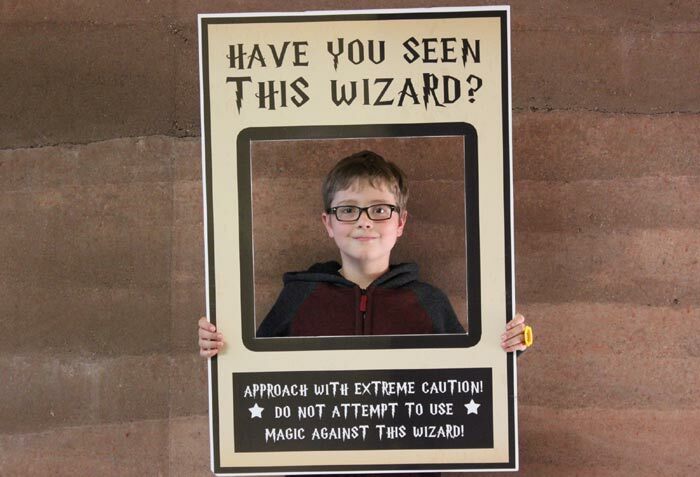 Readers of all ages were able to get a taste of some great books at our September 2017 Harry Potter Book Tasting and Sorting Ceremony. 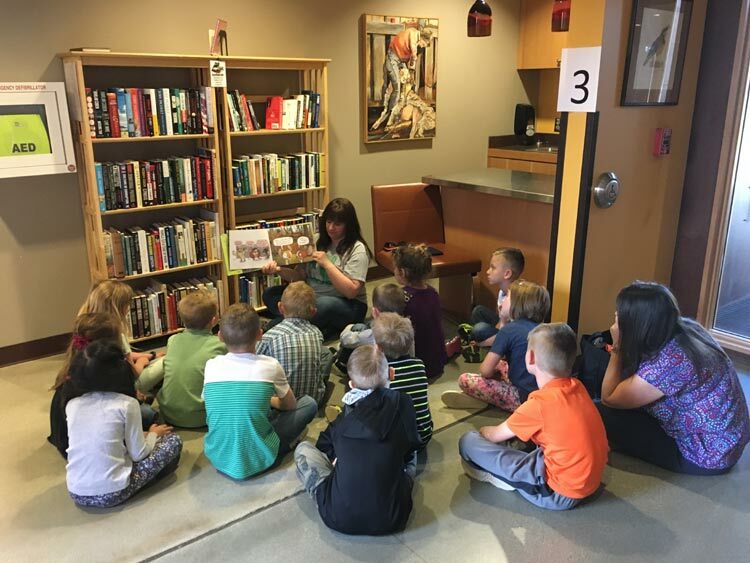 They looked at the book cover, read the description, and read the first page to decide if they wanted to "taste" a book. 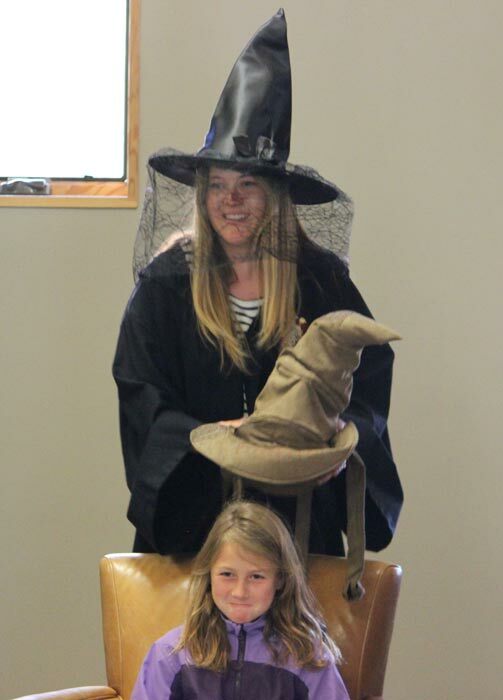 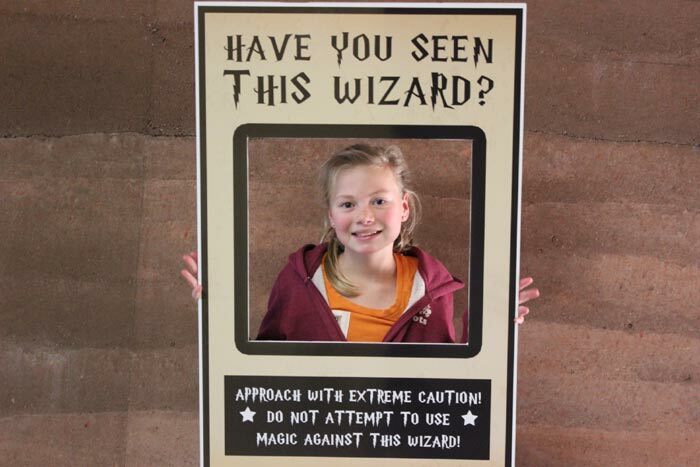 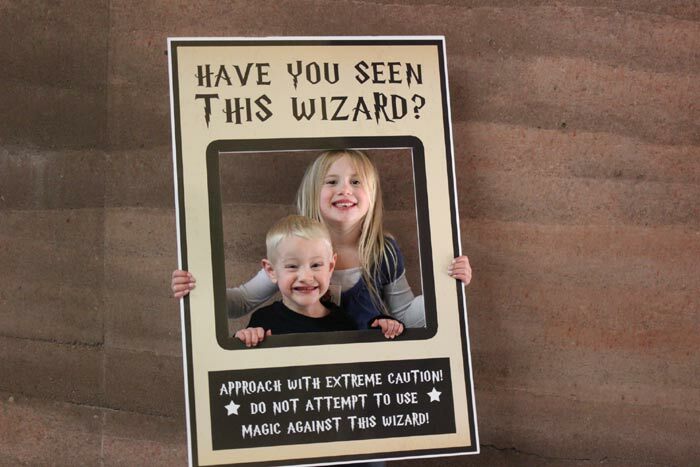 Magical fun was had by all! 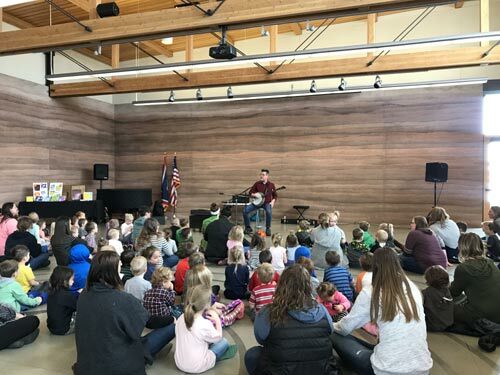 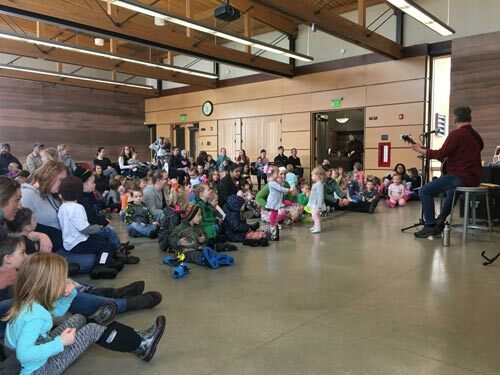 Thank you to everyone who came out to enjoy our music concert in March with awesome musician and author Jim Gill! 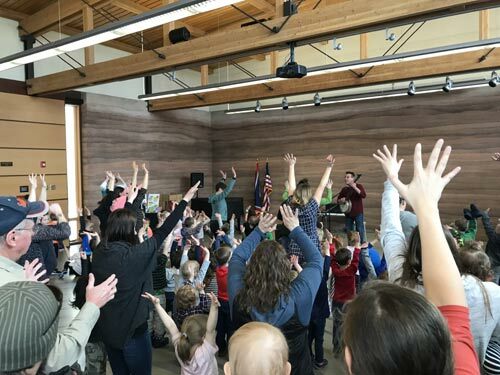 We had so much fun singing and dancing with you! 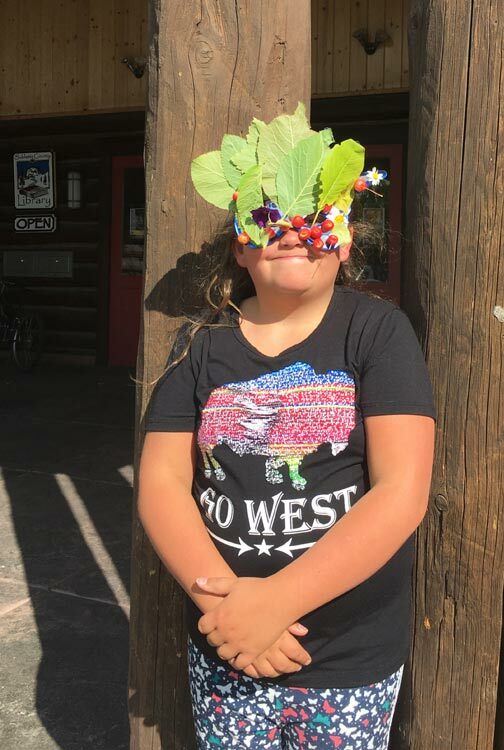 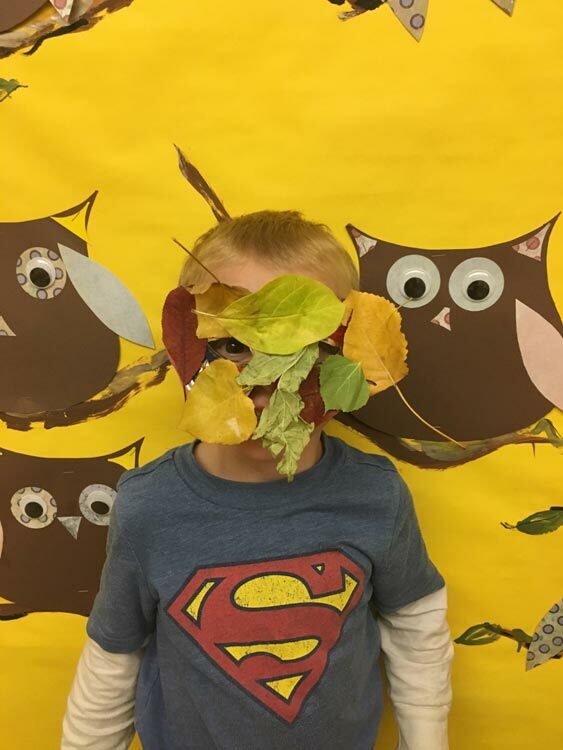 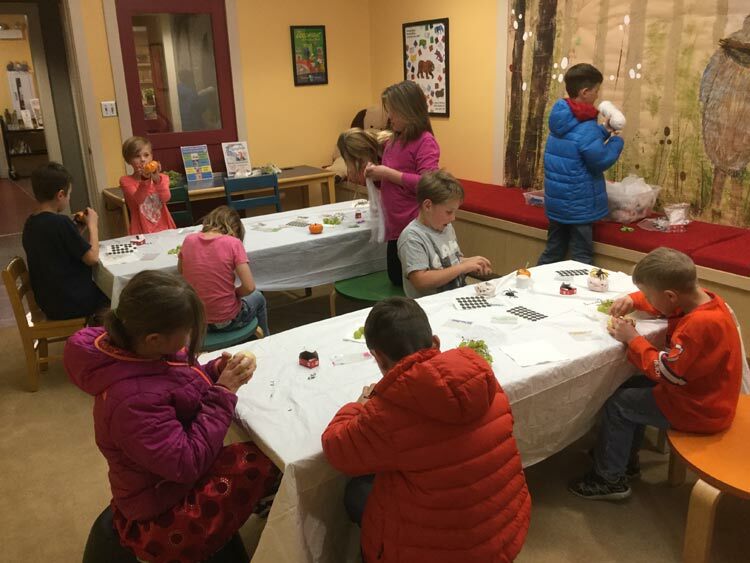 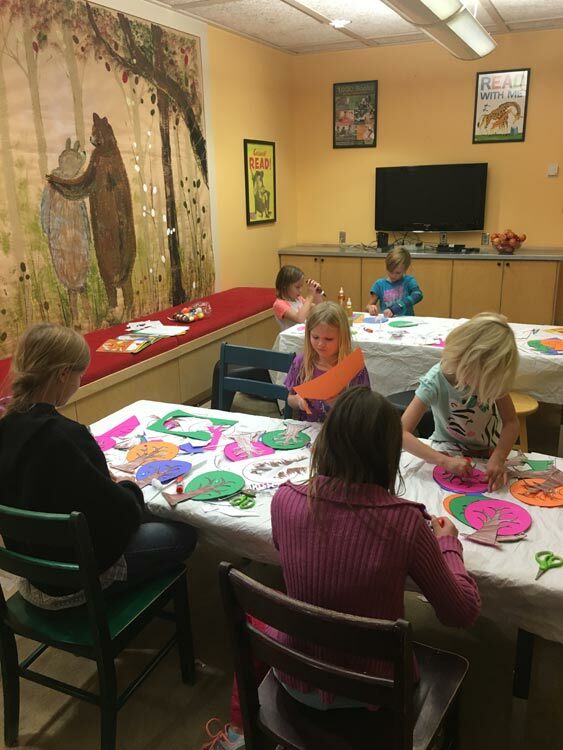 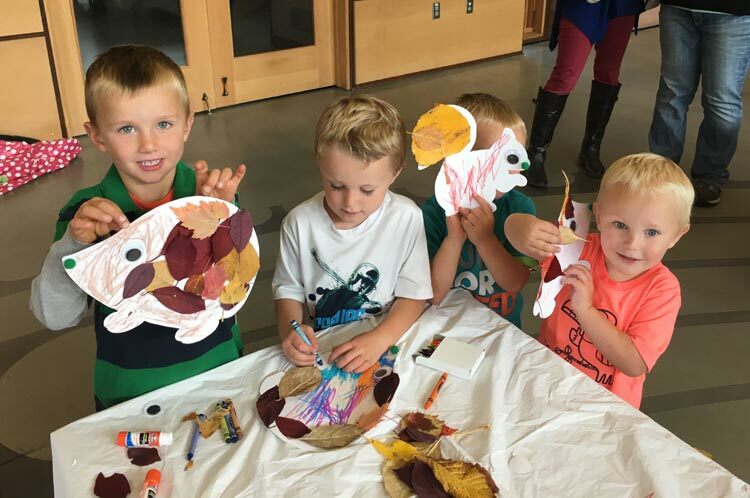 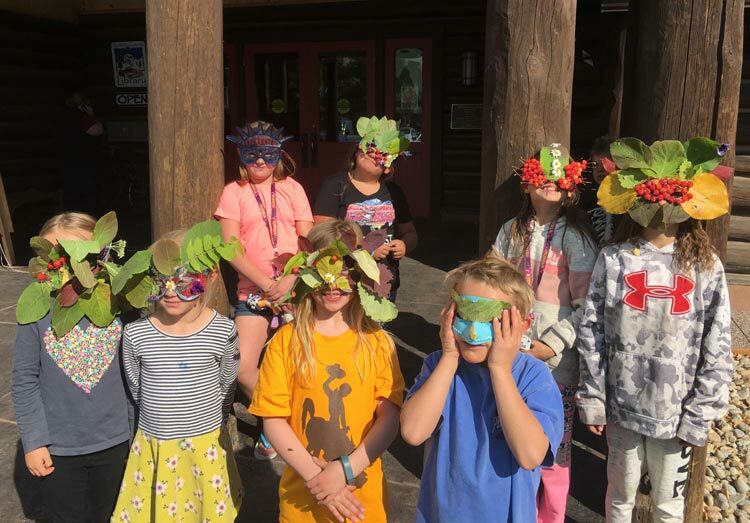 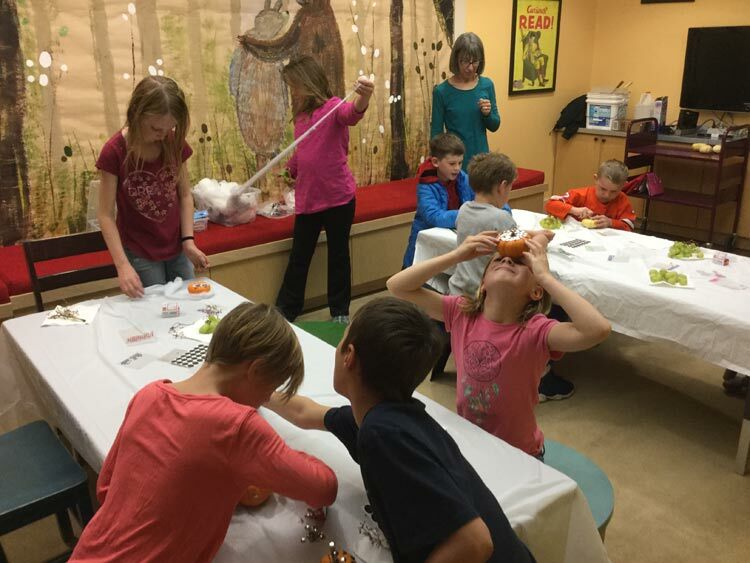 The kids are having a blast making autumn leaf masks, season trees and other creations during our Friday afternoon MakerSpace. 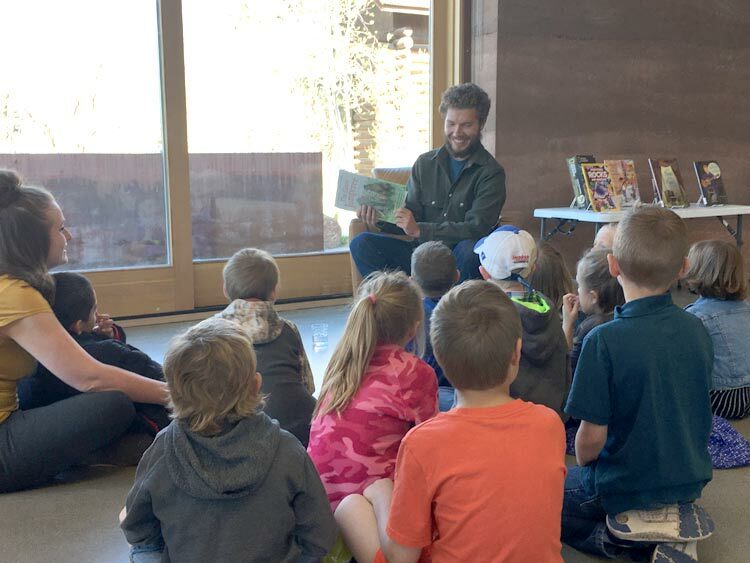 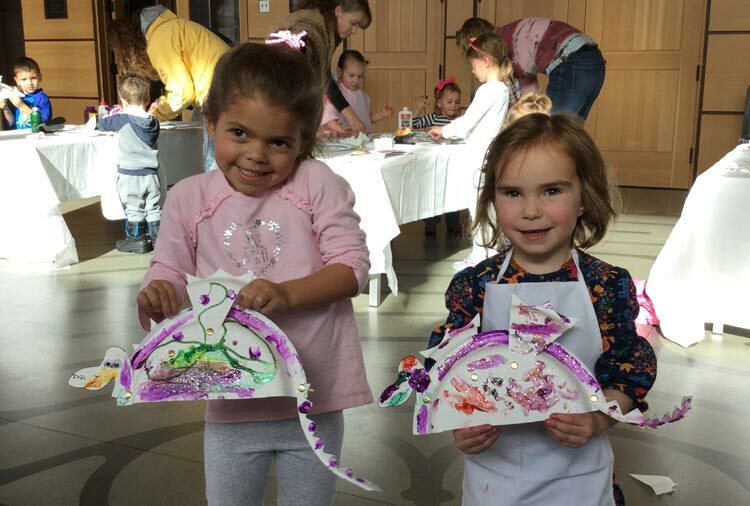 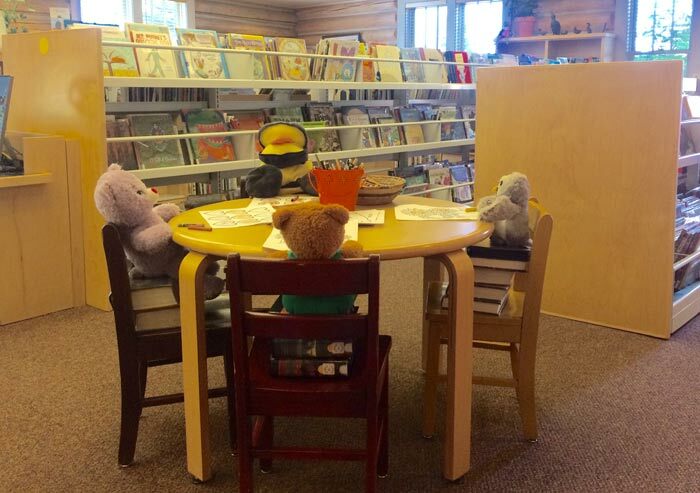 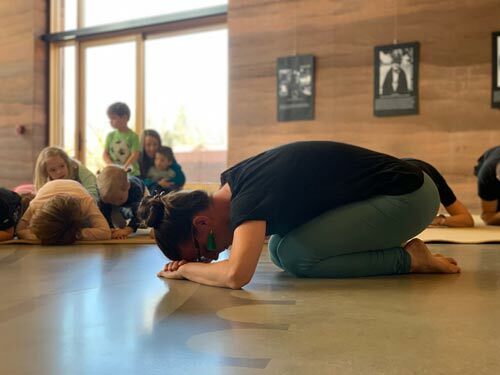 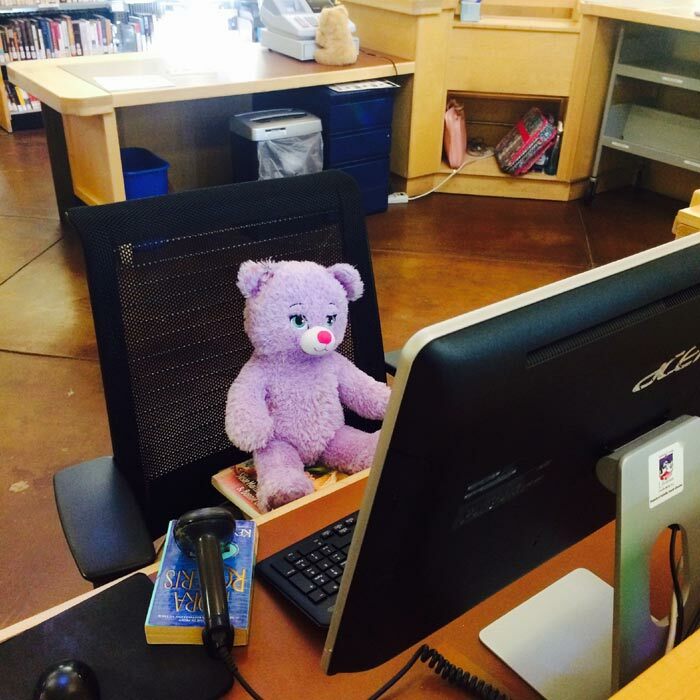 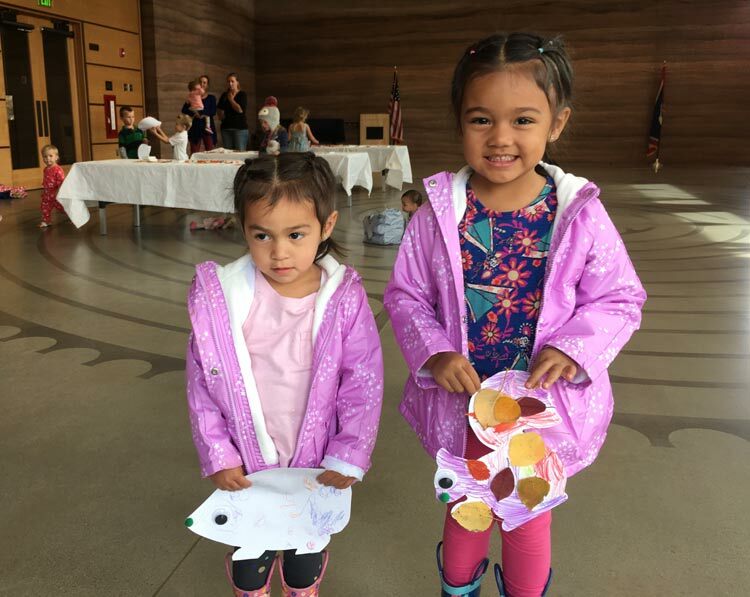 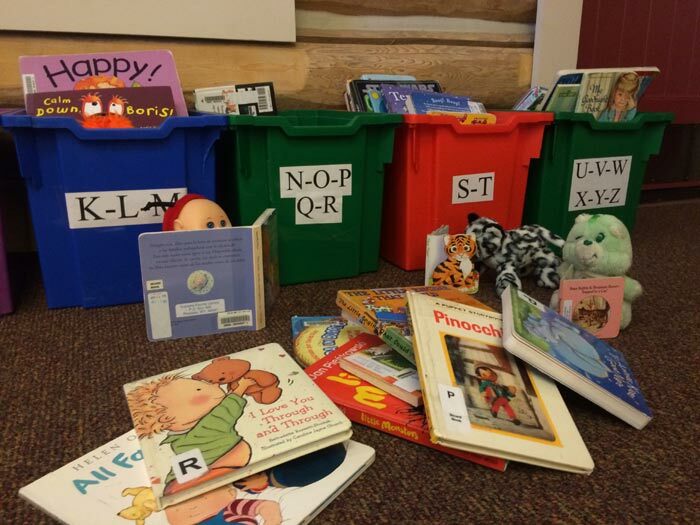 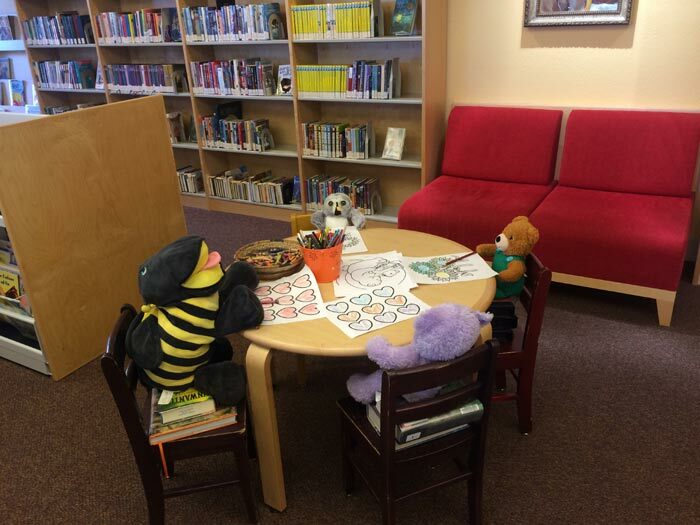 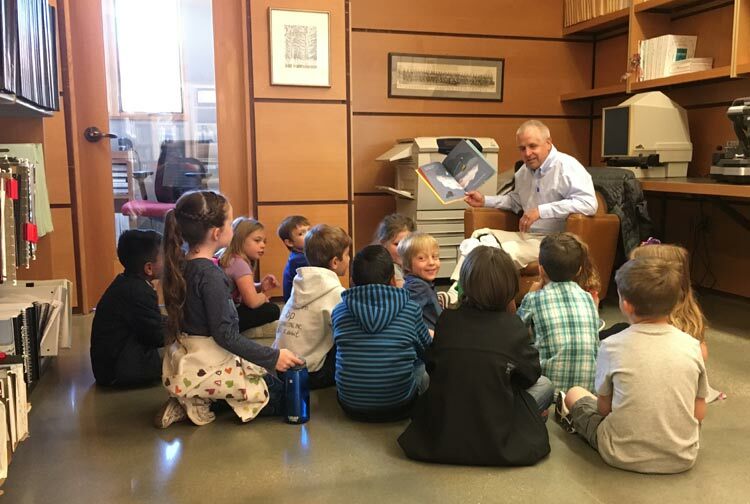 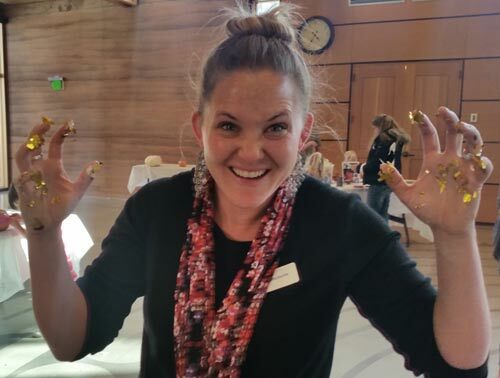 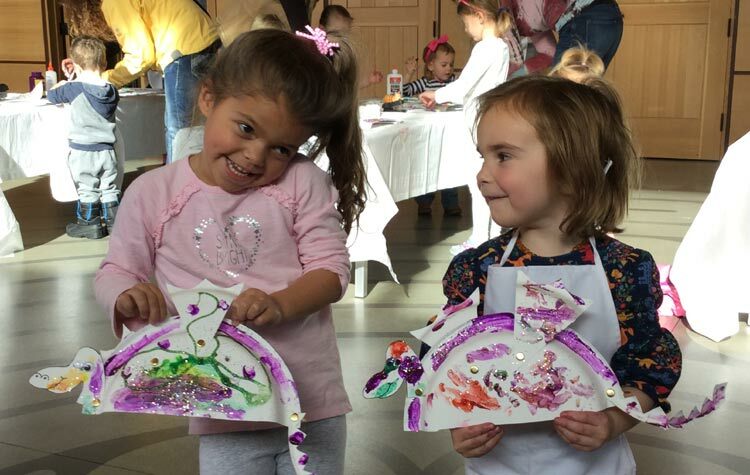 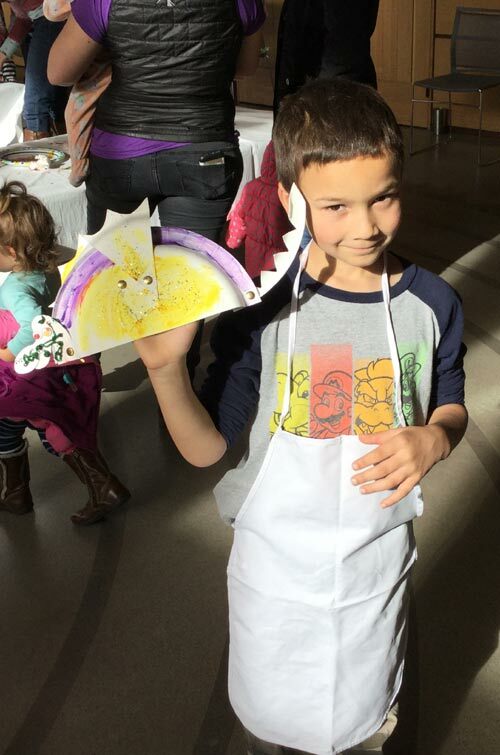 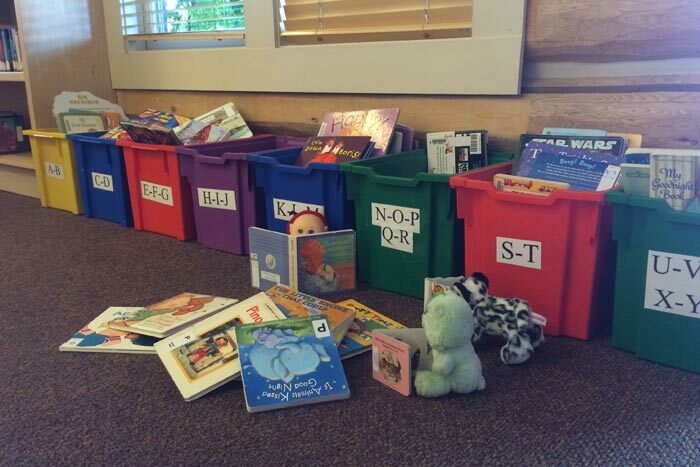 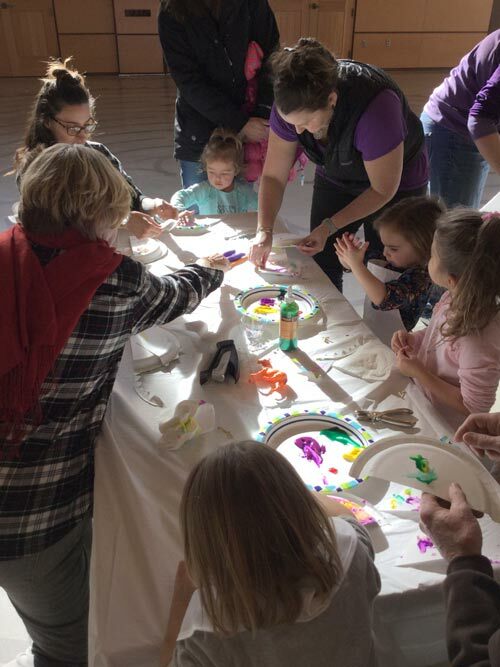 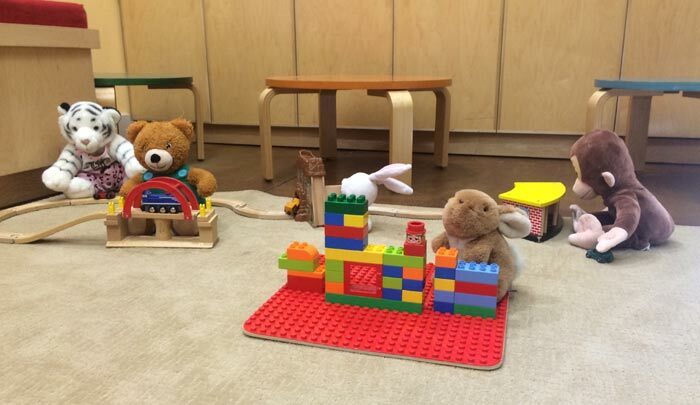 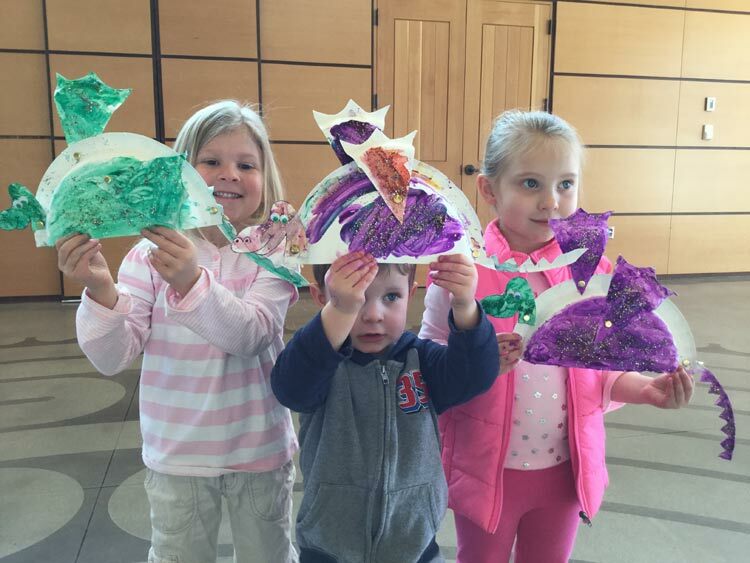 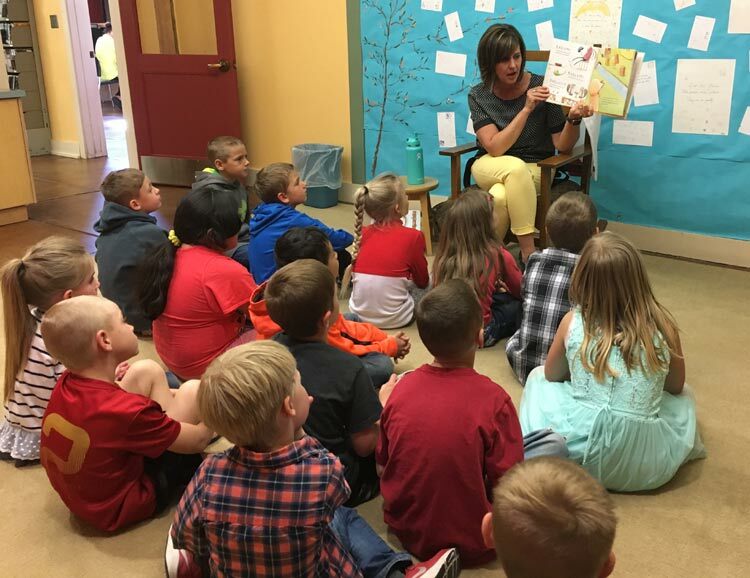 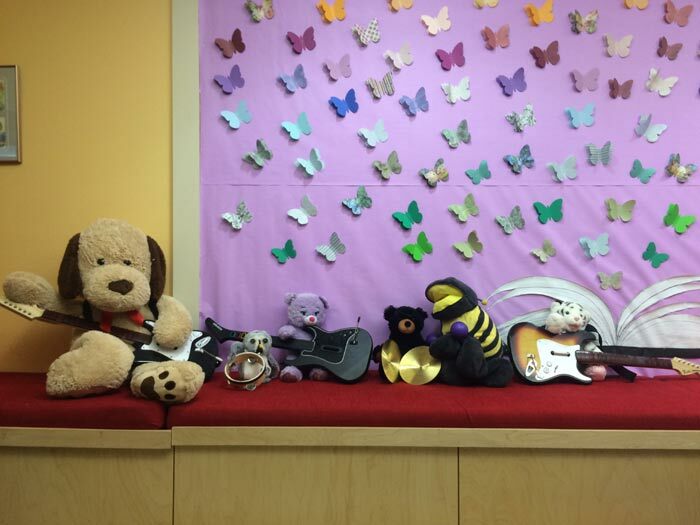 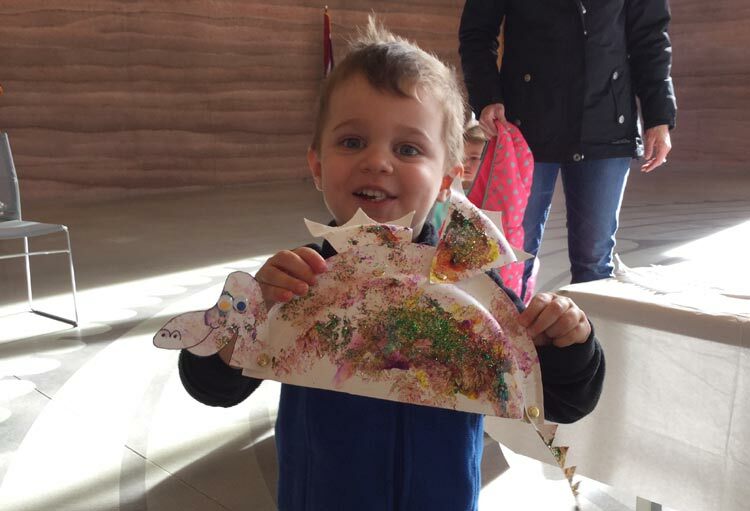 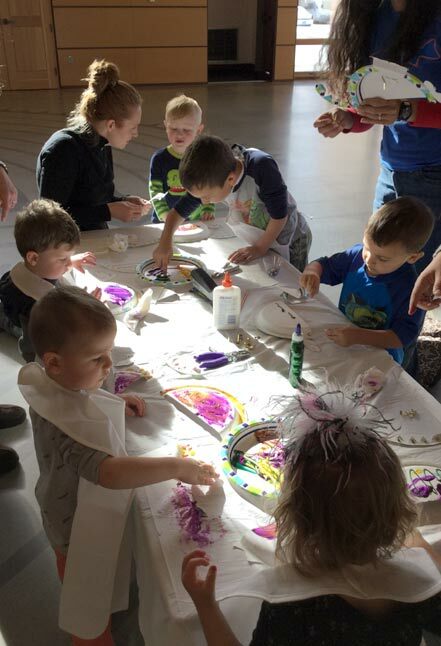 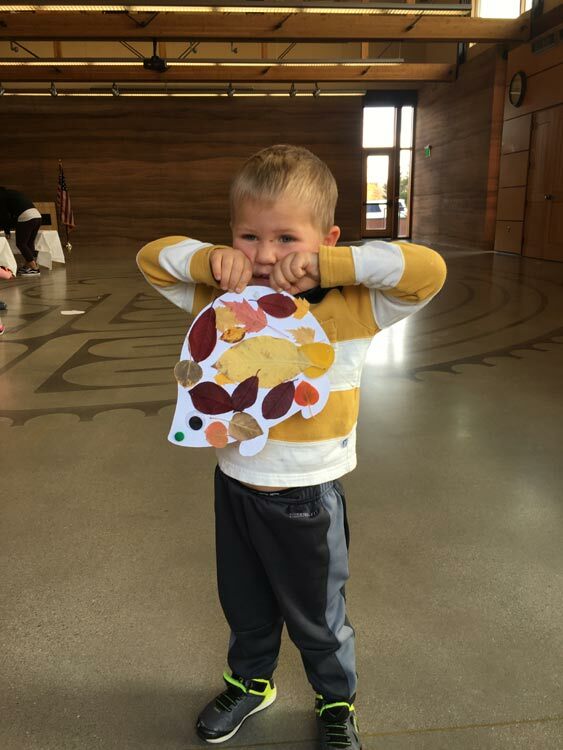 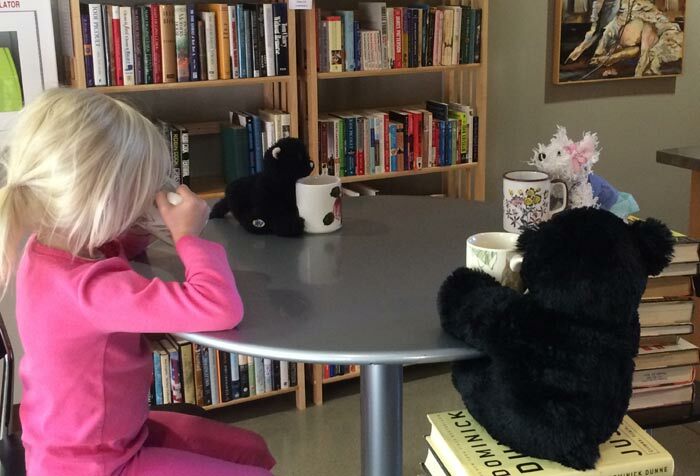 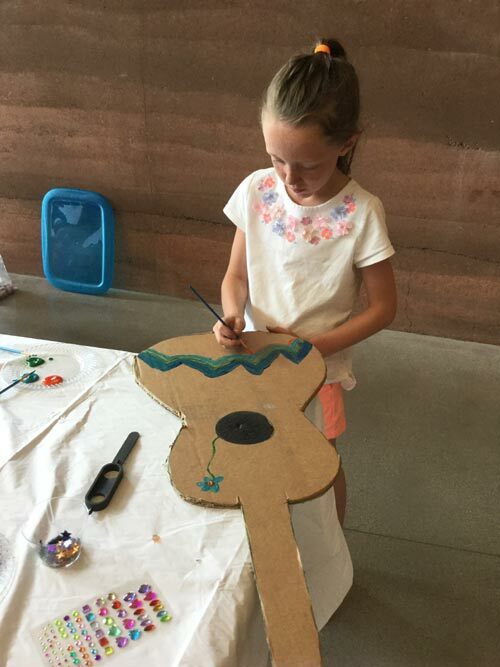 Elementary school kids in grades K-5 are welcome every Friday in the Storytime Room from 2:30 to 3:30 pm to get creative with a variety of DIY projects and exploration. 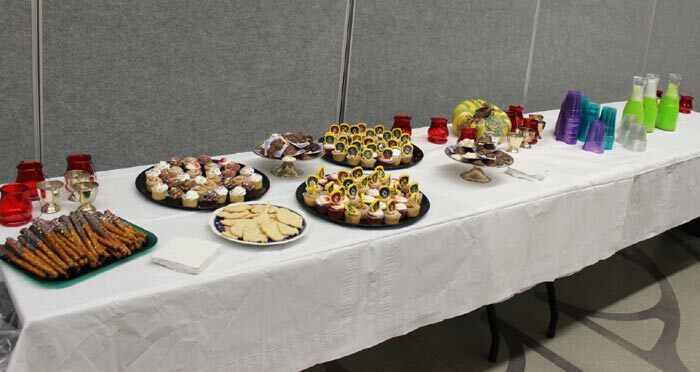 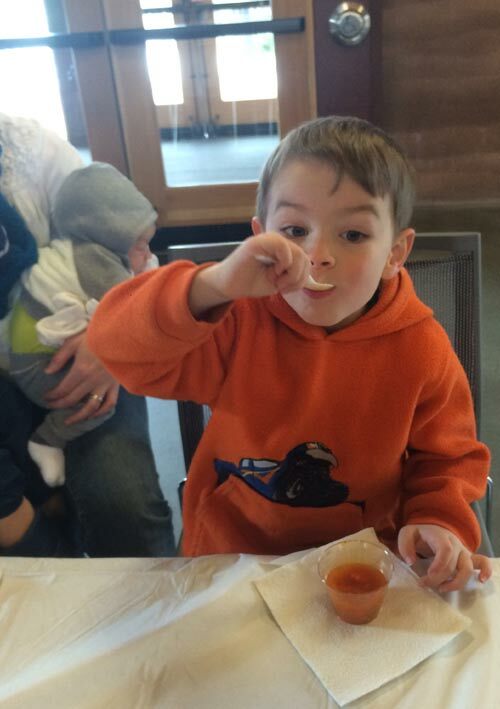 A healthy snack is also provided. 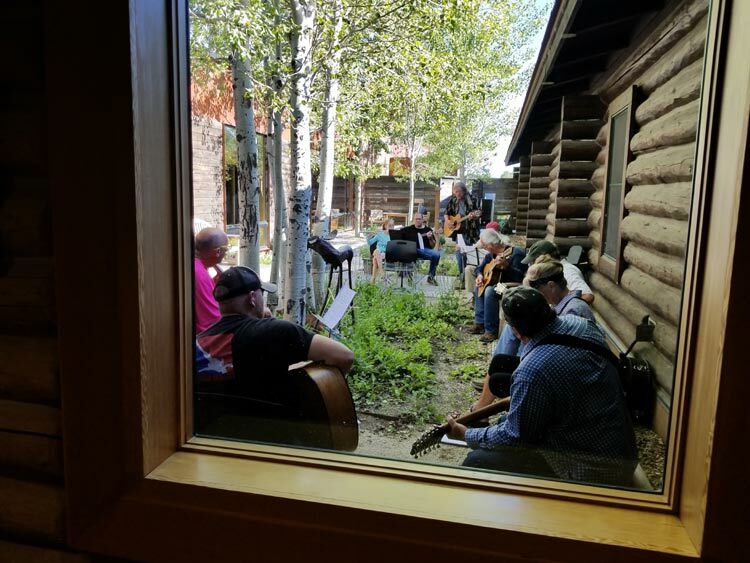 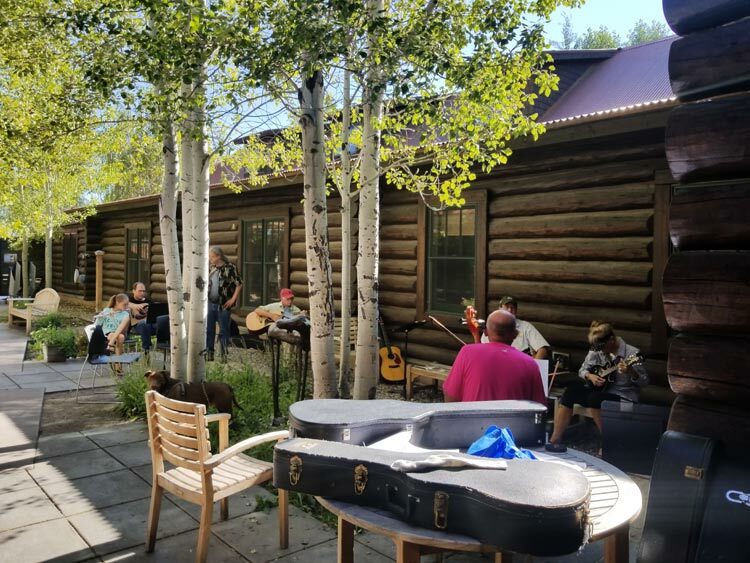 We've been hosting a Musicians Gathering every first and third Wednesday of the month at 5 pm. 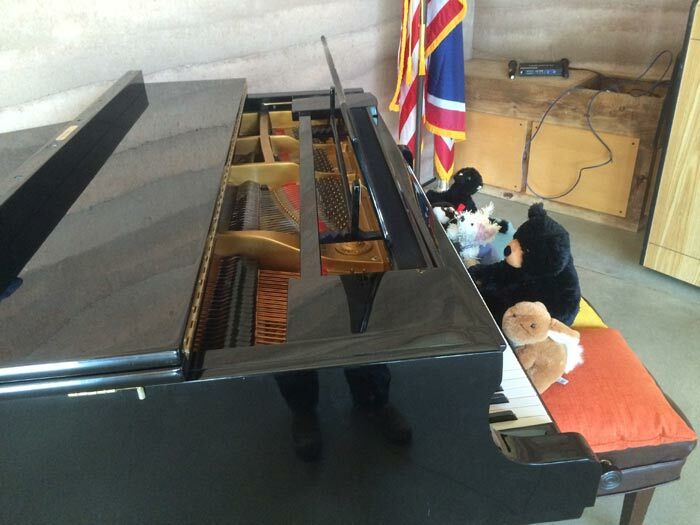 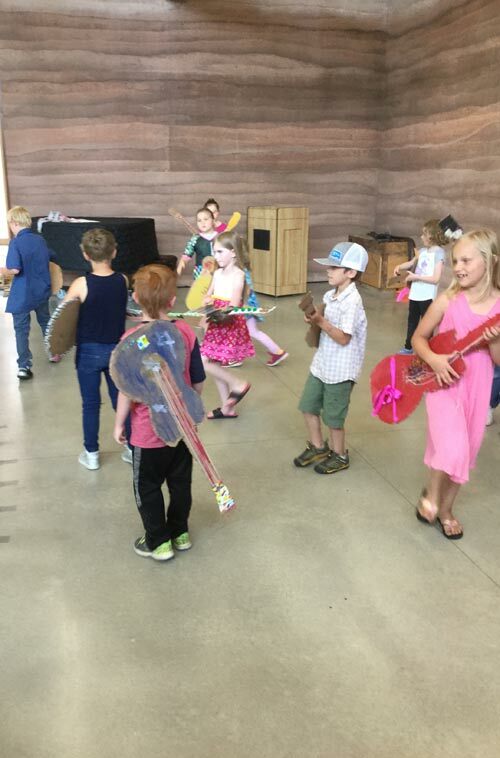 It's a chance to get together informally, to play music, share skills, expand skills, or even learn to play. 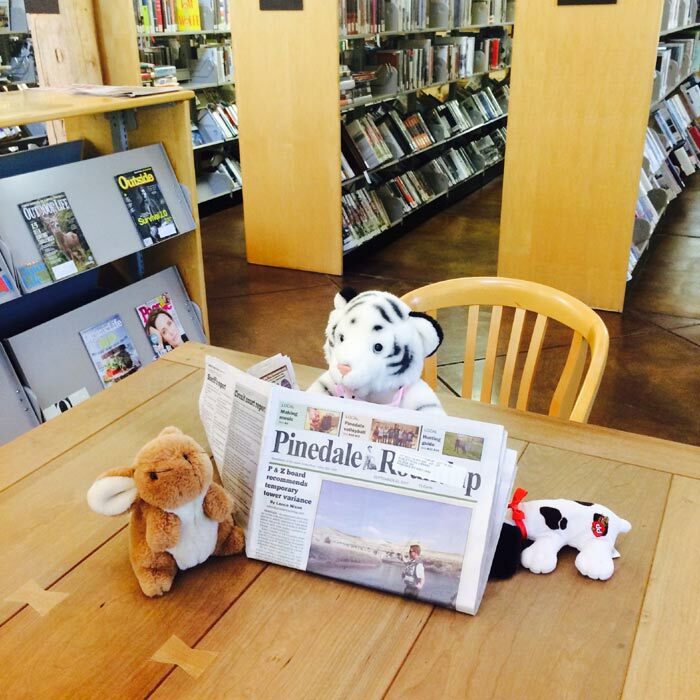 Contact Judi for more info: (307) 367-4114 or email jboyce@sublettecountylibrary.org. 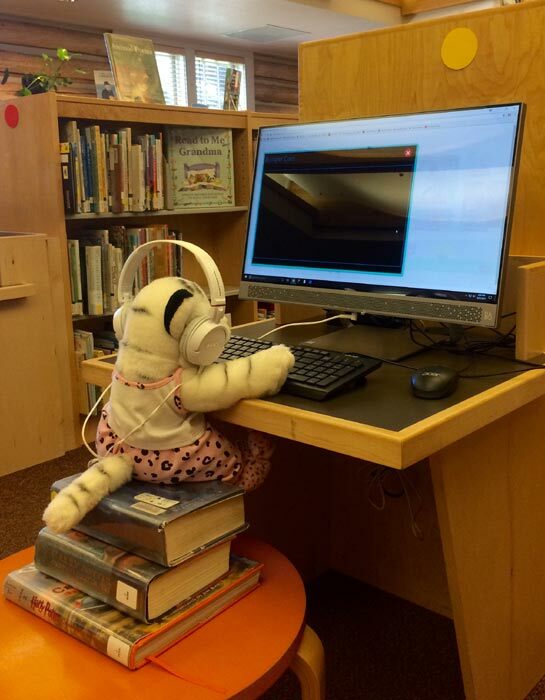 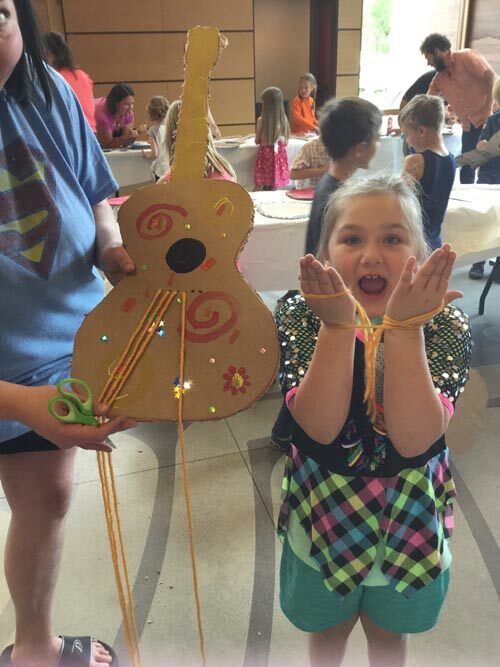 Our Summer MakerSpace is exploring all the ways that "Libraries Rock!" 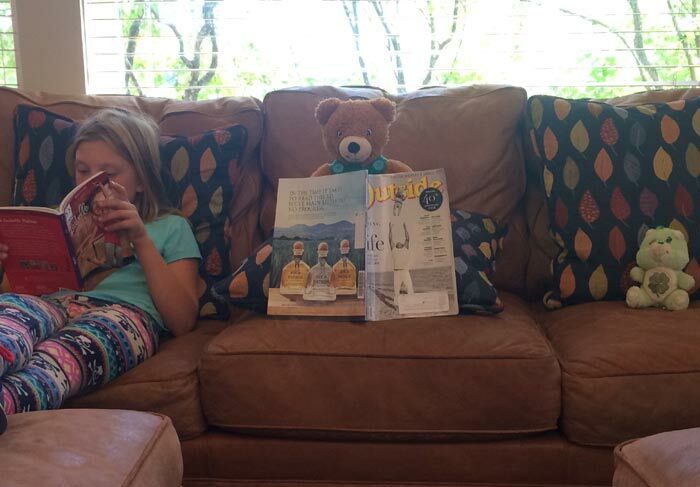 on Thursdays at 2 pm. 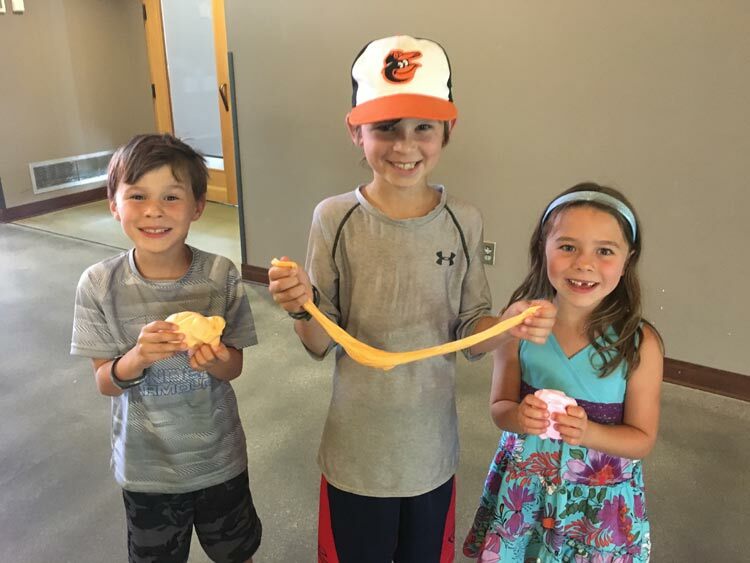 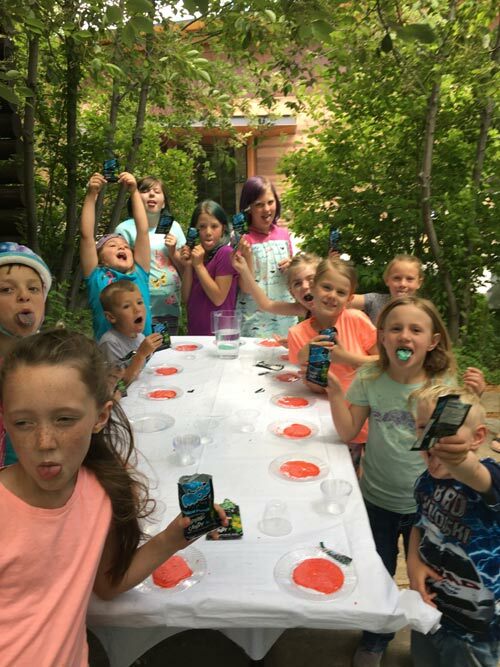 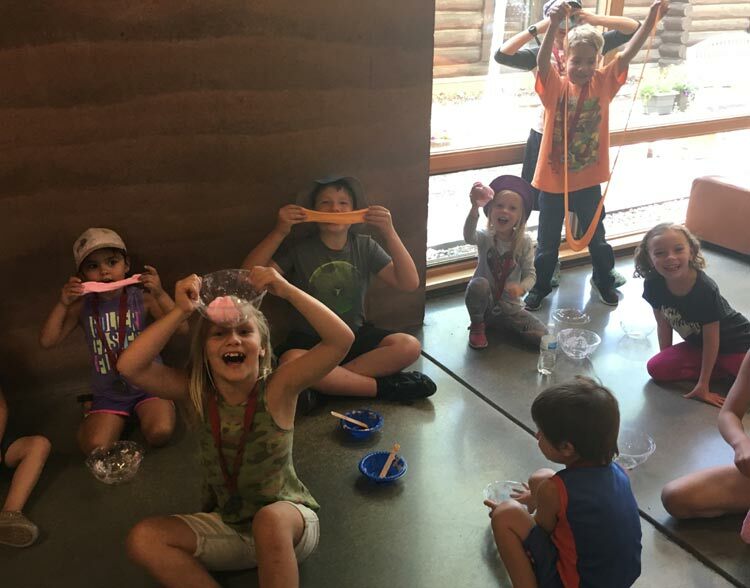 During the summer, kids explored the magic of sound with pop rocks, water xylophones, and more. 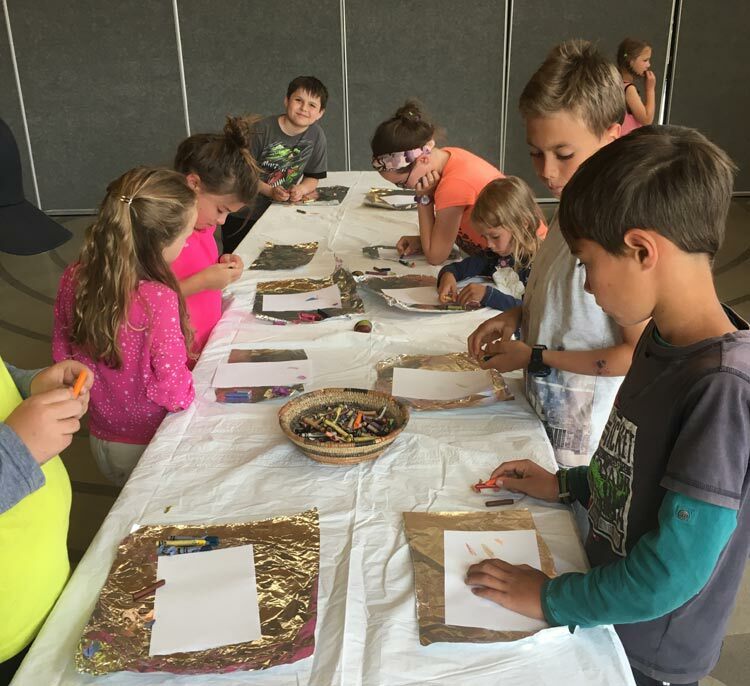 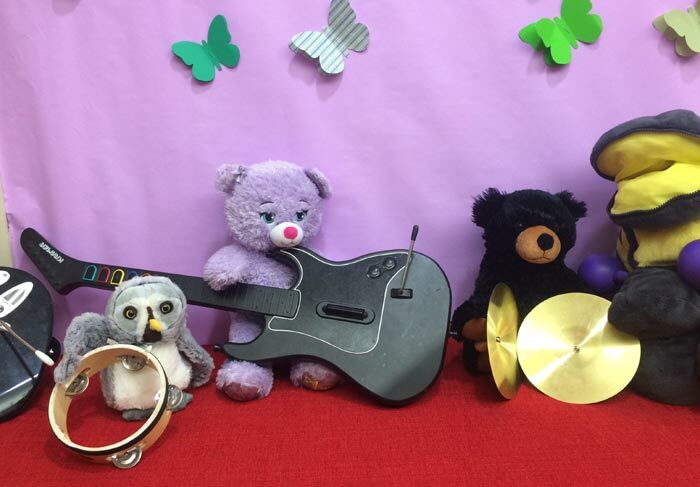 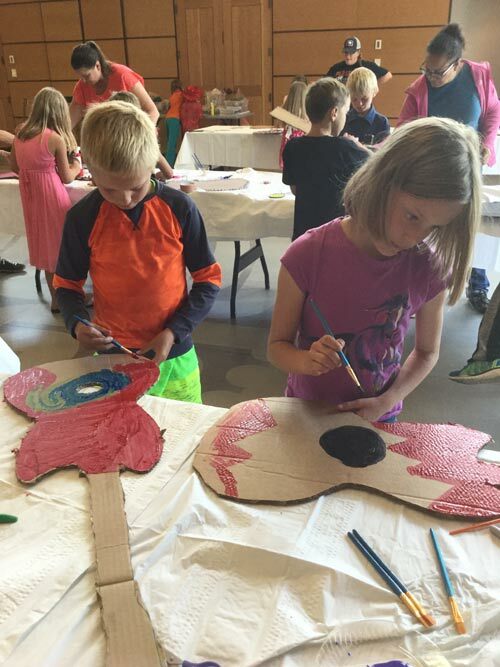 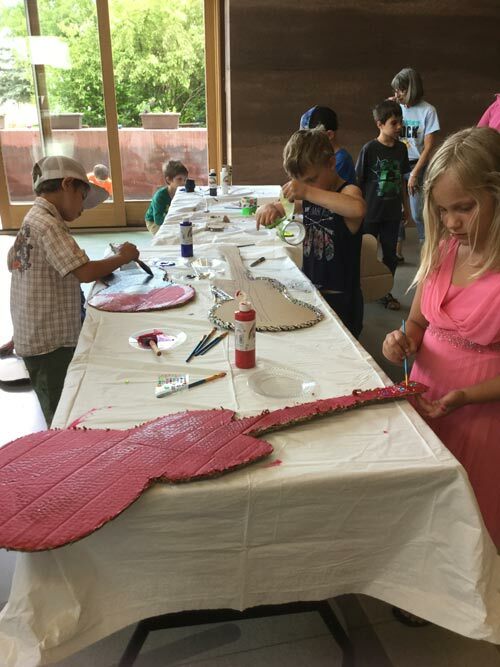 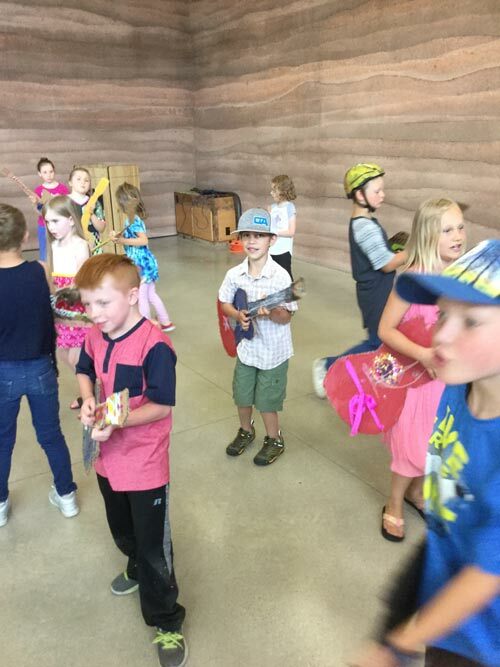 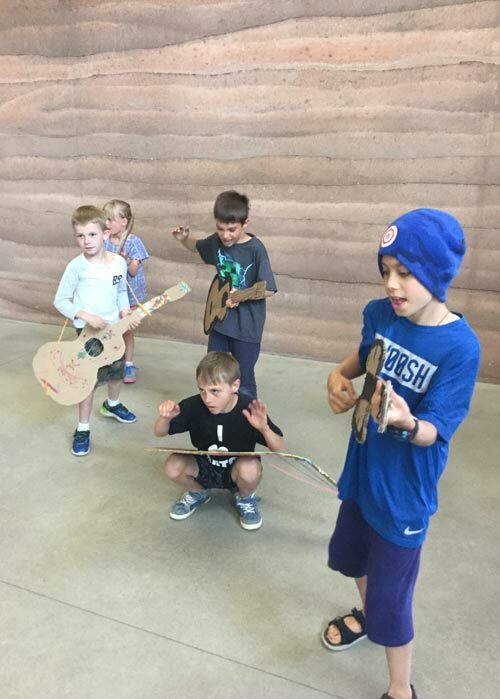 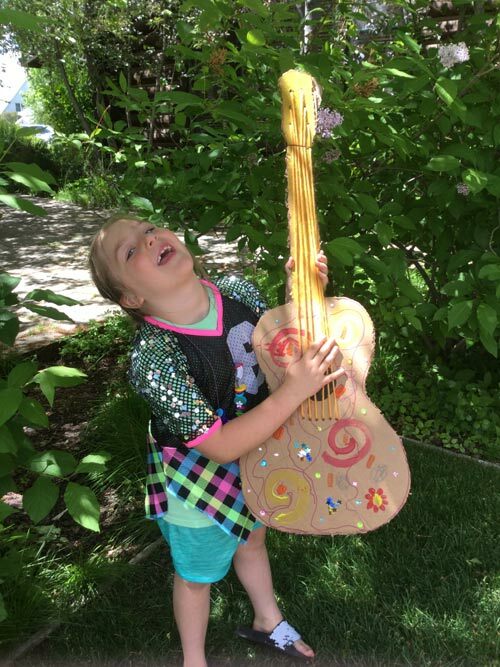 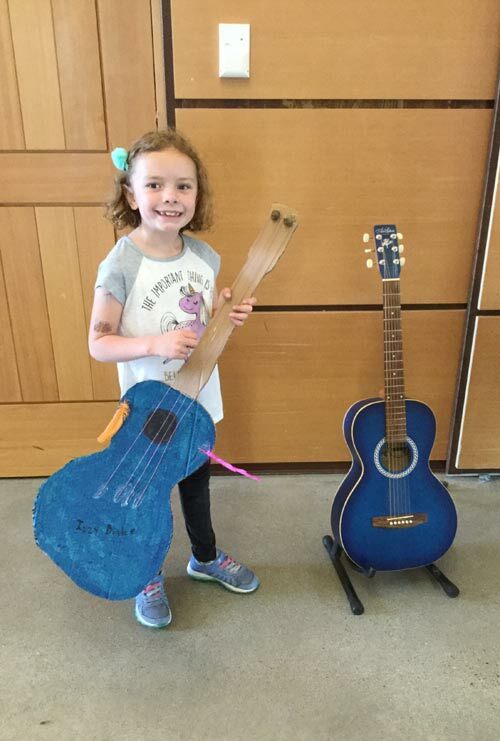 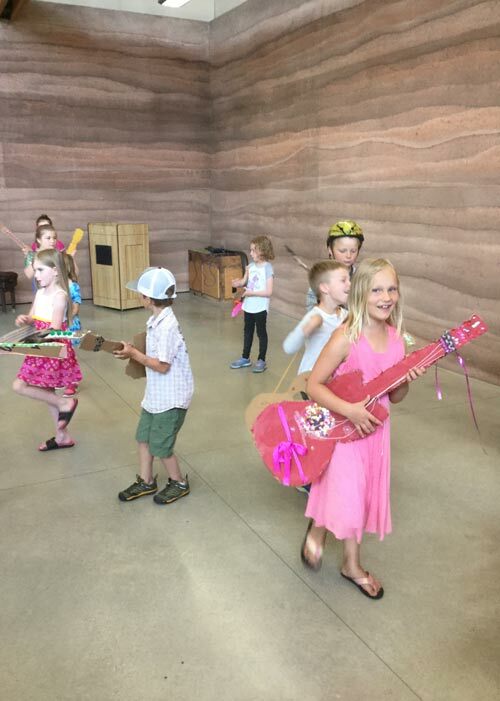 On June 21st, kids created the guitars of their dreams with cardboard, paint, and glitter, and then made a music video using their guitars! 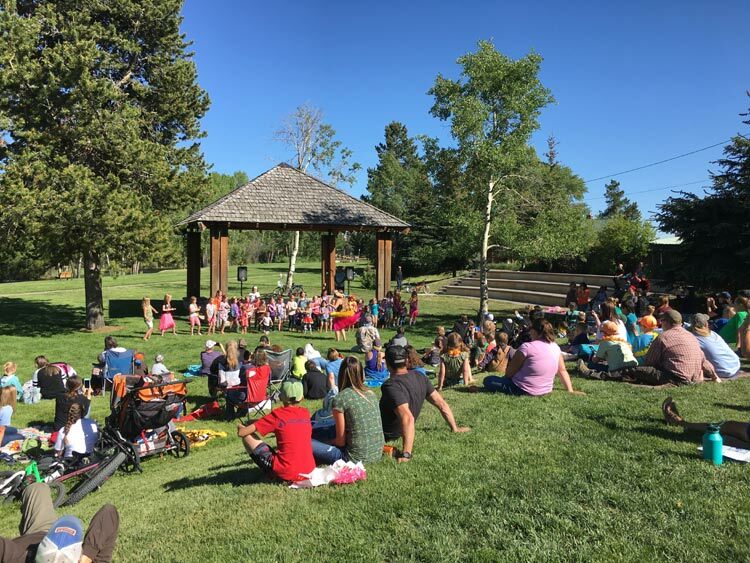 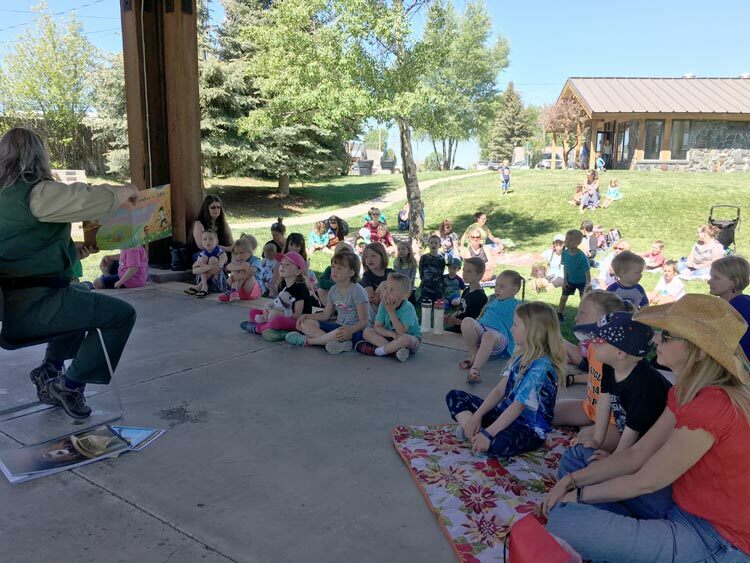 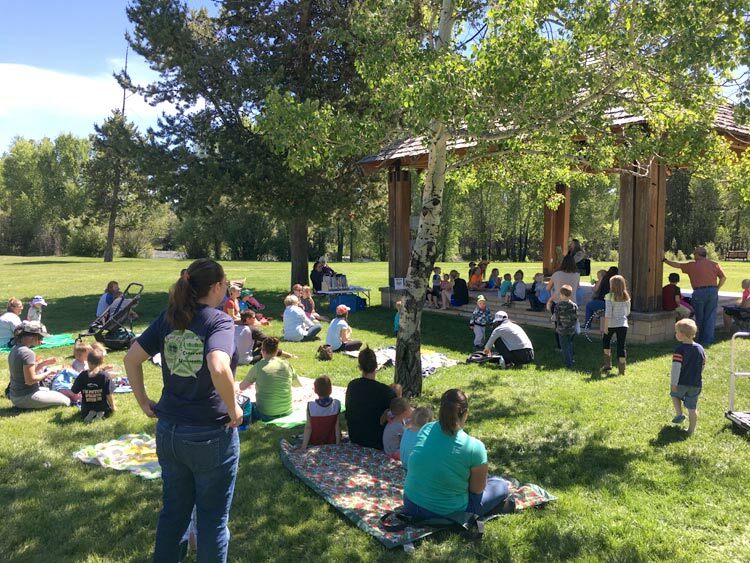 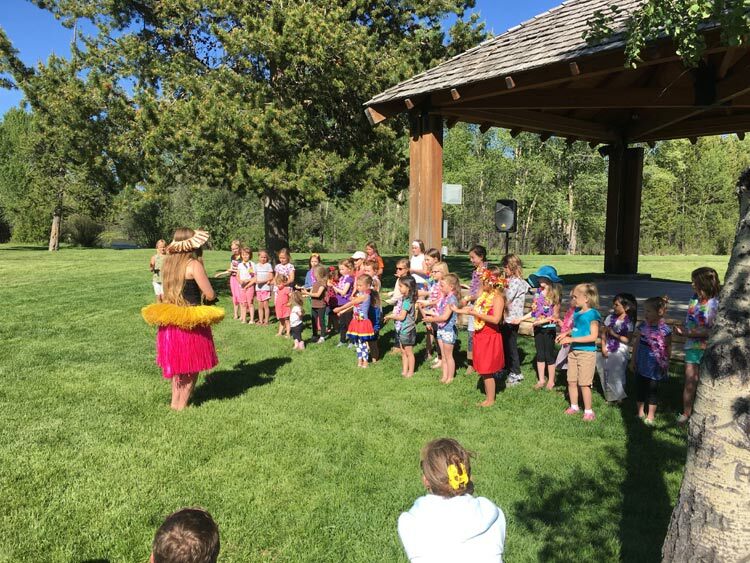 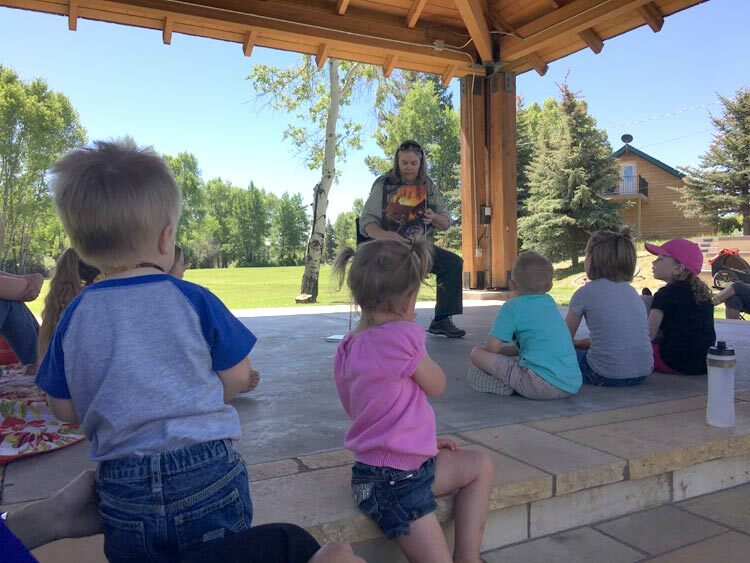 Storytime in the Park took place in June at the American Legion Park on Wednesdays. 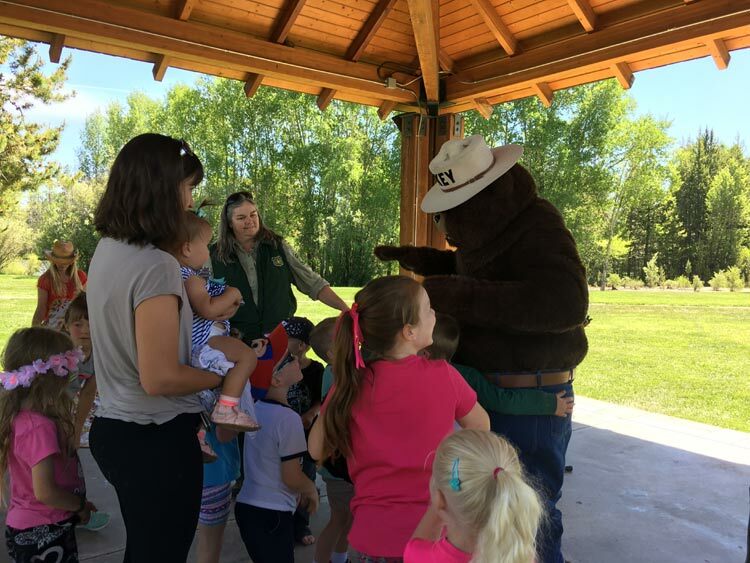 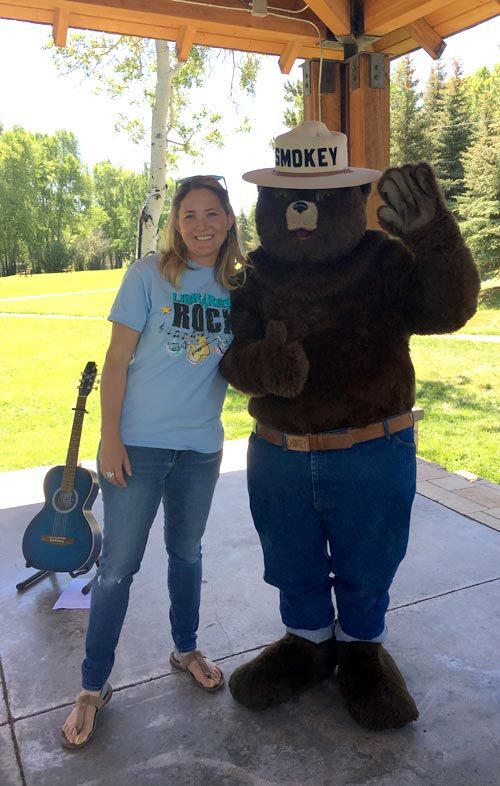 Our first storytime saw a visit from Smokey Bear. 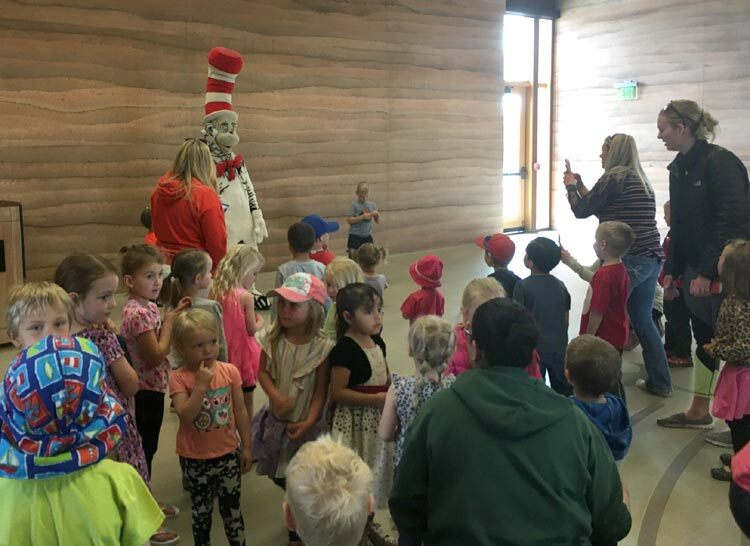 We also did a storywalk and had a dance party! 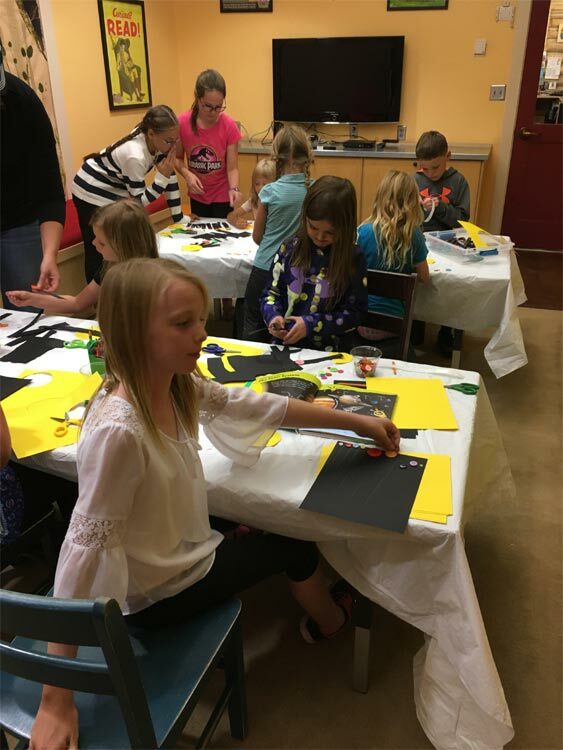 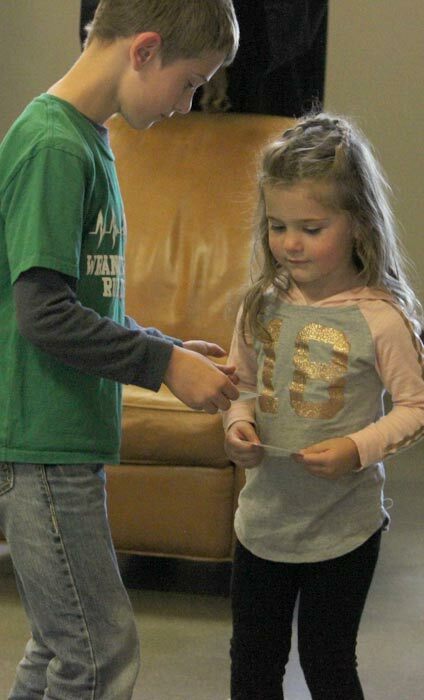 Every Friday elementary school aged kids were welcome to stop in to our MakerSpace where we get creative with all sorts of materials. 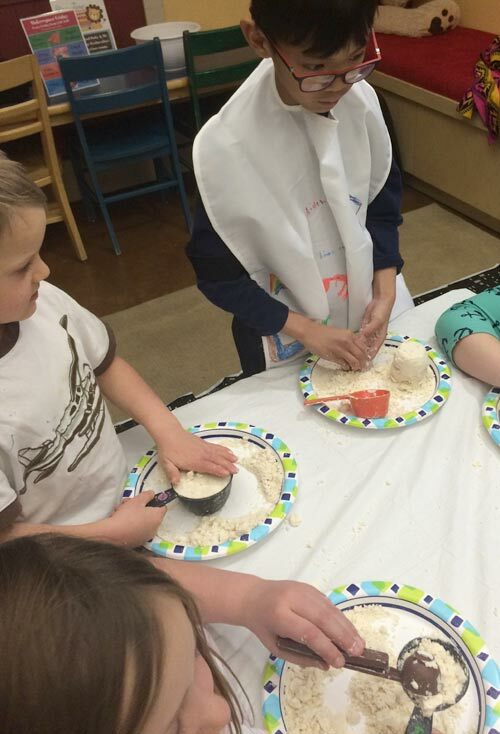 Recently we made cloud dough. 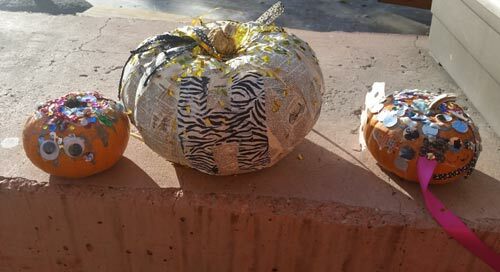 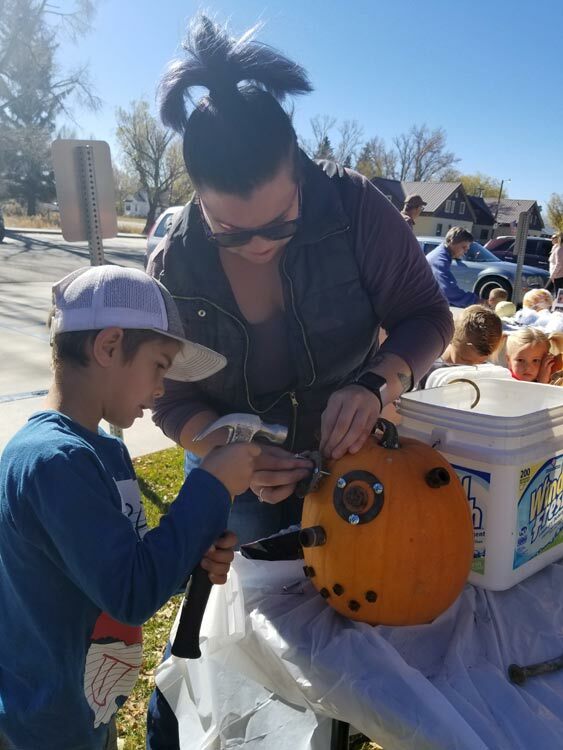 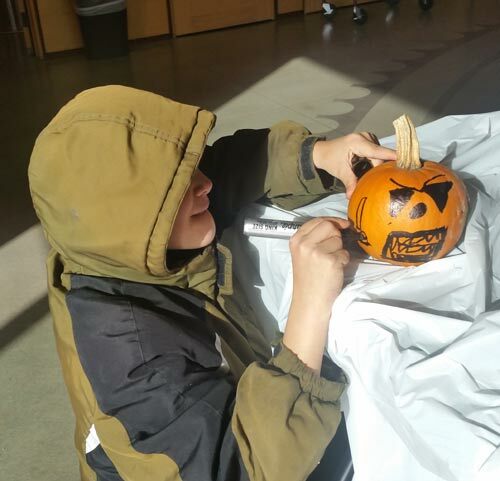 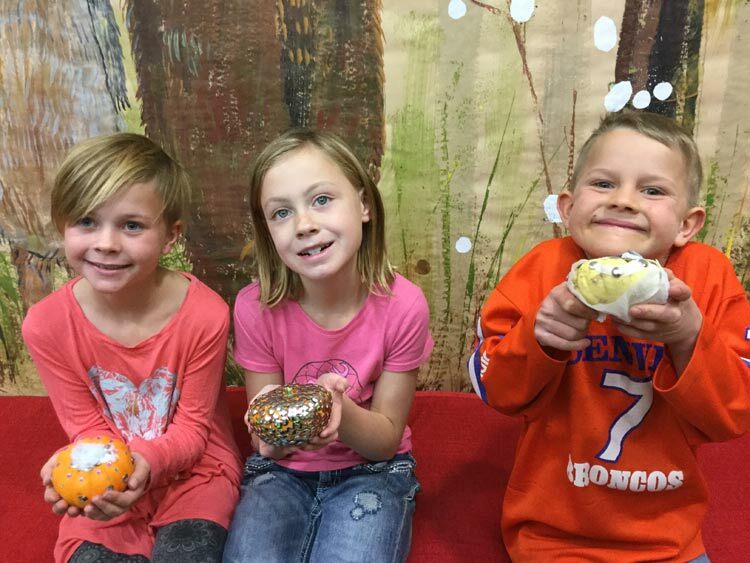 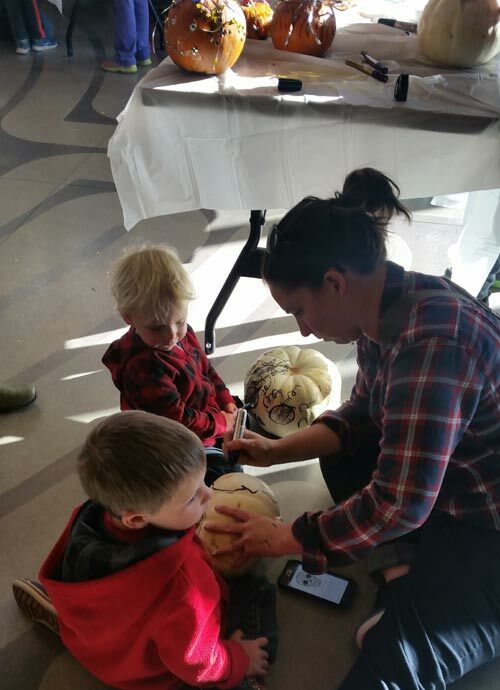 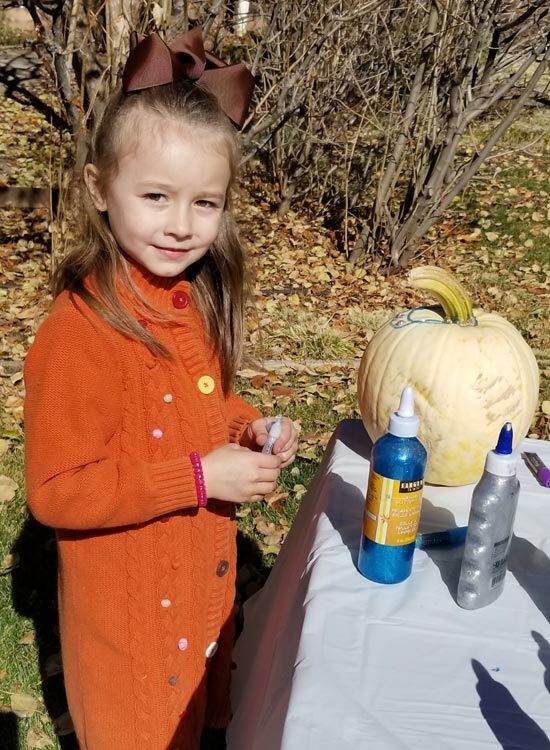 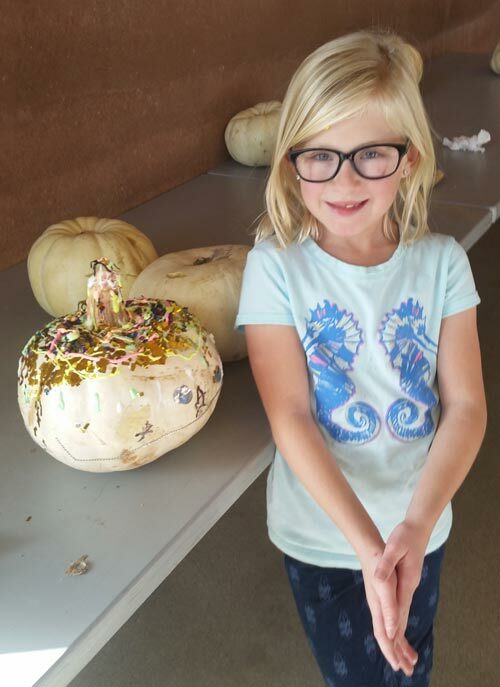 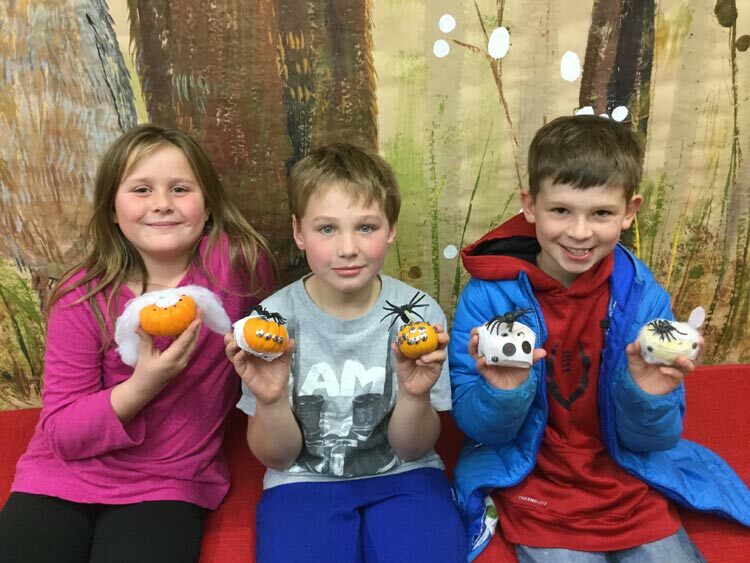 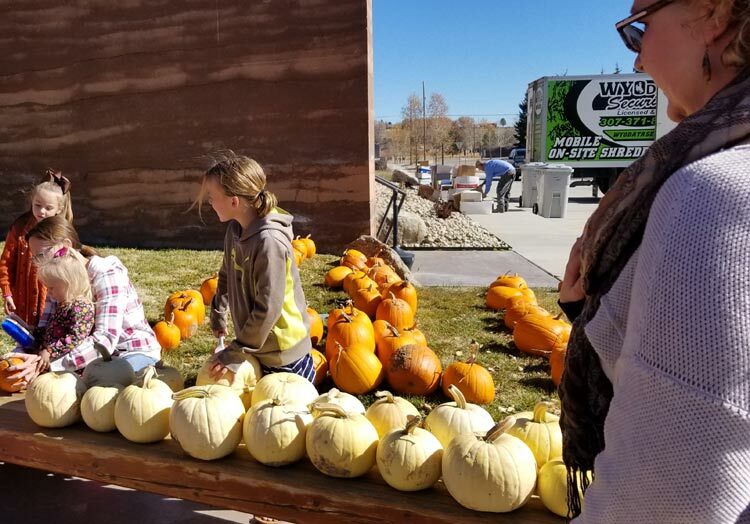 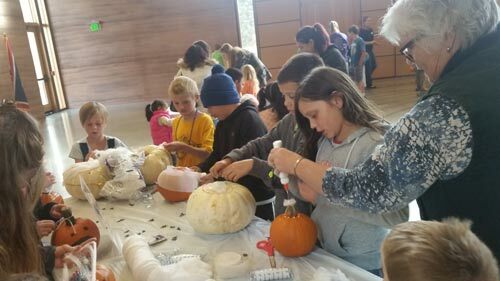 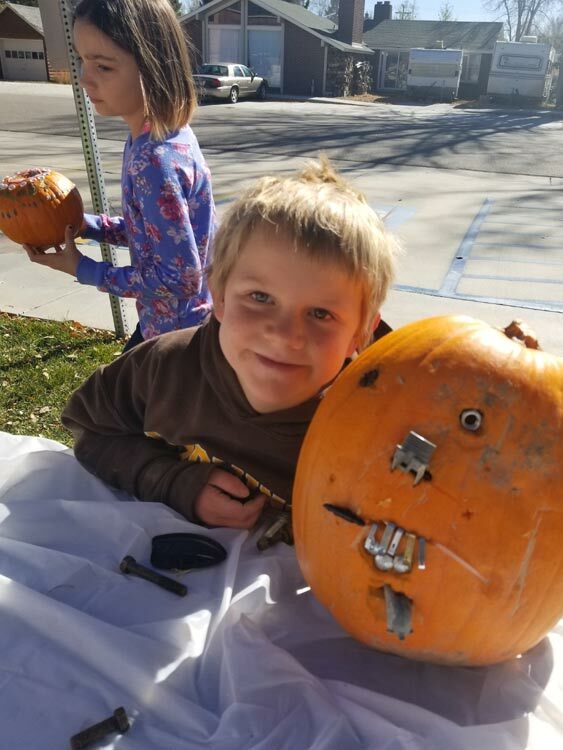 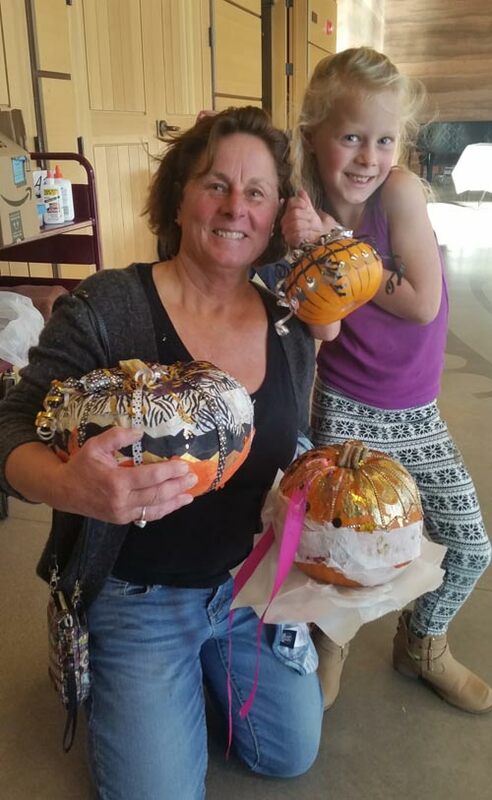 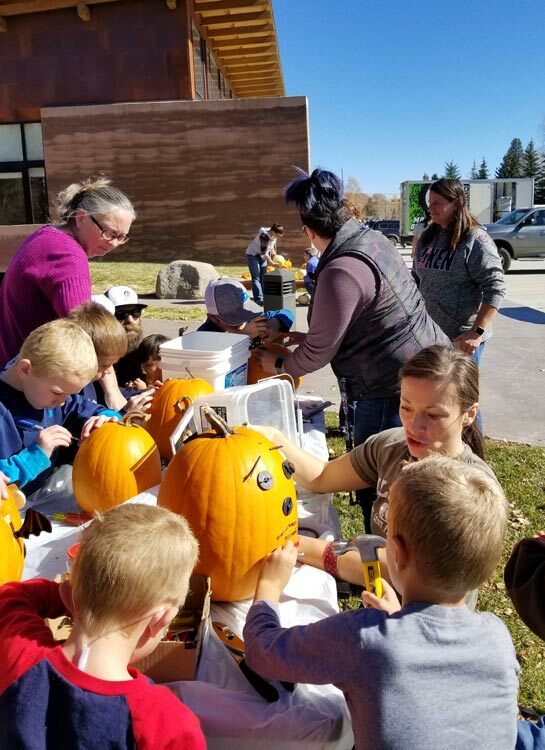 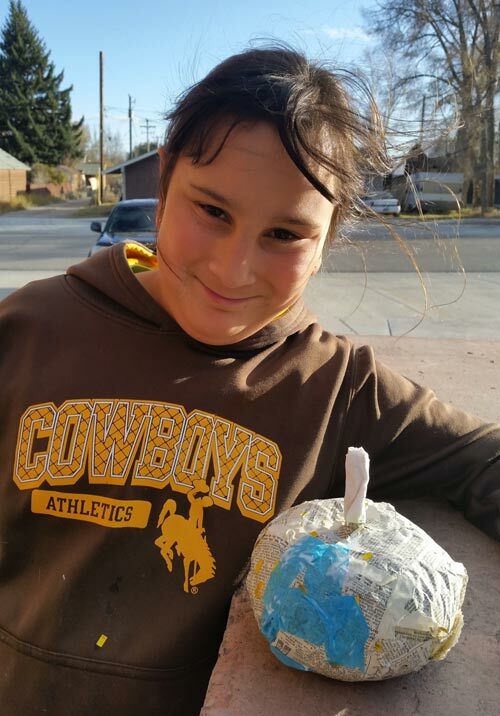 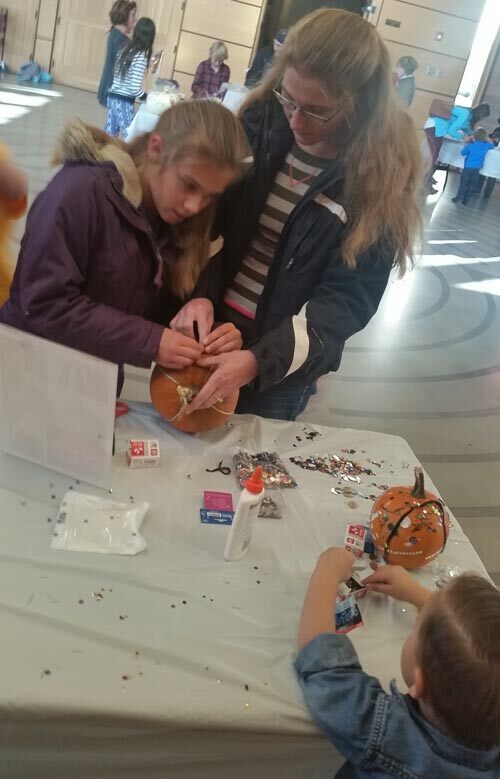 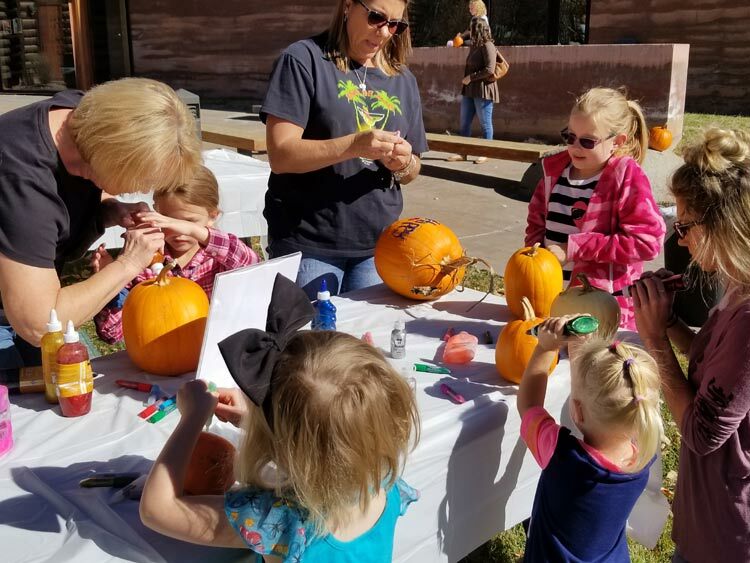 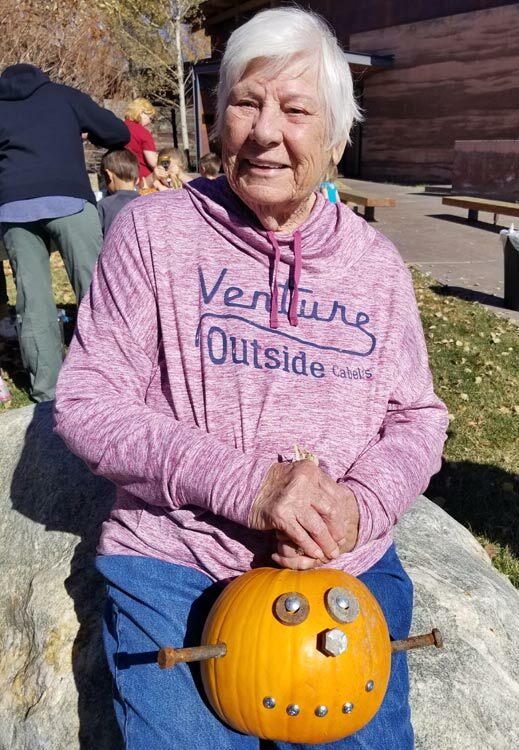 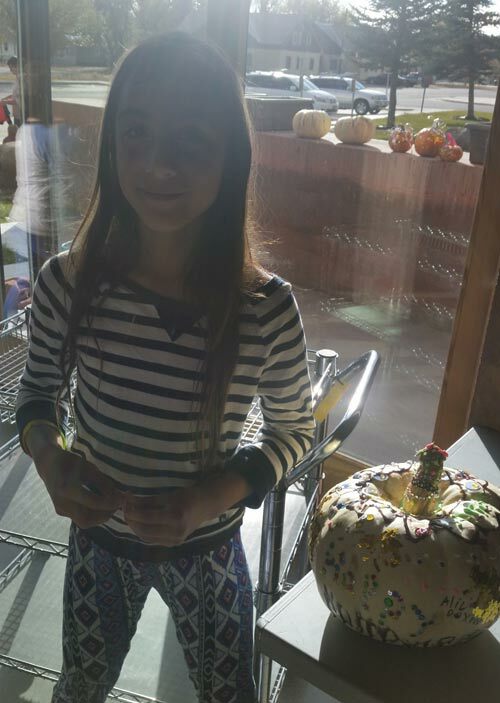 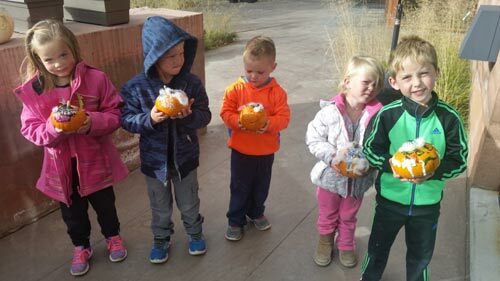 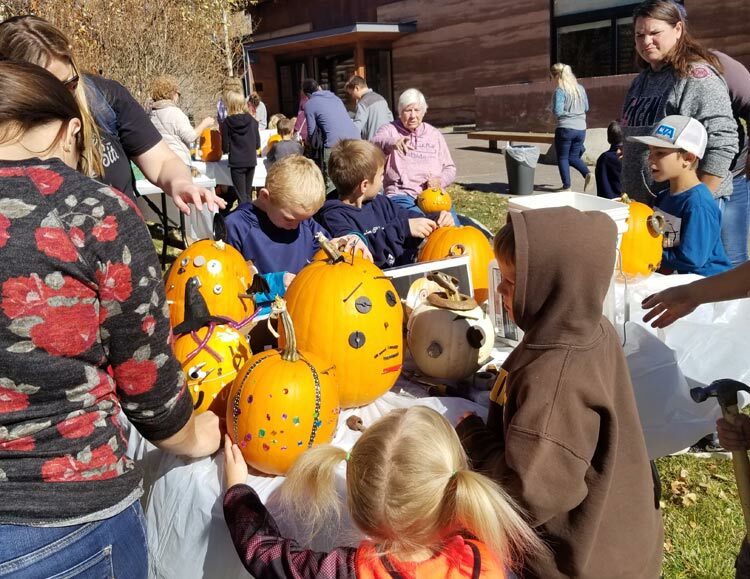 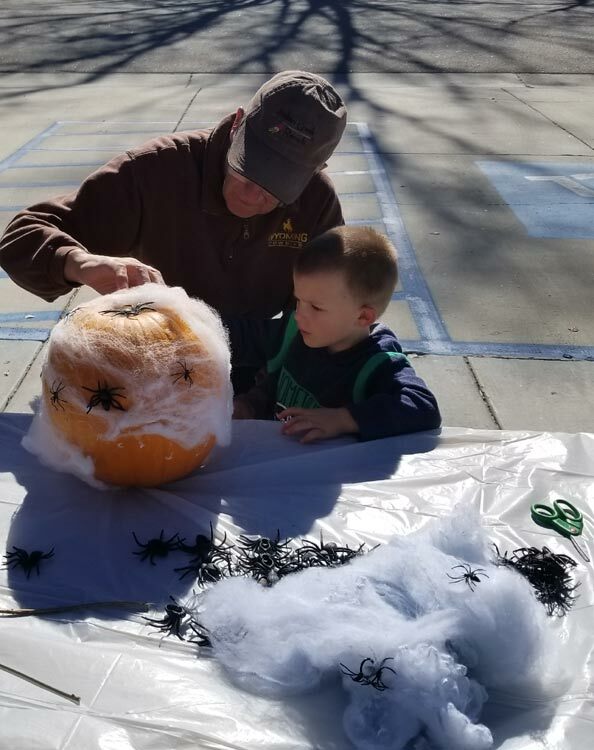 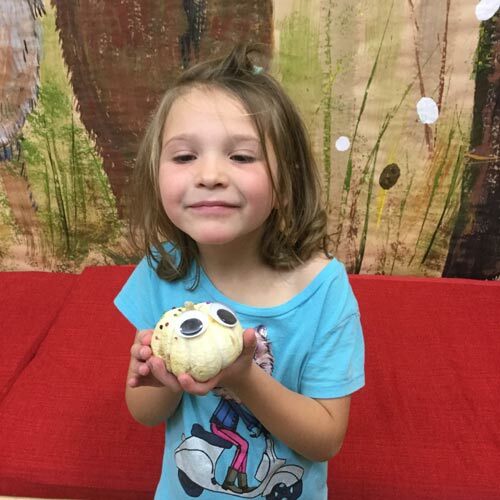 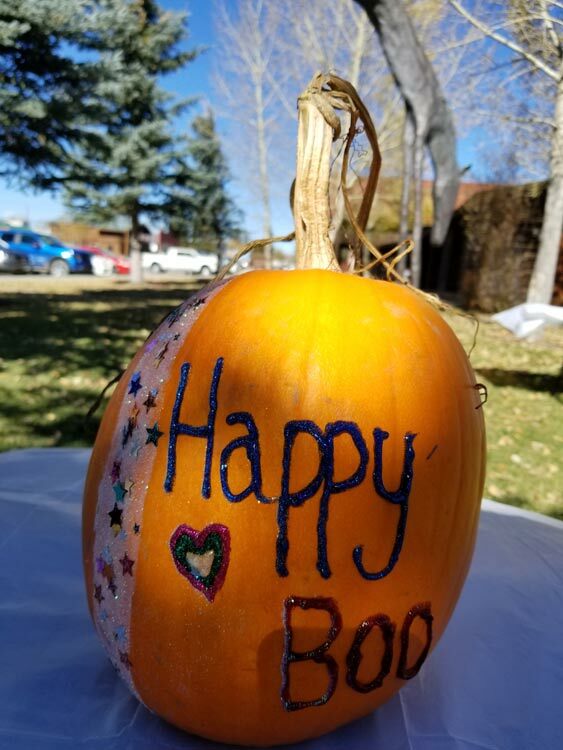 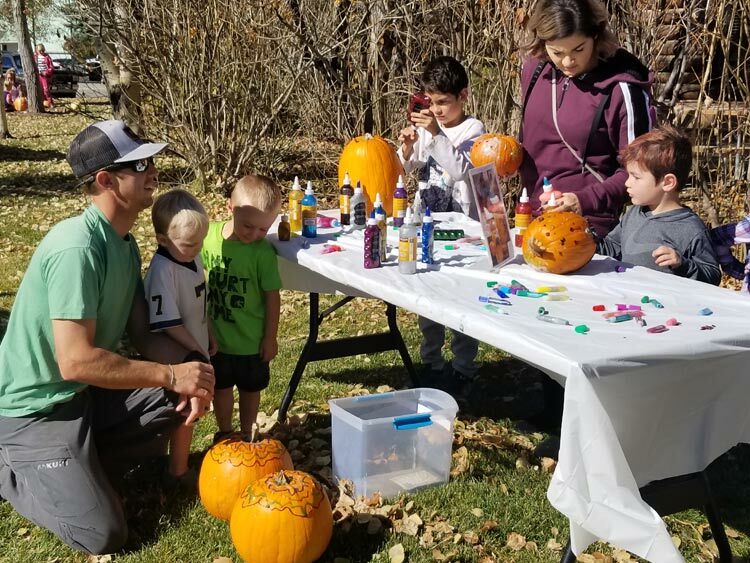 In mid October of 2017 we got into the autumn spirit by decorating free pumpkins and taking them home during our 3rd annual Pumpkin Decorating Day. 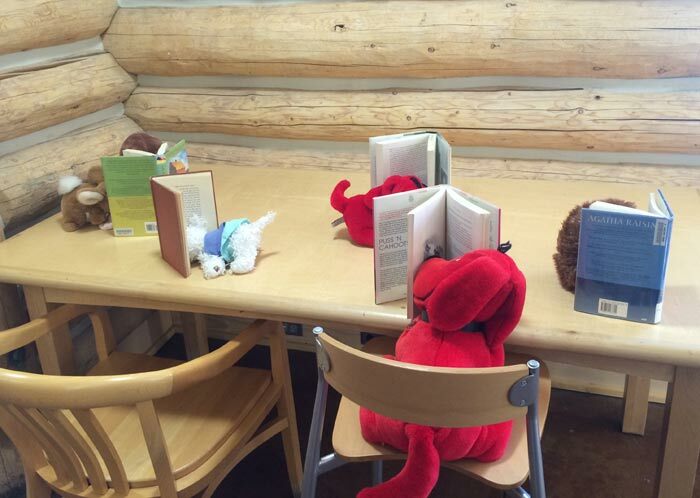 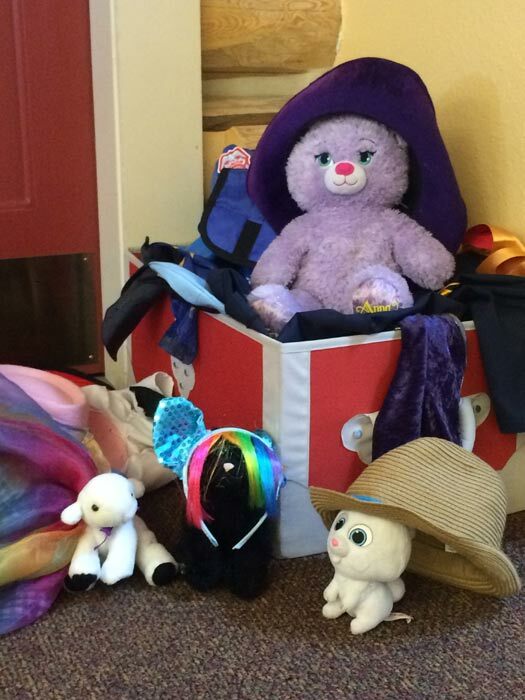 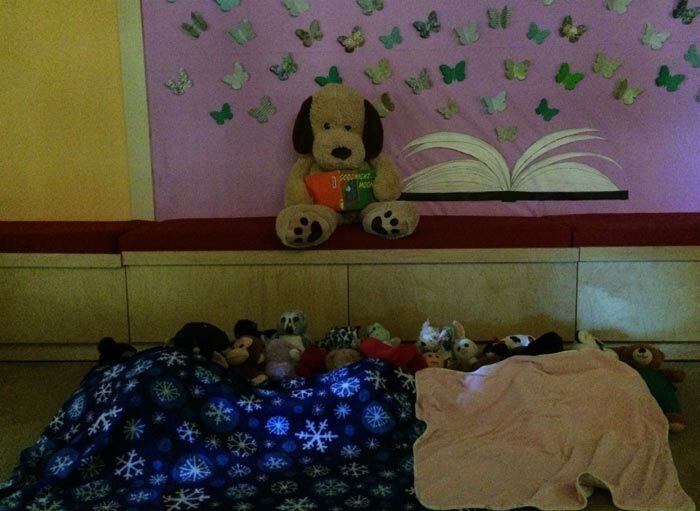 Story Time Stuffed Animal Sleepover 2017! 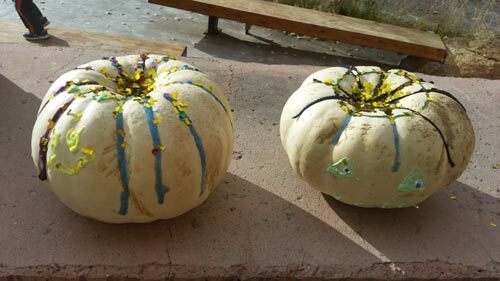 They made it through the night! 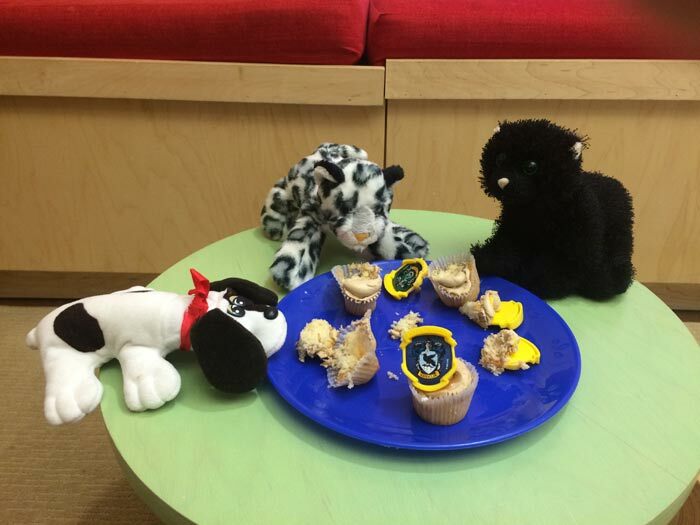 After reading to their heart's content, starting a rock band and playing Legos and trains, they got into the cupcakes. 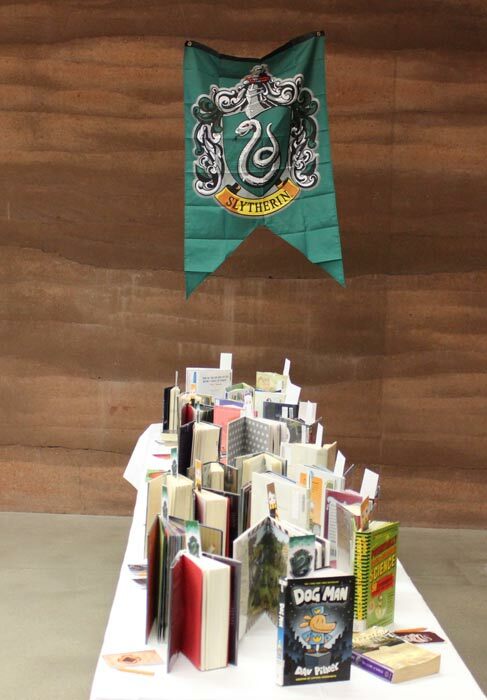 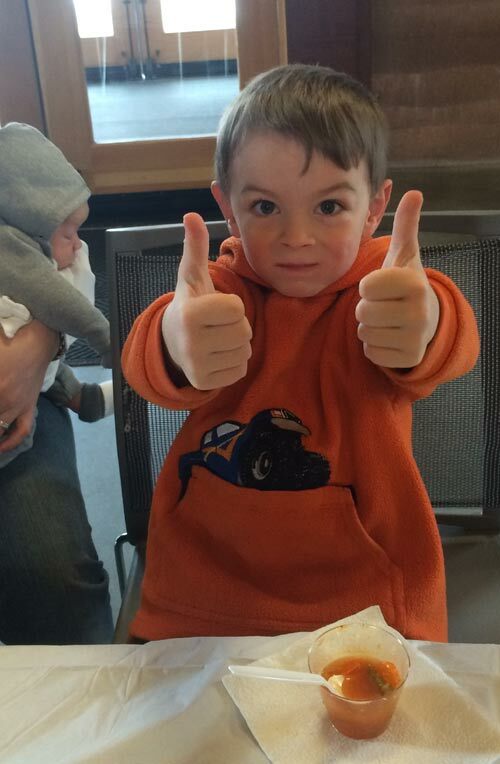 But we're impressed... 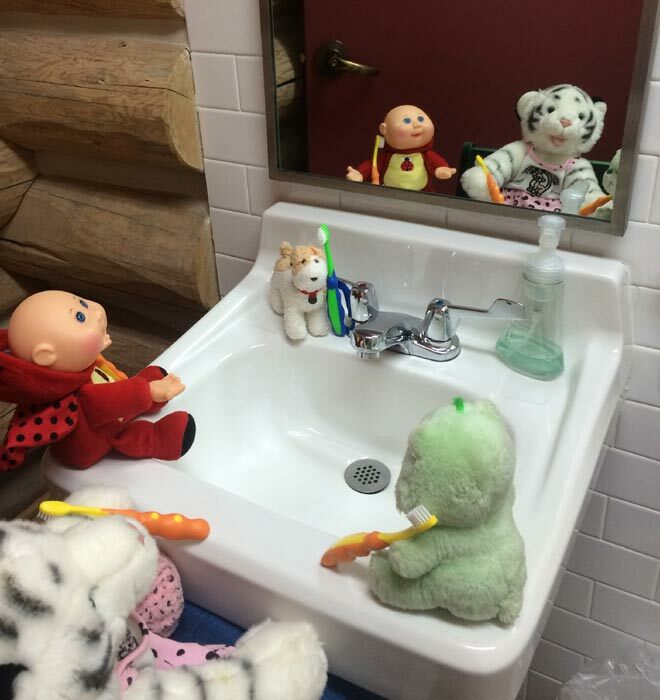 They took a bath, brushed their teeth, and had daddy dog read them Goodnight Moon. 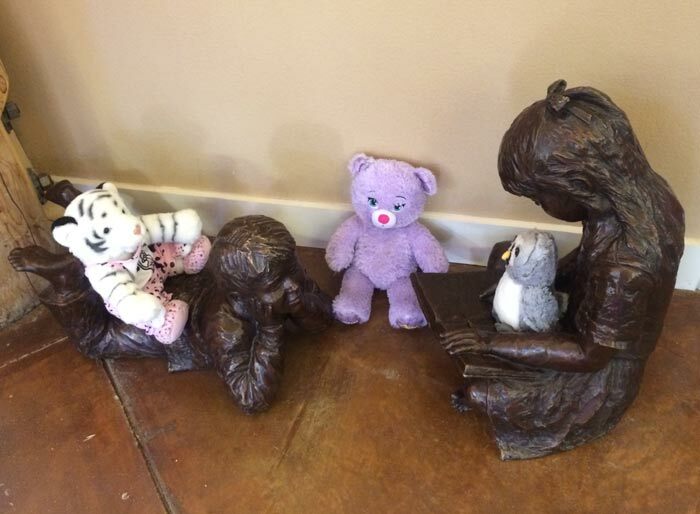 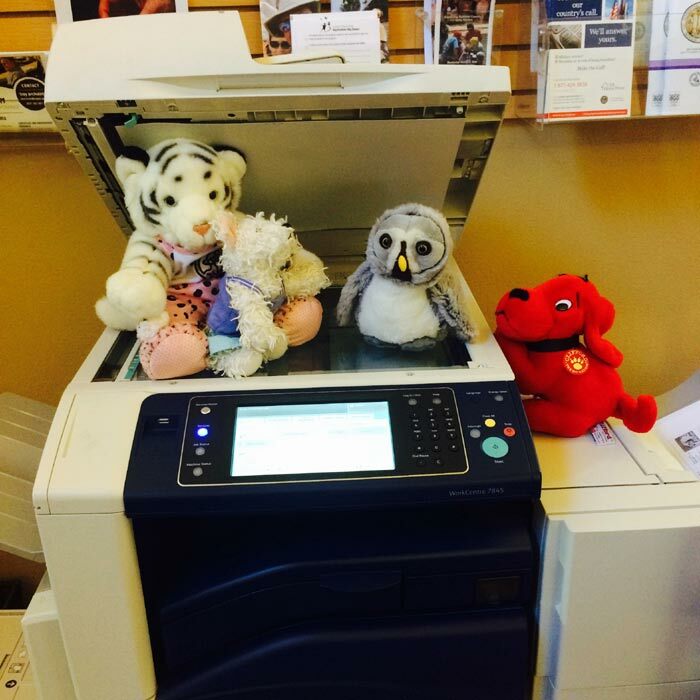 They finally drifted off to sleep in the wee hours of the morning... all except for Owlie.